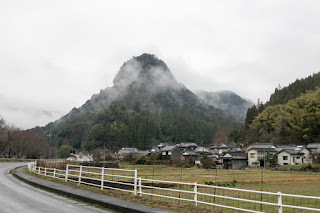 Hitotsuto Castle (一ツ戸城) is built over an impressive rock of Shiroyama mountain, which is surrounded by Yamakuni-gawa river and two small tributaries. 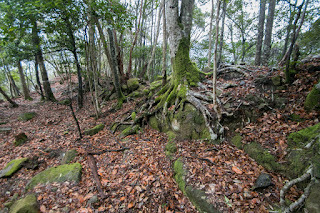 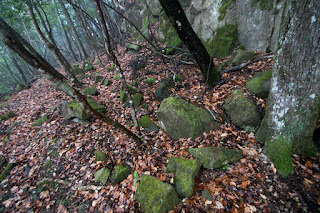 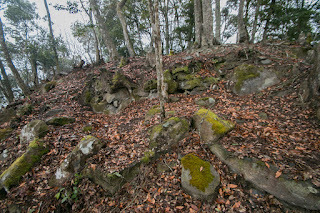 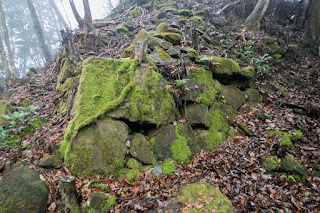 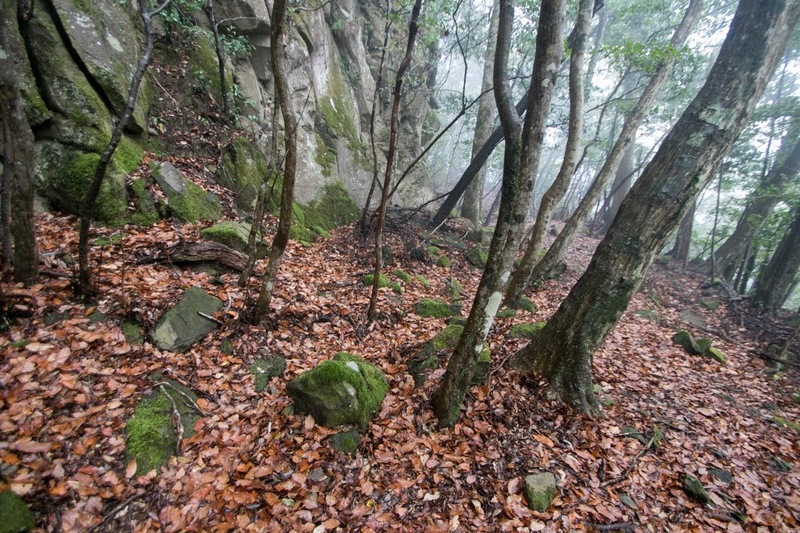 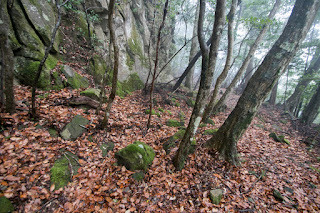 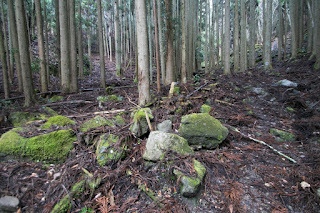 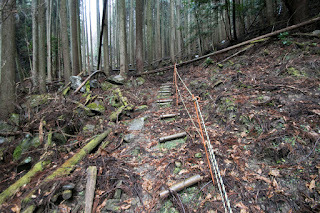 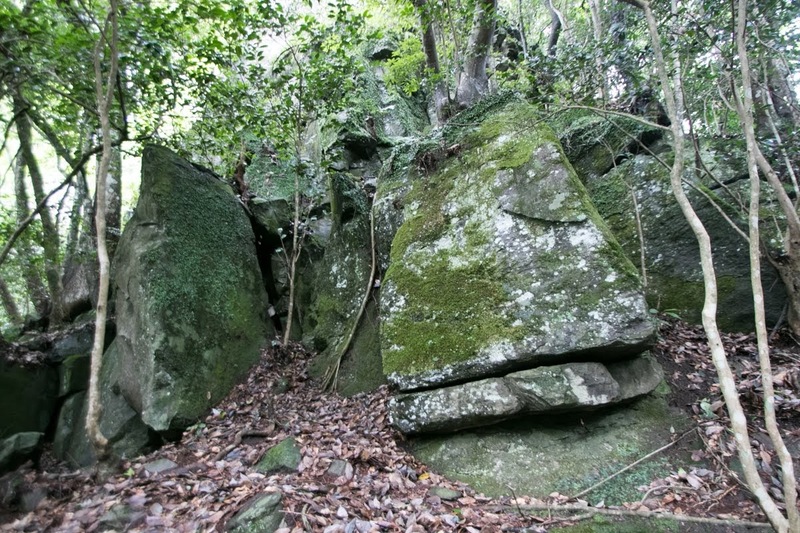 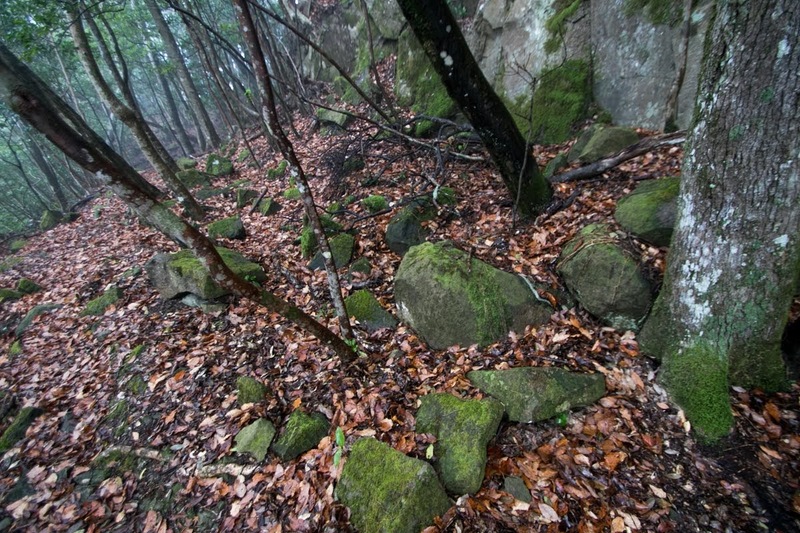 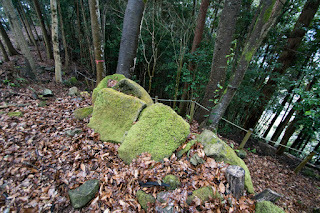 Yamakuni-gawa which runs Nakatsu-plain separates into many tributaries at its upstream and forms many beautiful valley decorated with powerful and impressive rocks totally called as Yabakei. Castle site is nearly at the south border of this valley, and was praised its impressive scenery by Sanyo Rai (1780-1832), a scholar and poet of Edo era. 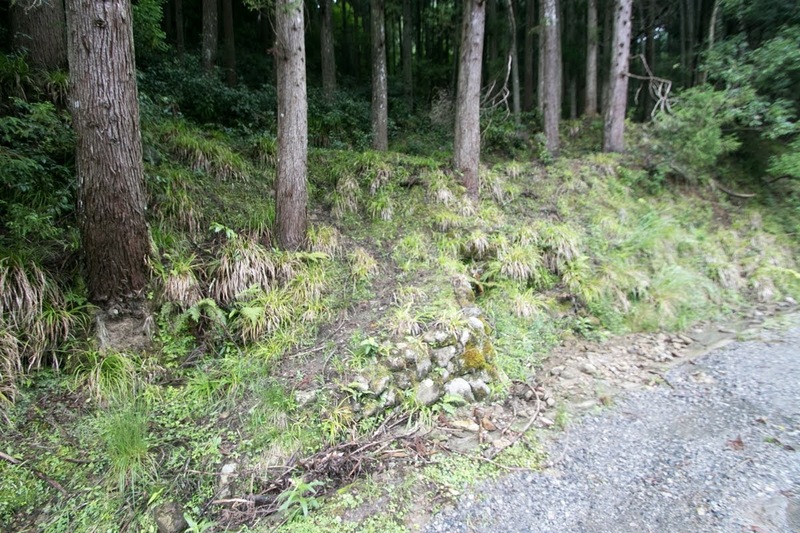 Yabakei area is also a connecting road between Nakatsu area and Hita area. 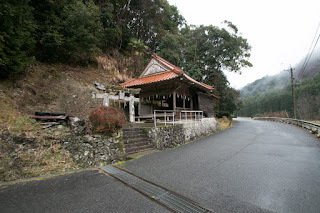 Nakatsu plain is a developed area from ancient era by cultivation and inner-sea transportation at Seto-Naikai sea, and prospered with traditional Usa Shrine. 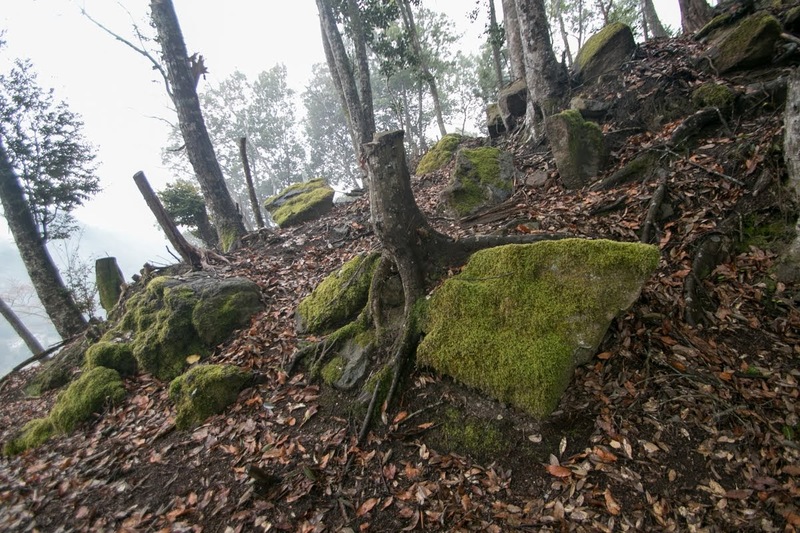 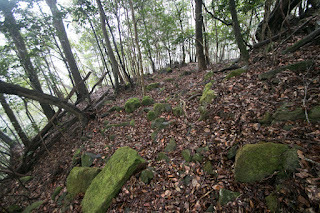 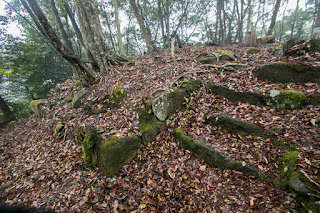 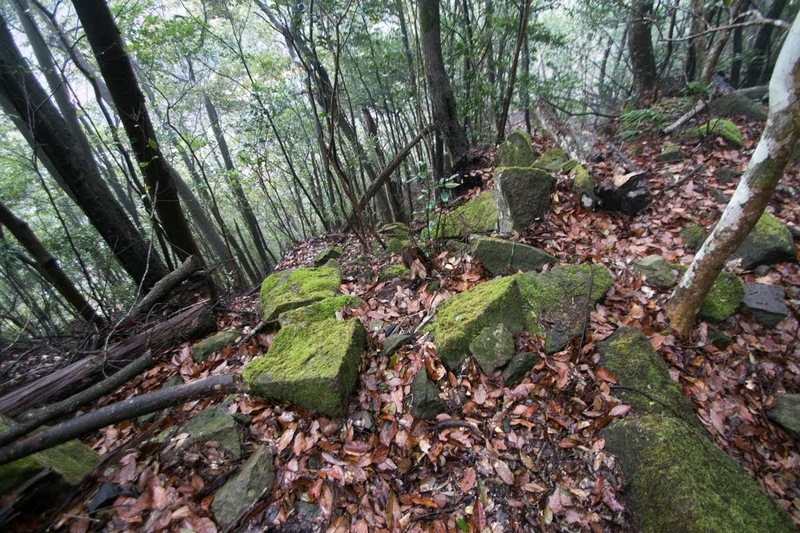 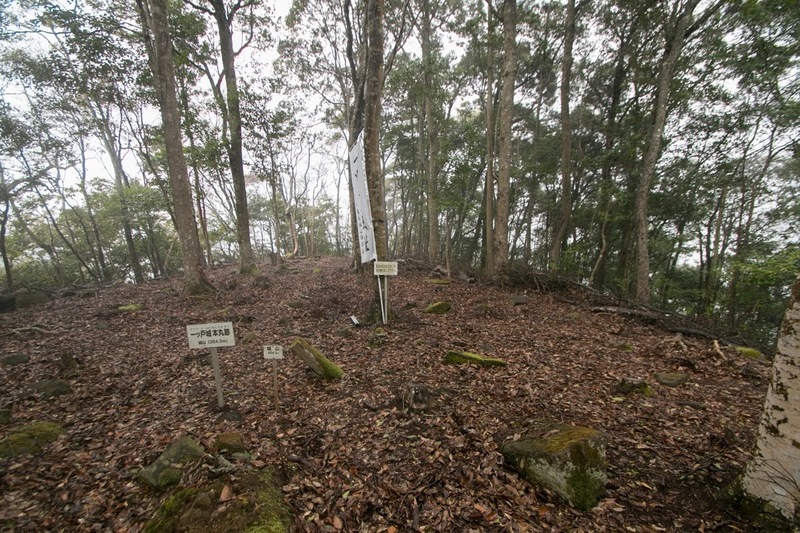 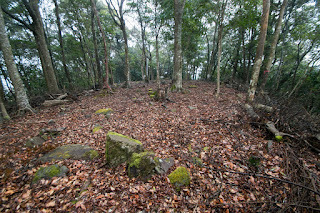 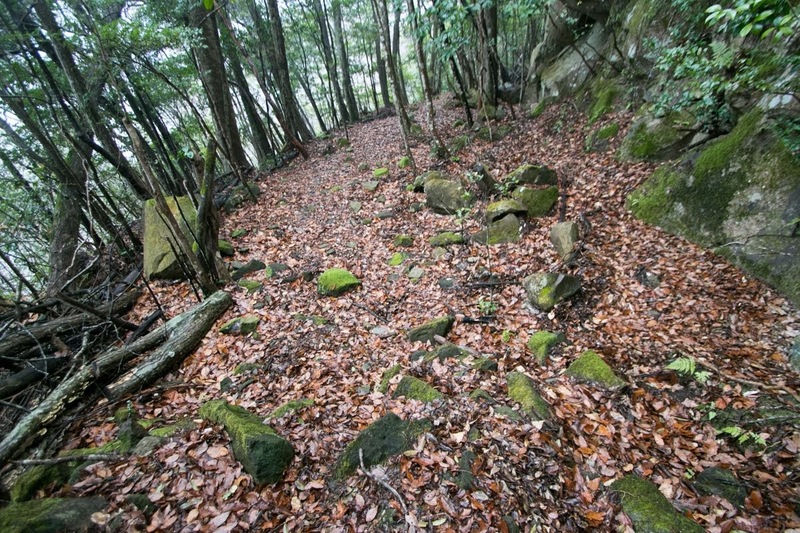 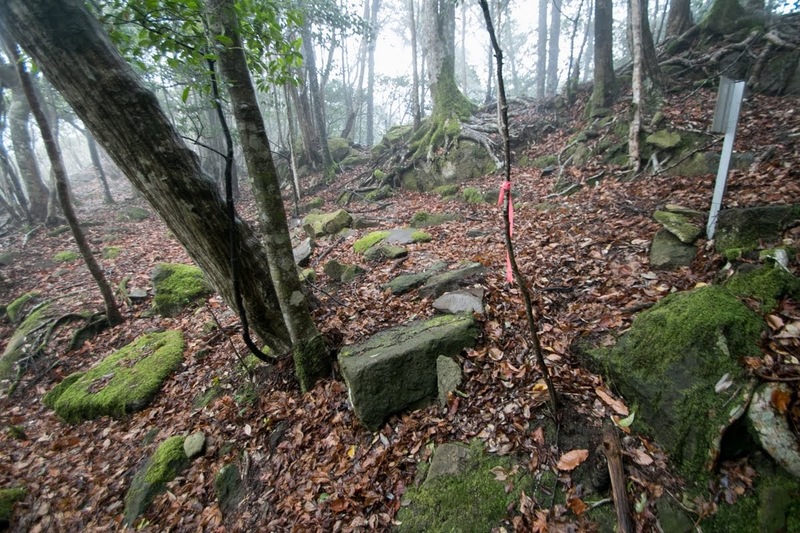 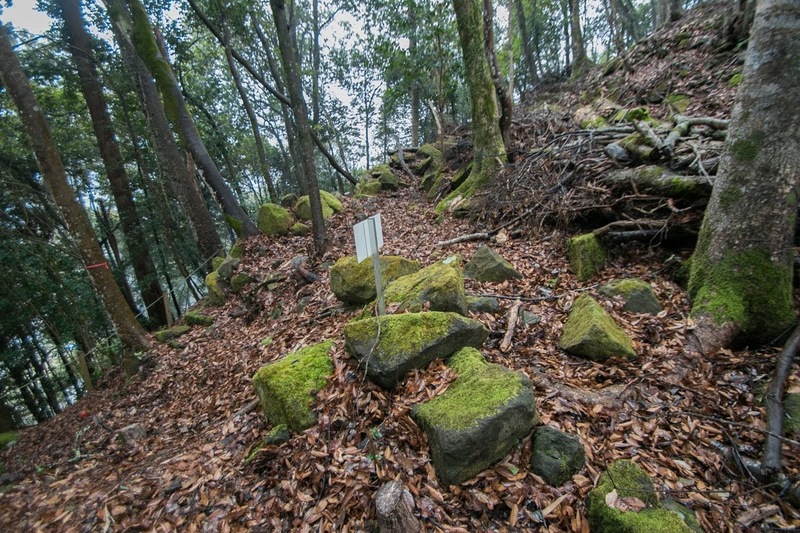 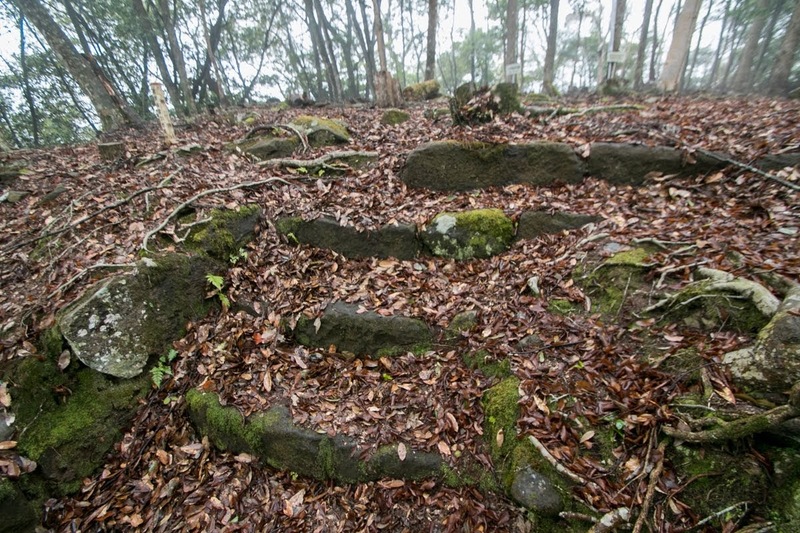 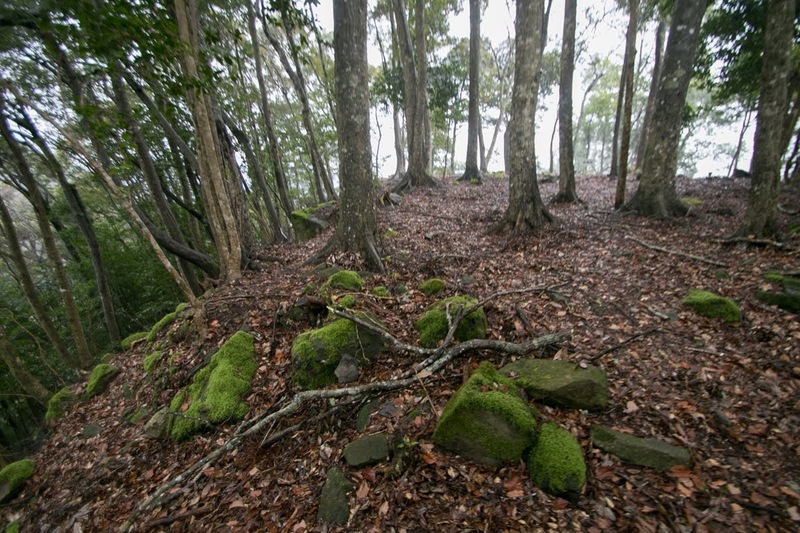 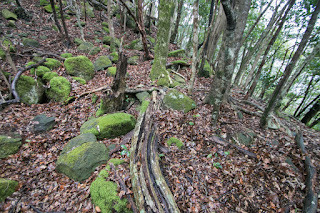 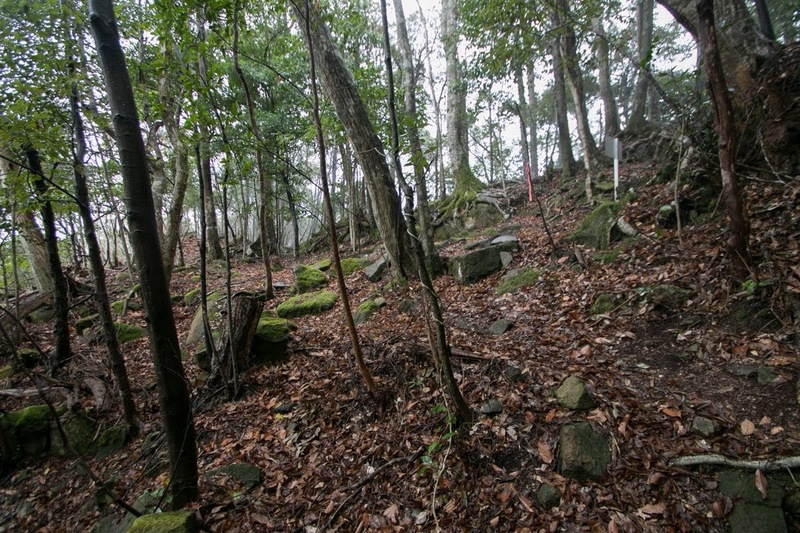 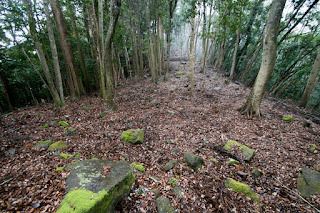 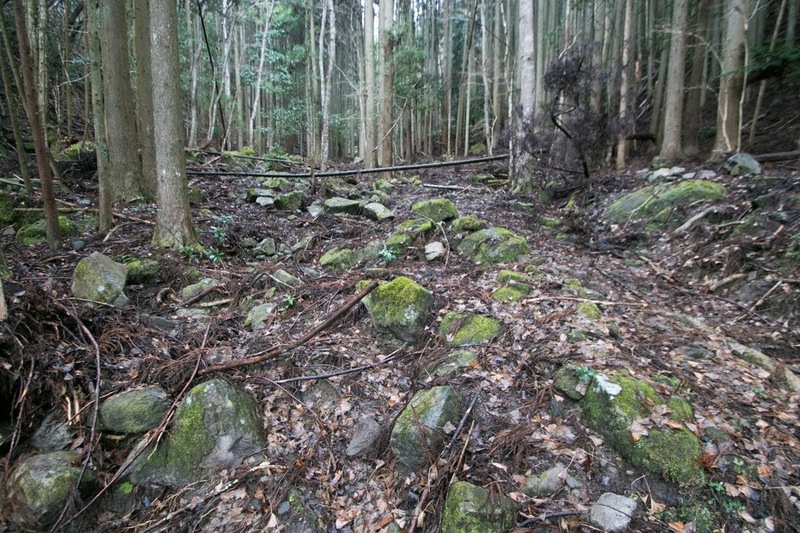 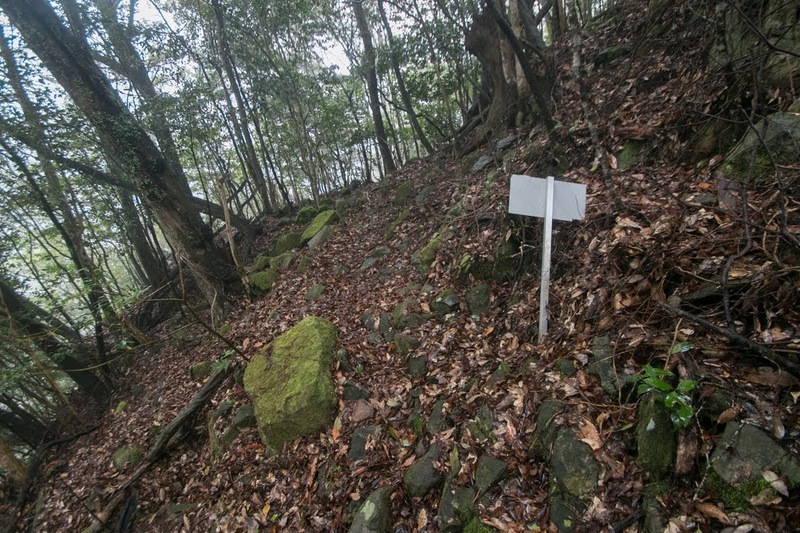 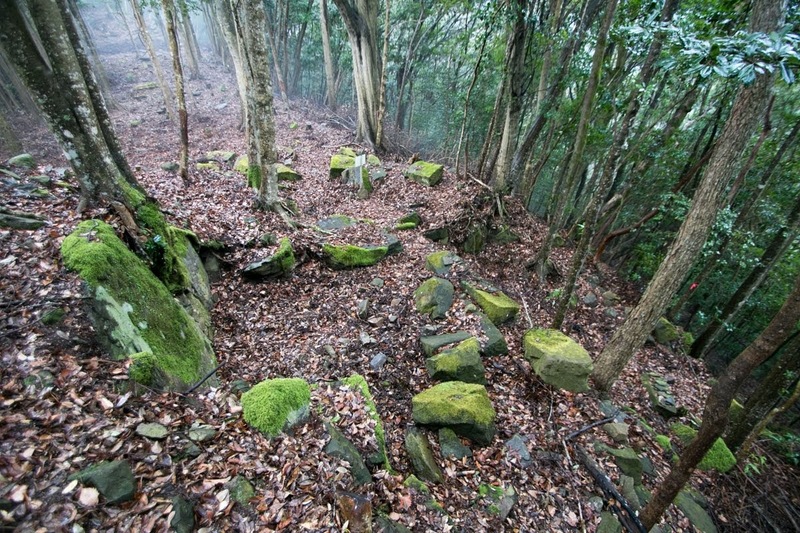 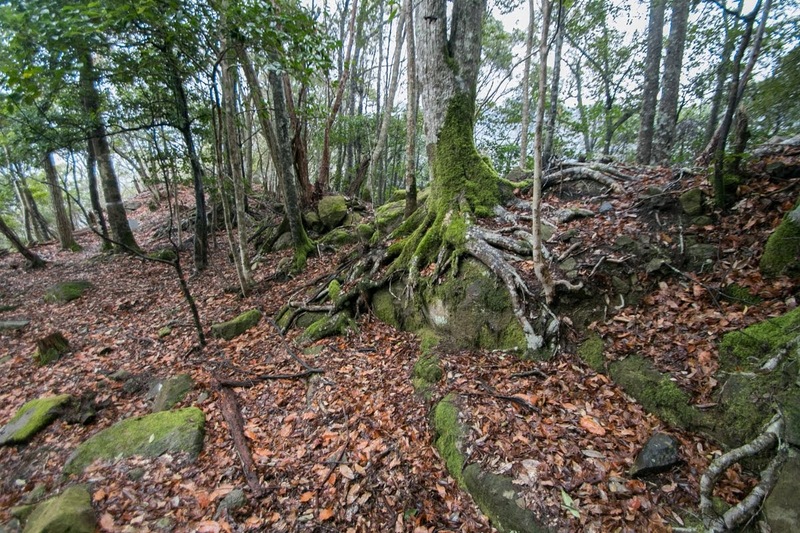 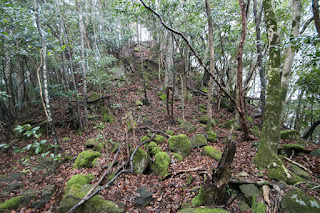 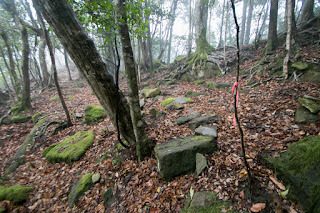 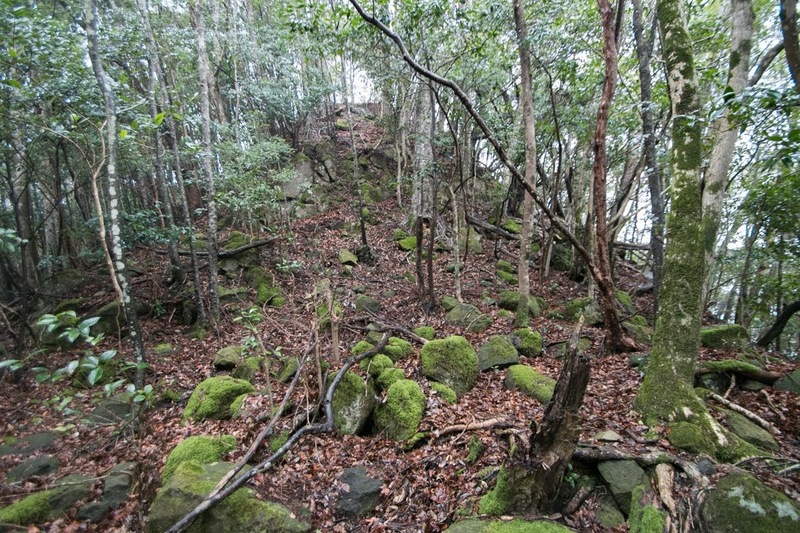 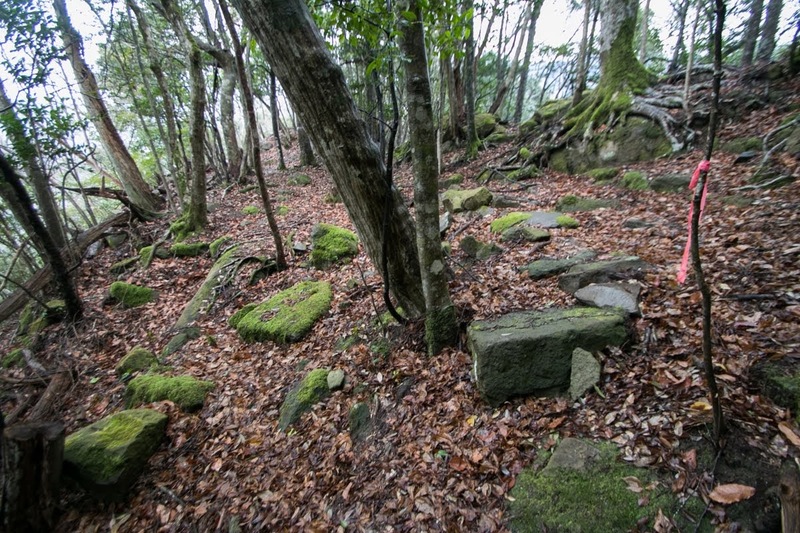 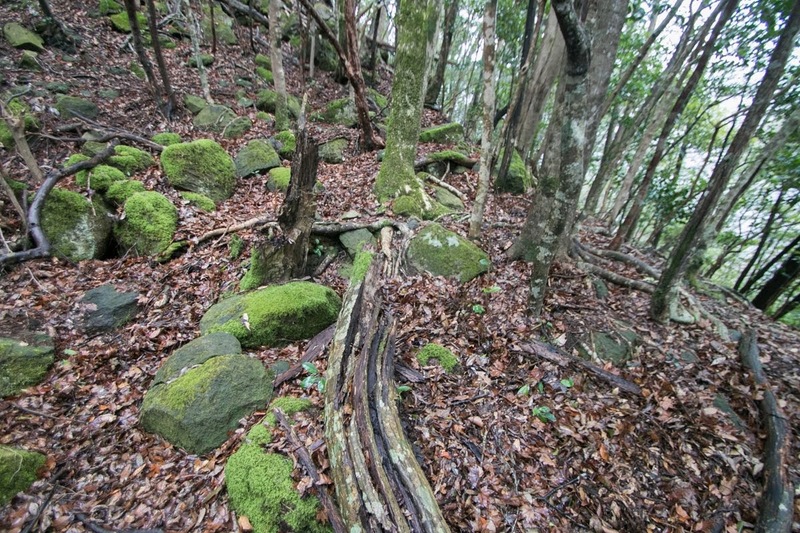 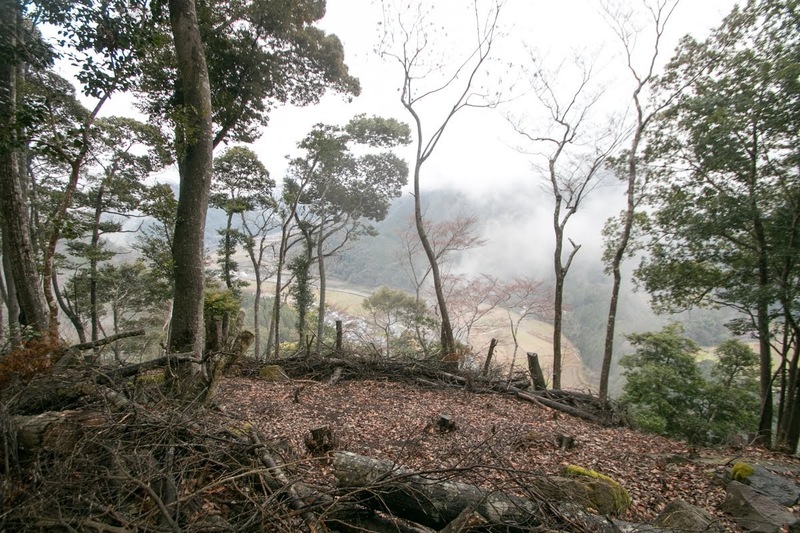 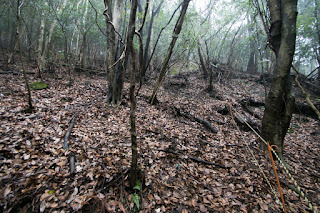 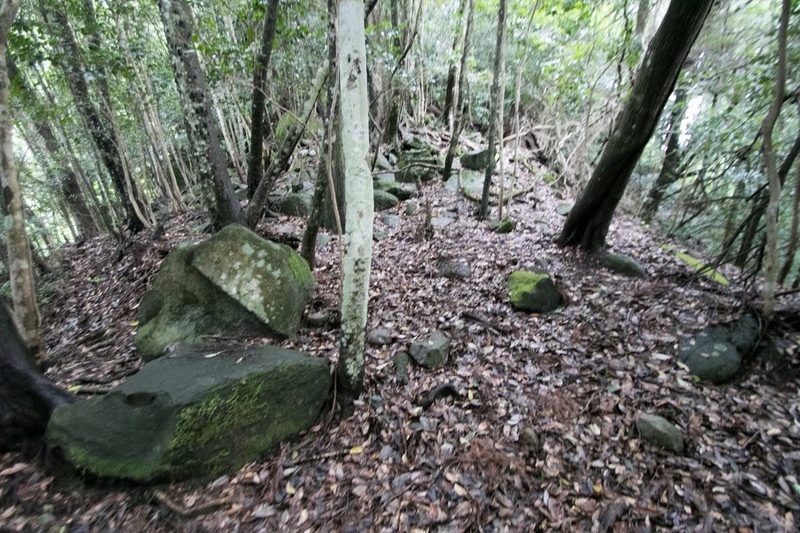 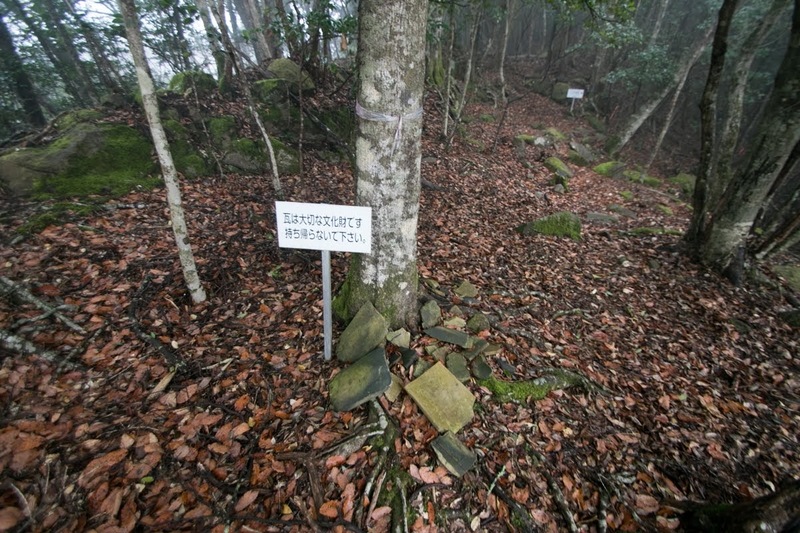 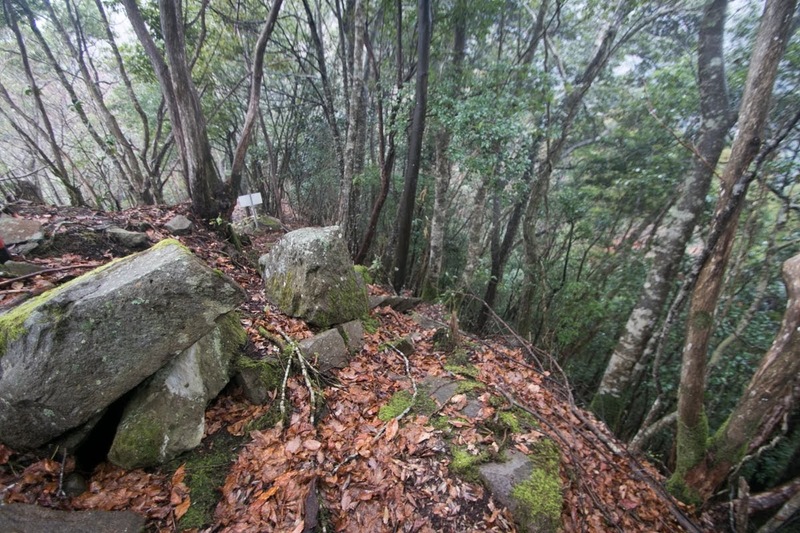 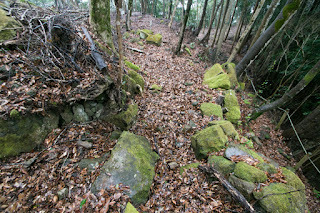 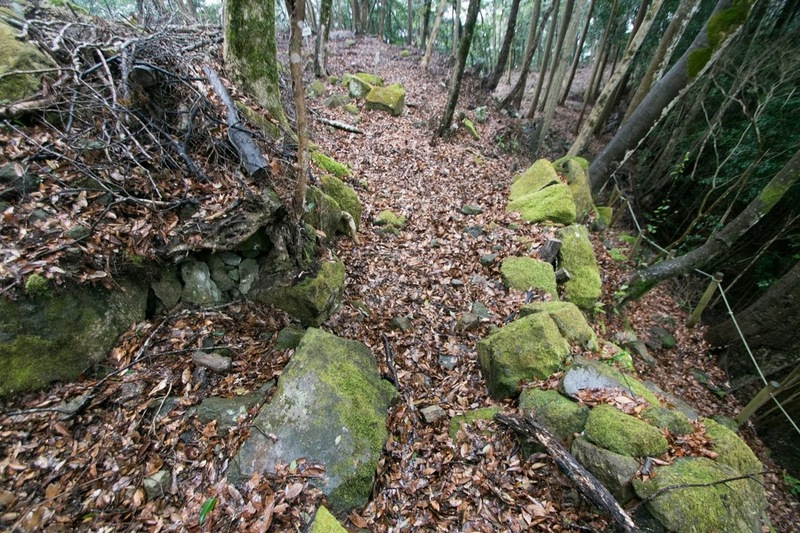 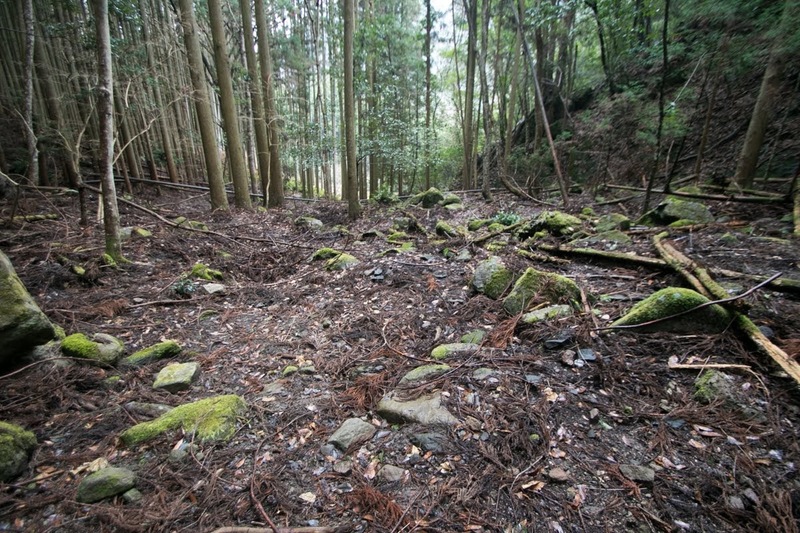 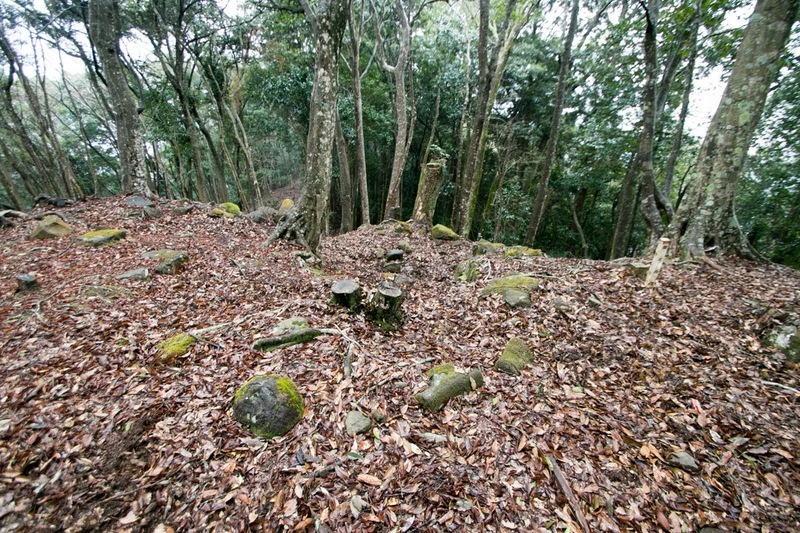 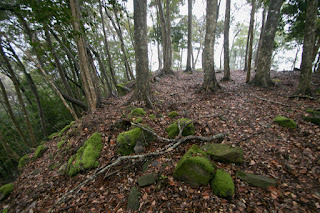 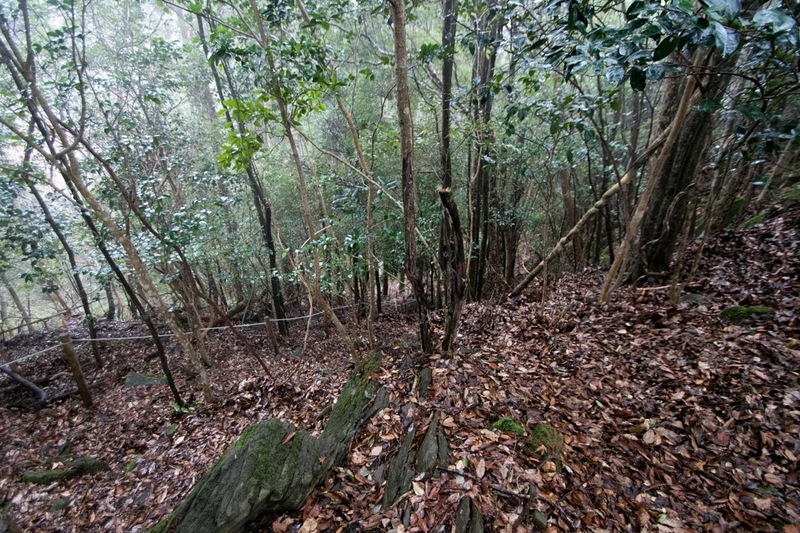 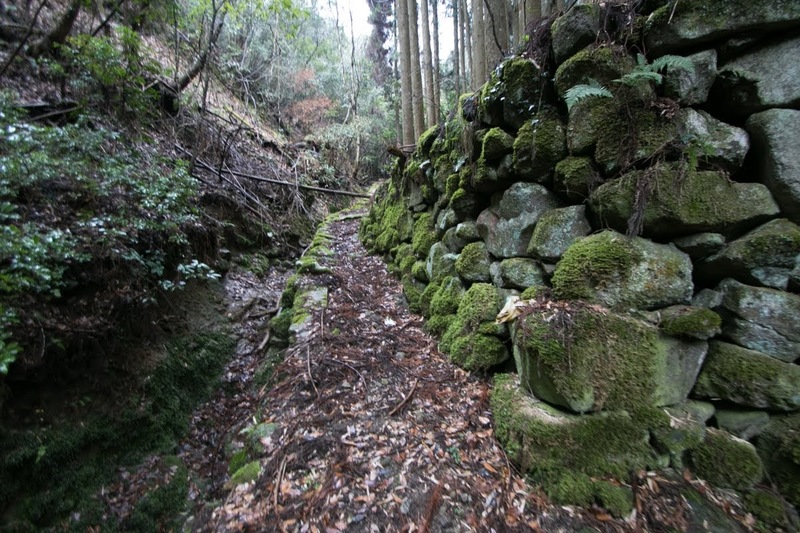 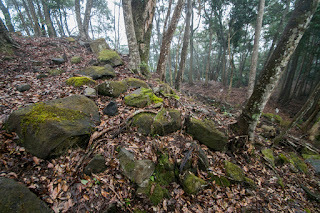 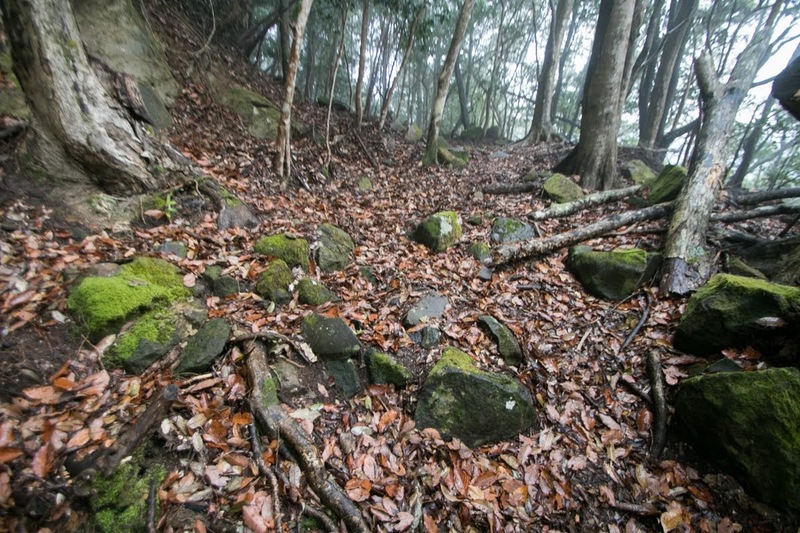 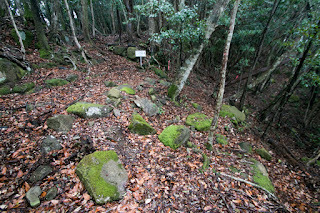 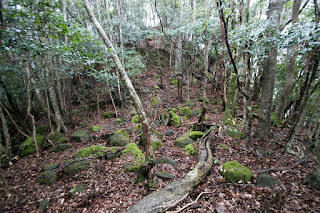 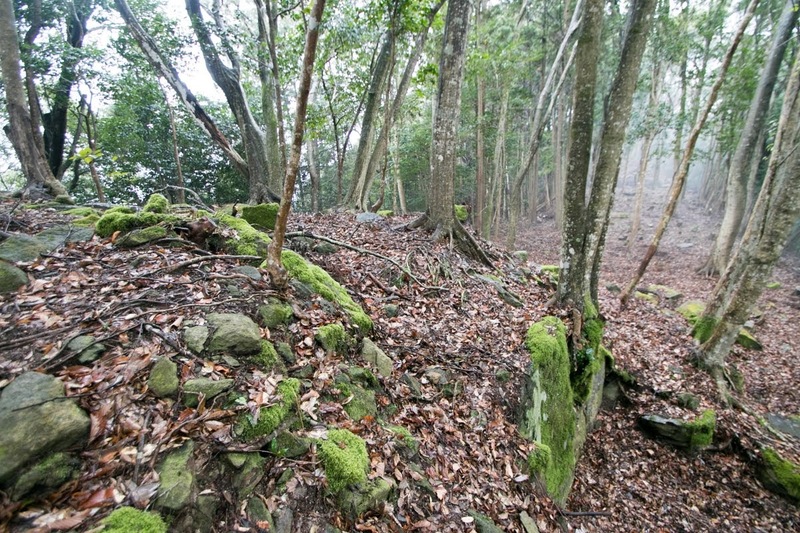 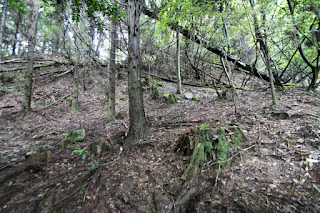 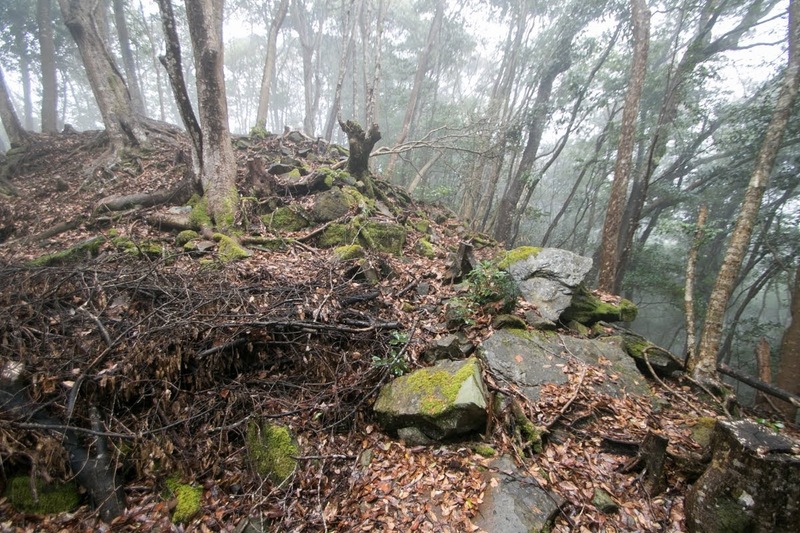 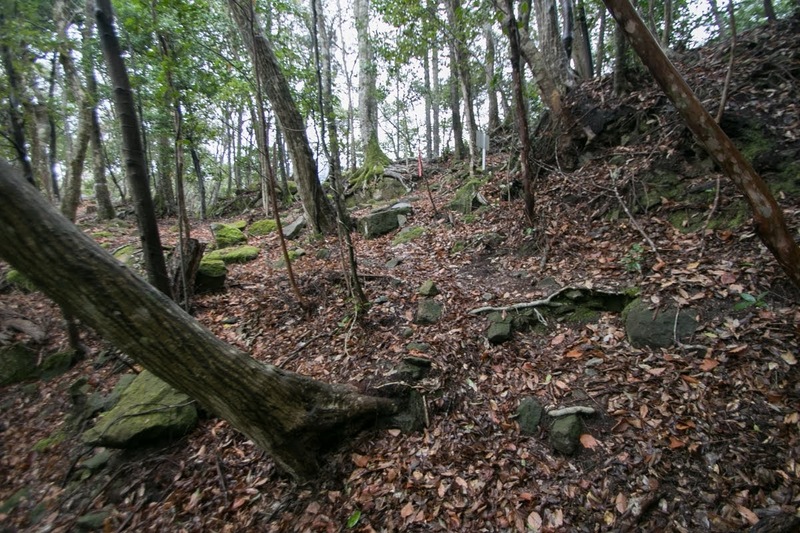 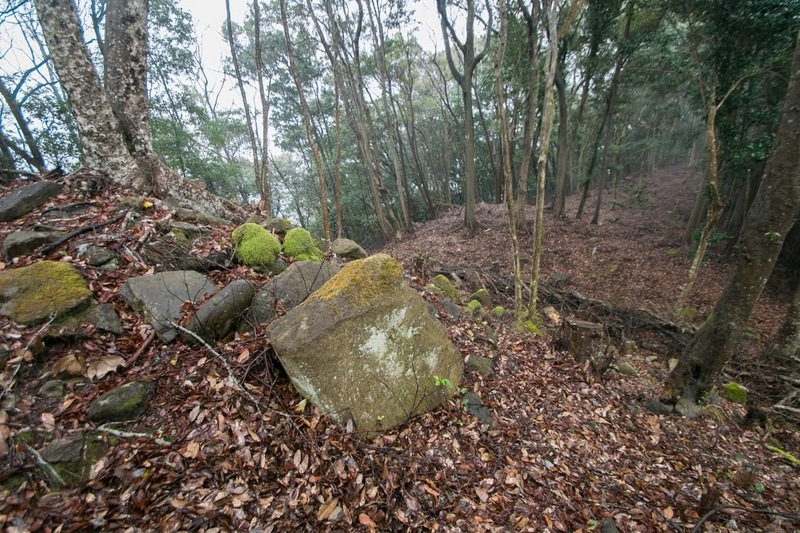 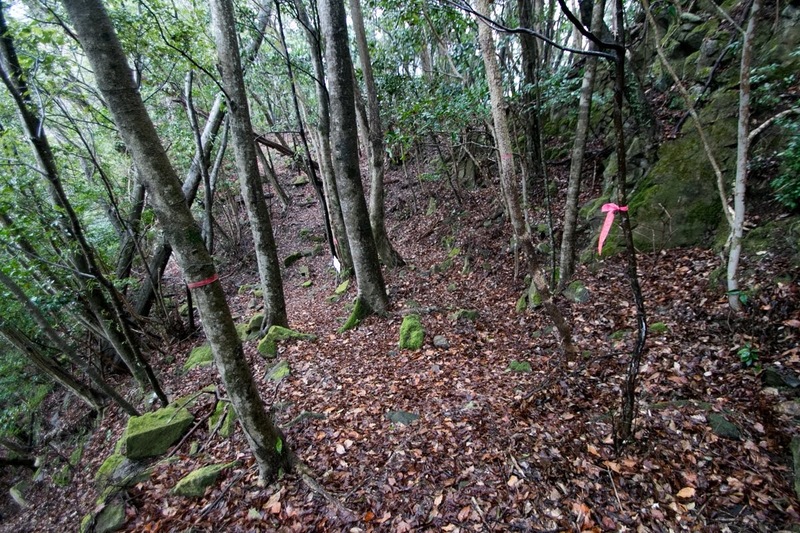 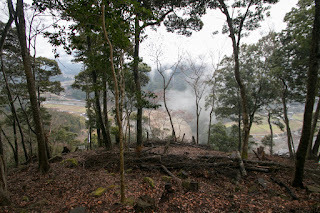 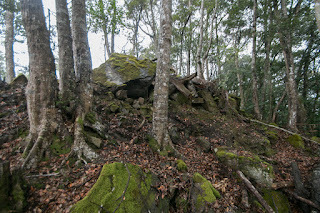 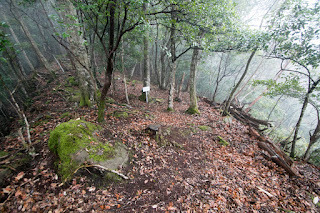 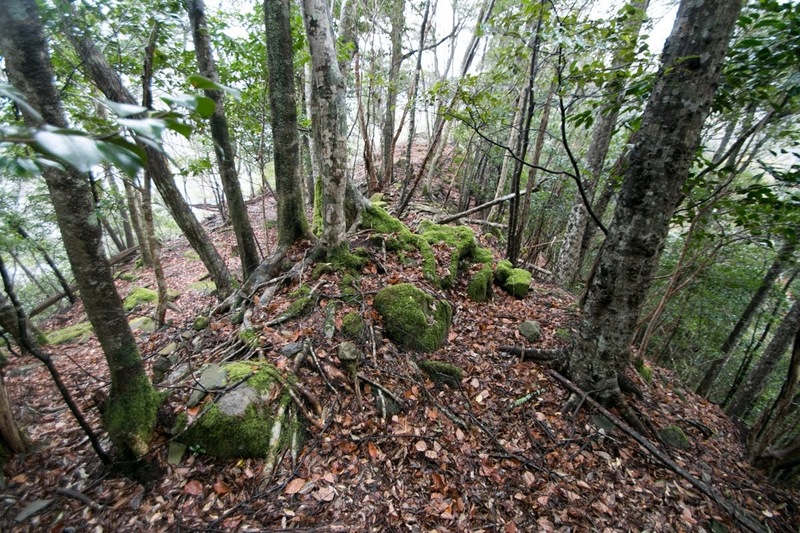 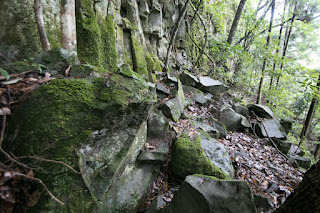 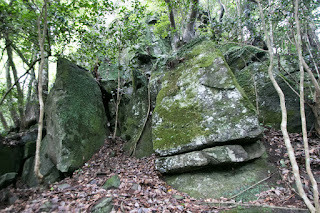 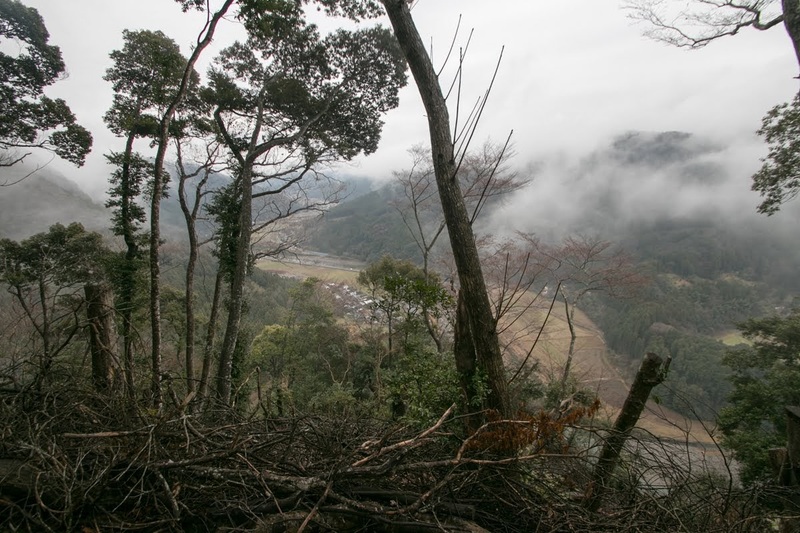 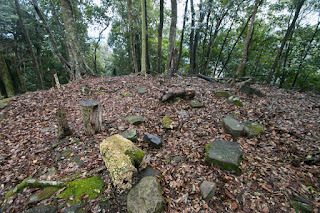 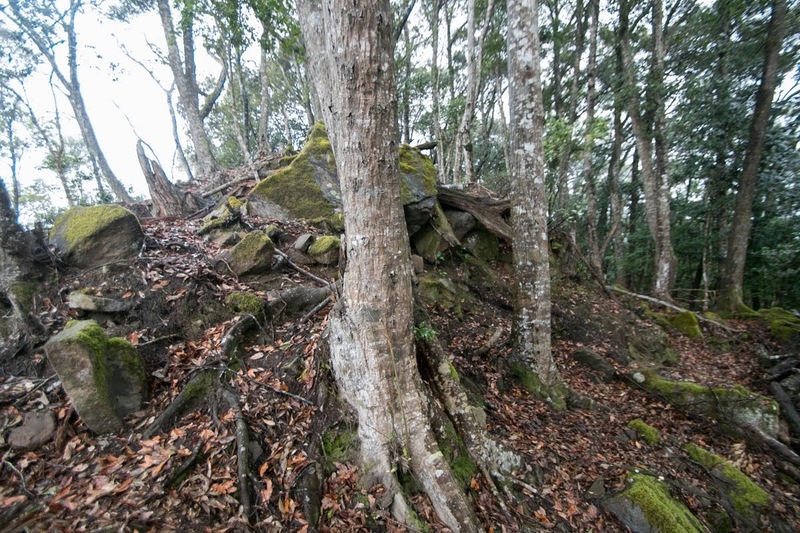 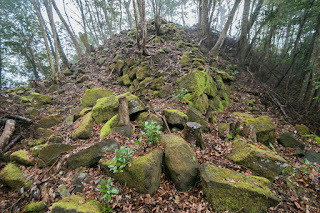 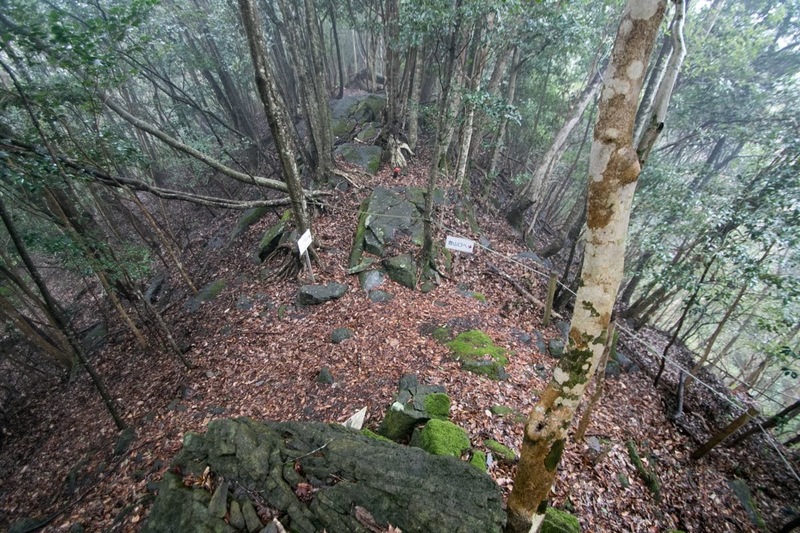 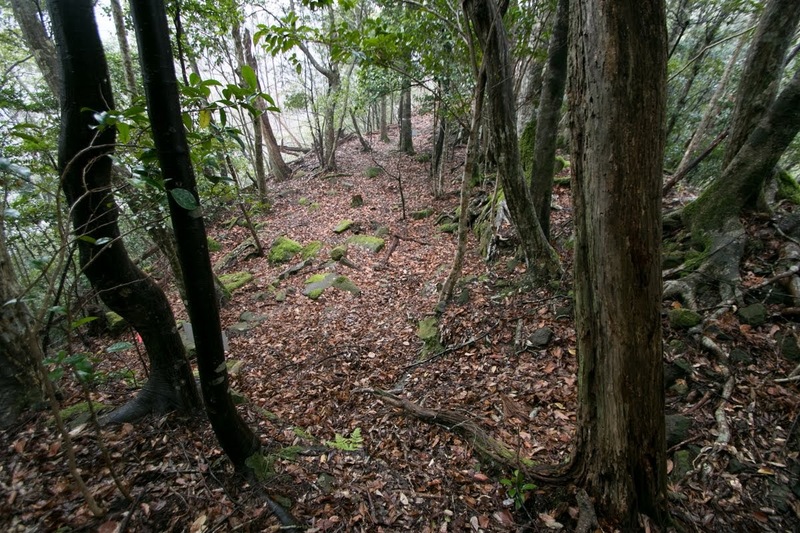 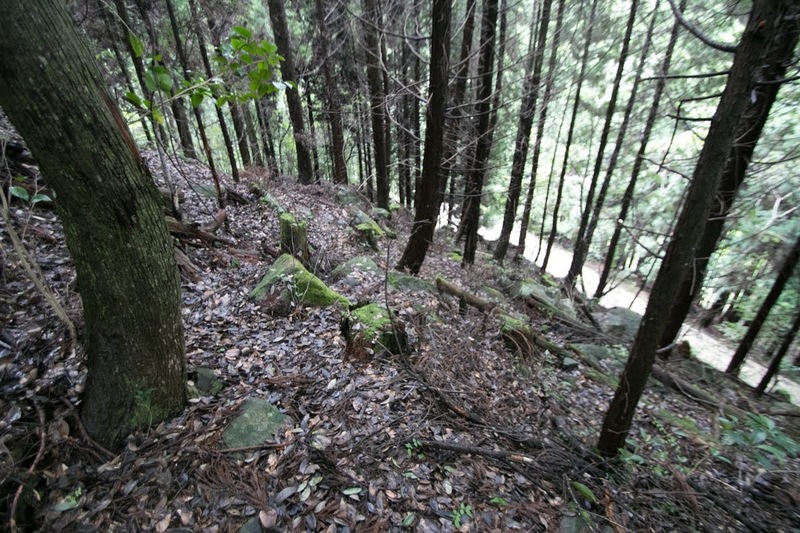 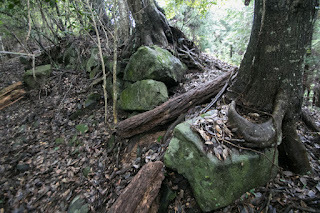 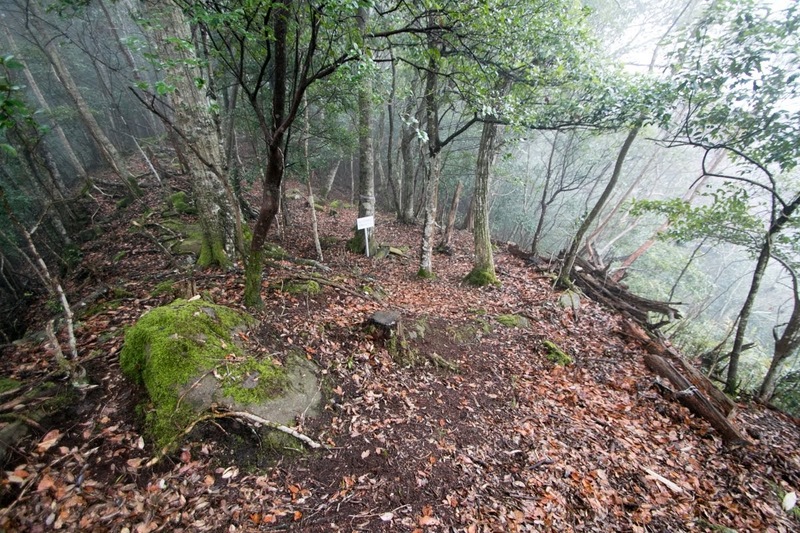 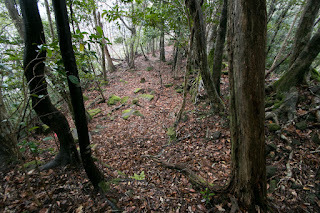 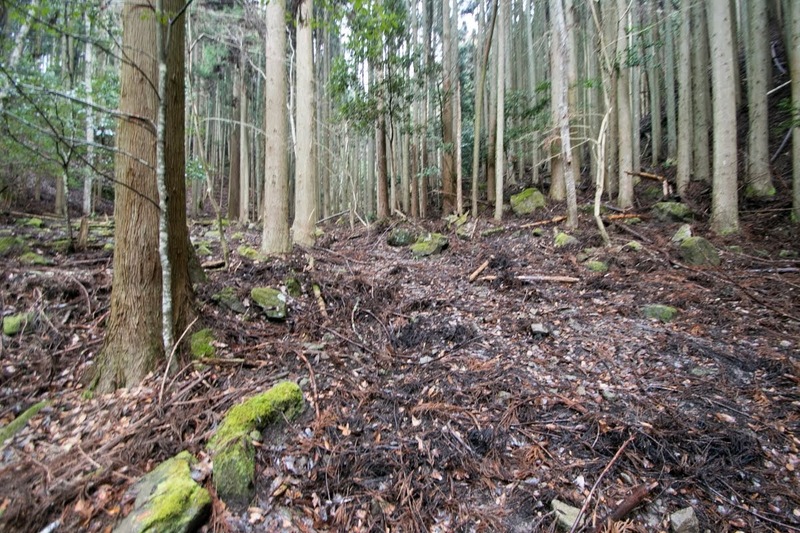 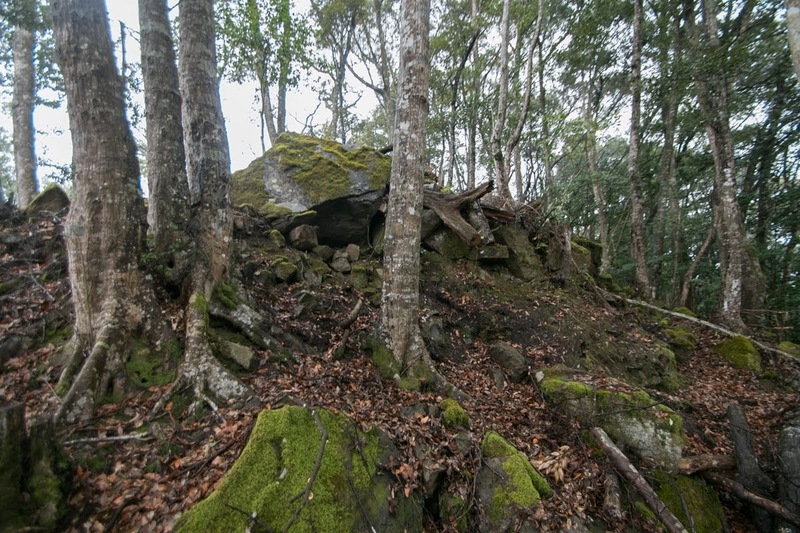 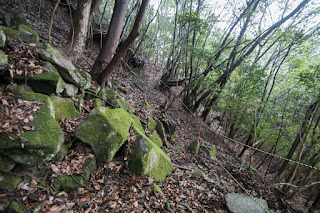 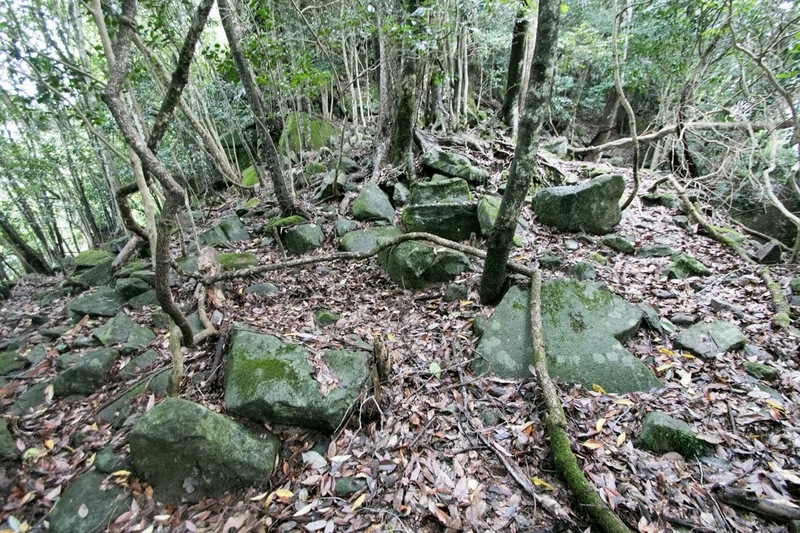 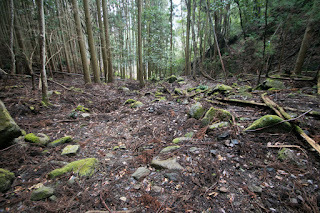 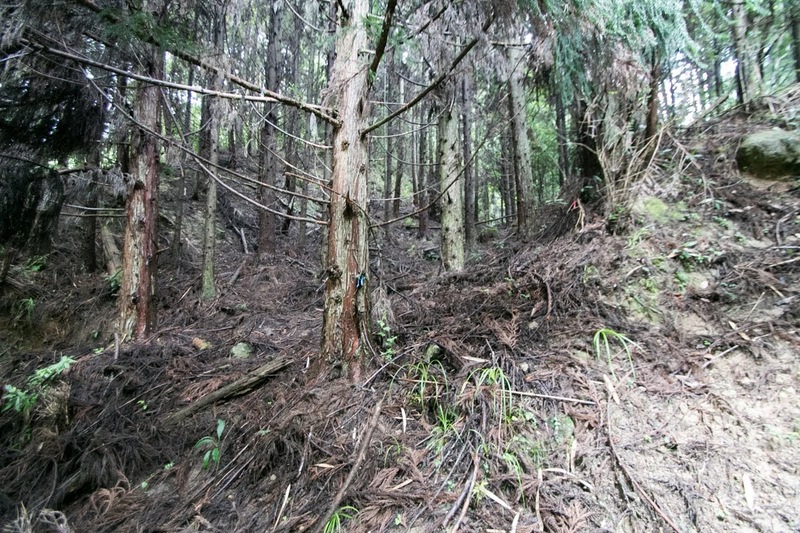 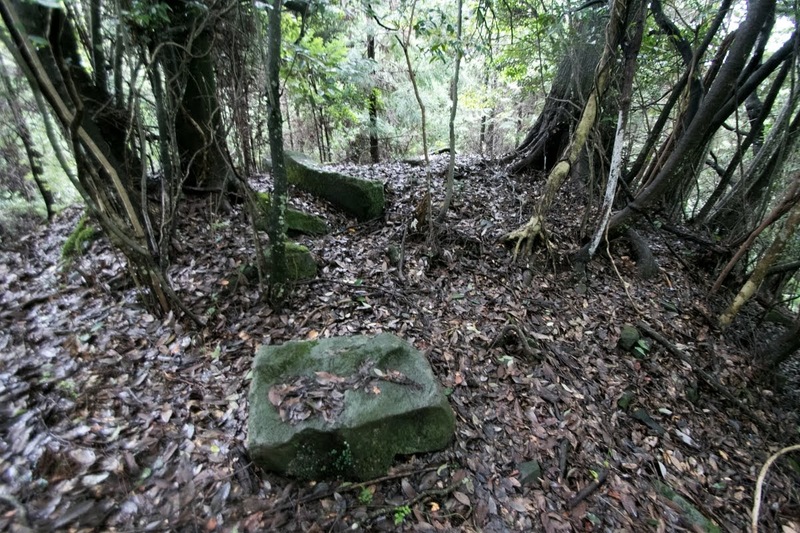 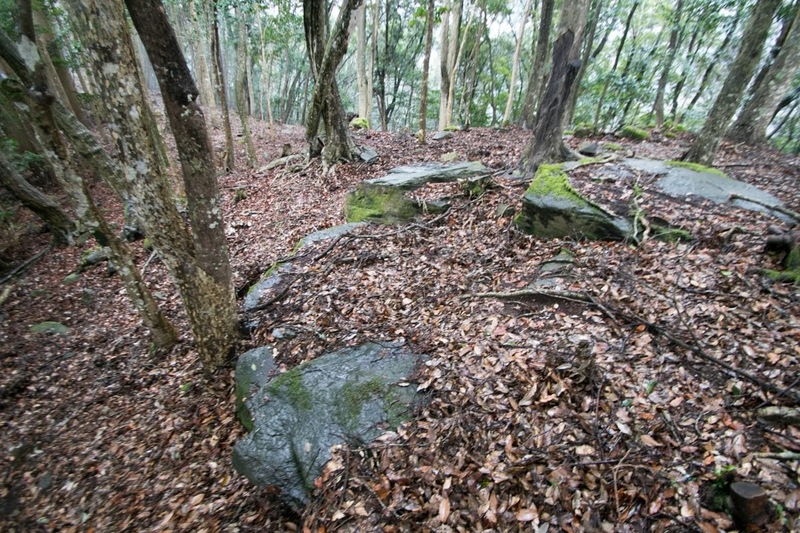 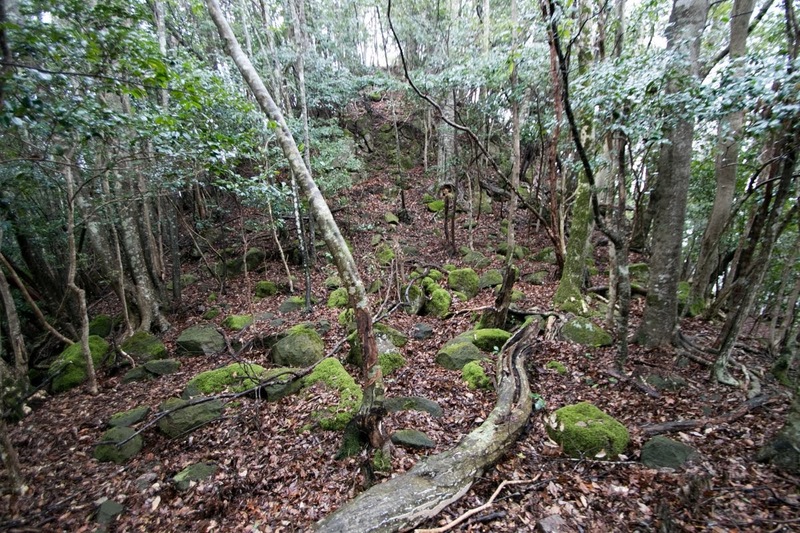 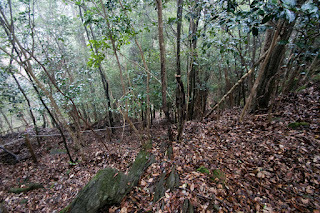 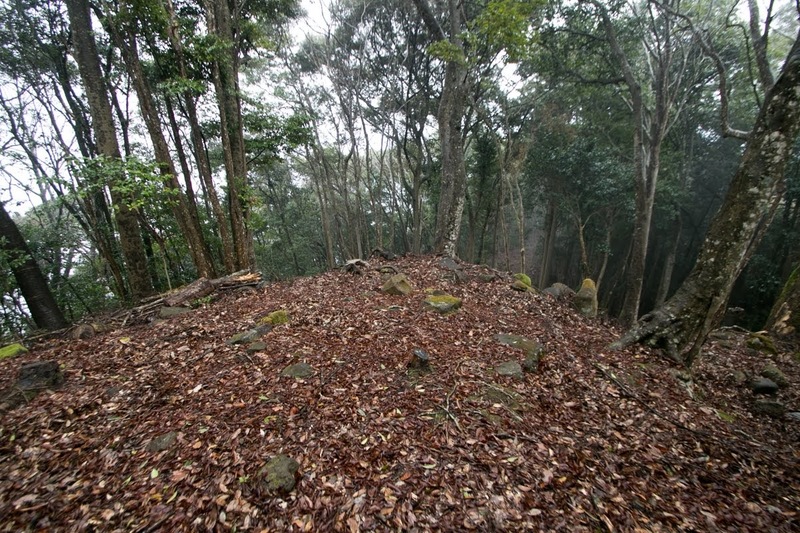 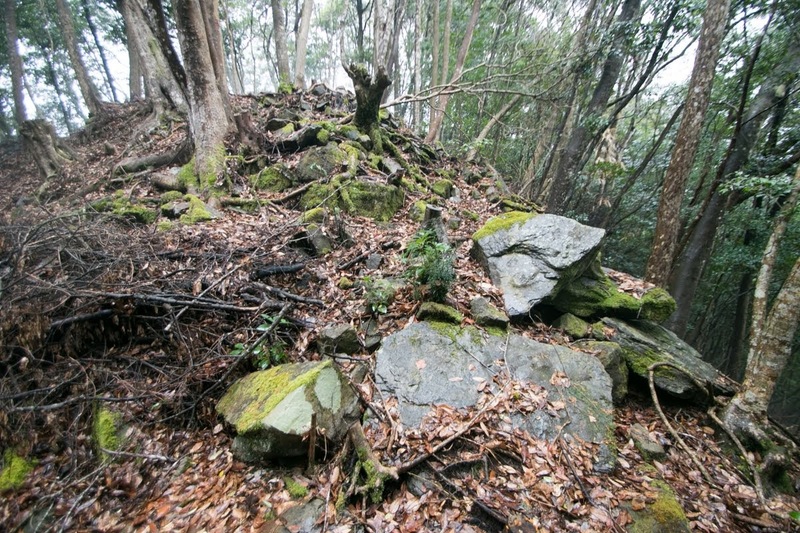 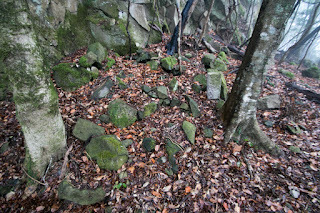 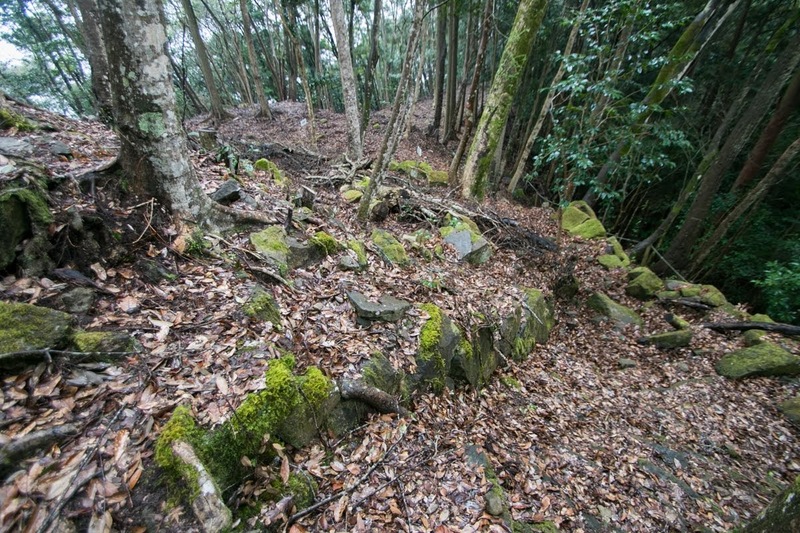 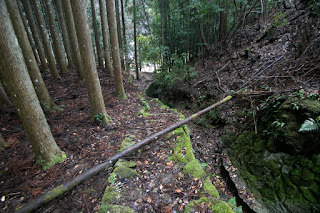 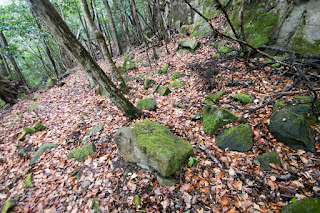 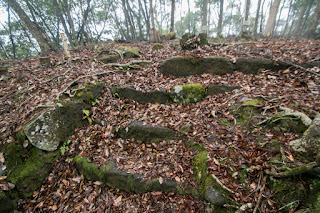 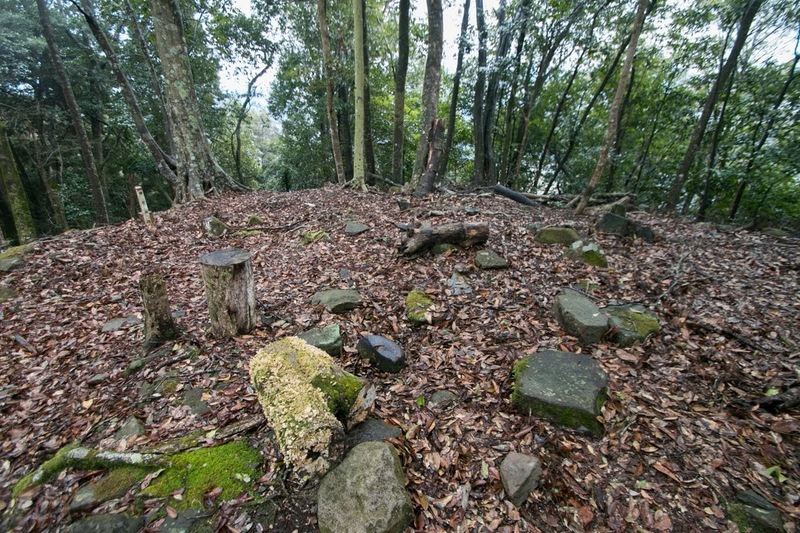 On the other hand, Hita area is a small basin but also flourished at the connecting point of western coast and eastern coast of Kyushu island, and by its forestry. 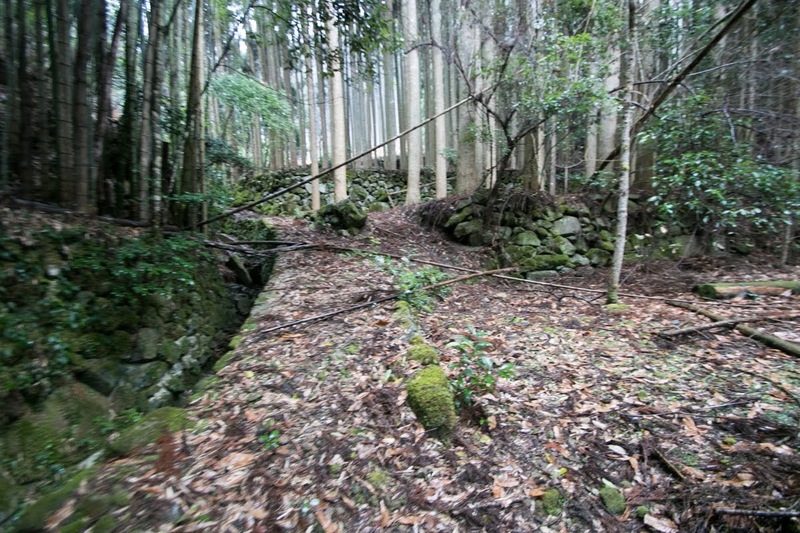 In the Edo era Hita area became the administrative base of territories of Edo Shogunate at Kyushu island, and became the center of logistics. 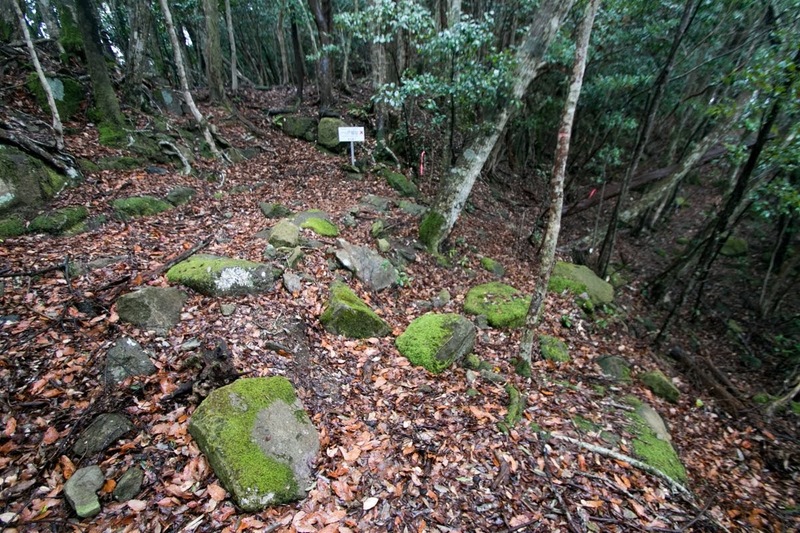 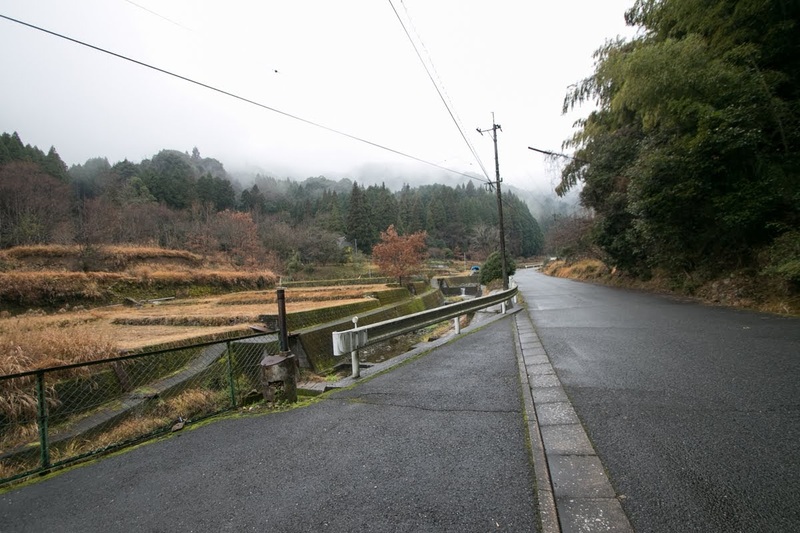 Because of this geographical reason, the mountainous road connected Nakatsu plain and Hita area, later developed as Hita-Oukan road and current Route 212, has been an important road of the area. 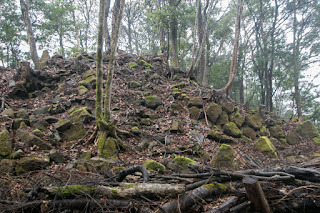 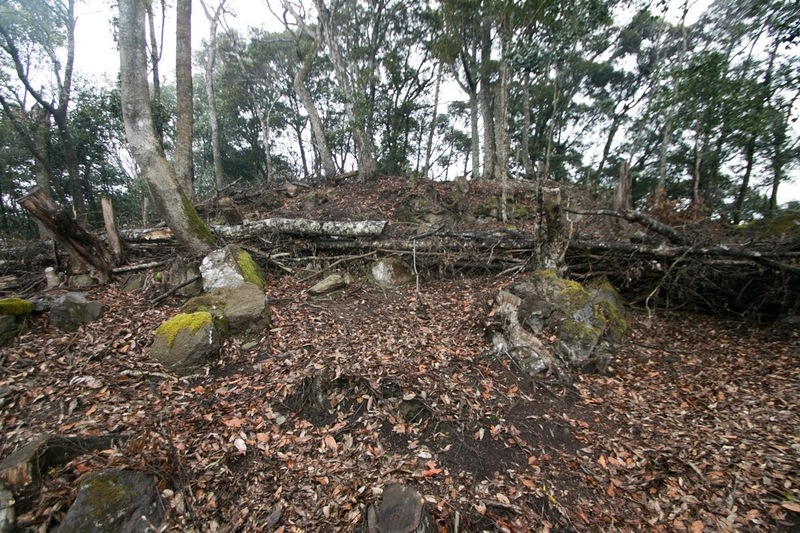 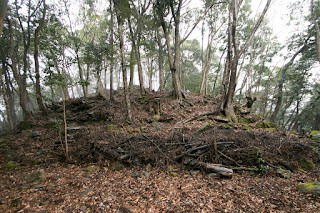 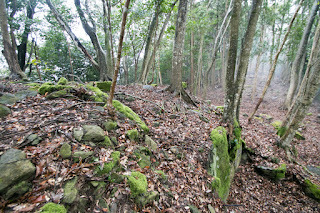 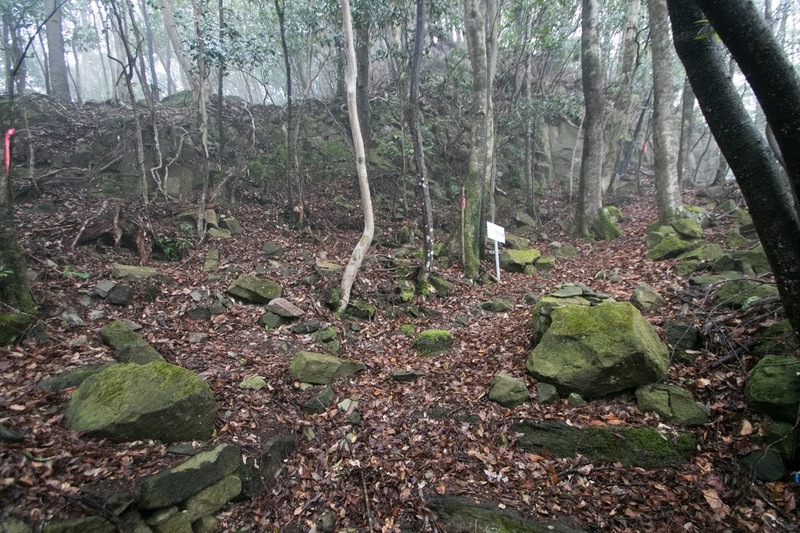 Castle site is just before the border of both area at Fushiki-Toge pass, and forefront fort against Hita area from Nakatsu plain. Precise year is unknown but Hitotsuto castle was built by local lord Nakama clan as their main base. 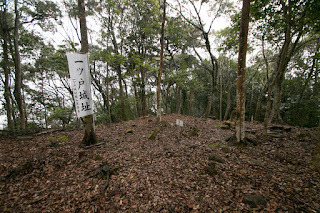 Nakama clan was a tributary of Utsunomiya clan, a traditional clan which held Nakatsu area from Kiidani castle. 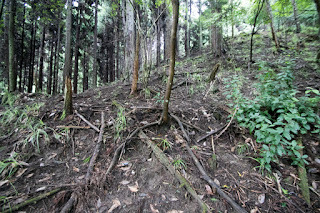 At the 4 kilometer northwest from castle site there was Nonaka clan which had same ancestor at Nagaiwa castle (Oita prefecture), and these clans acted cooperatively under Utsunomiya clan. 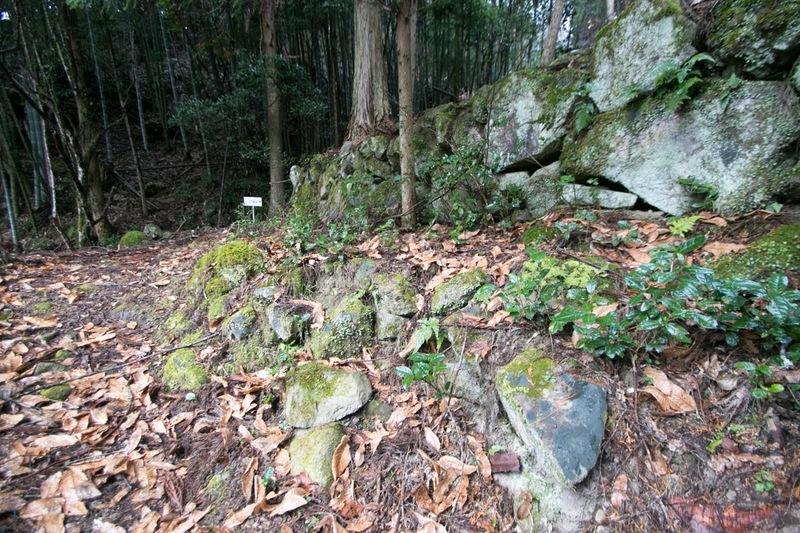 In the former half of 16th century, Nakatsu area which was at the middle of Oita area and Kokura area had been the point of struggle between Otomo clan, which was the governor of Bungo province (Oita prefecture), and Ouchi clan which was the one of Suo province and Nagato province (Yamaguchi prefecture) also held current Kokura area and Fukuoka area. Utsunomiya clan and their tributaries mainly belonged to Ouchi clan, but after the fall of Ouchi clan in 1551, they turned to Ouchi clan. 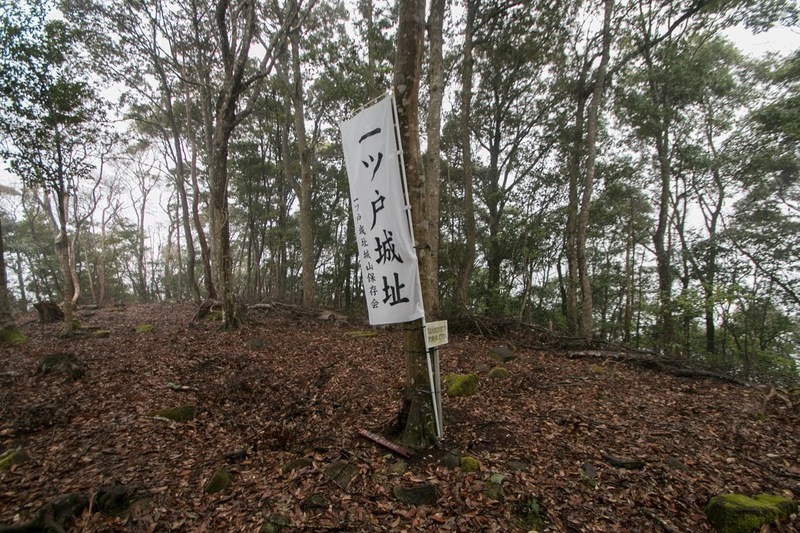 After the defeat of Otomo clan at the battle of Mimikawa they once followed to Shimazu clan which was the warlord of Satsuma province (Kagoshima prefecture) and became the ruler of Kyushu island instead of Otomo clan. In 1587, central ruler Hideyoshi Toyotomi (1537-1598) sent dominant army against Shimazu clan, and Shimazu clan finally surrendered to Hideyoshi and lost most part of their territory other than Satsuma province and Osumi province. 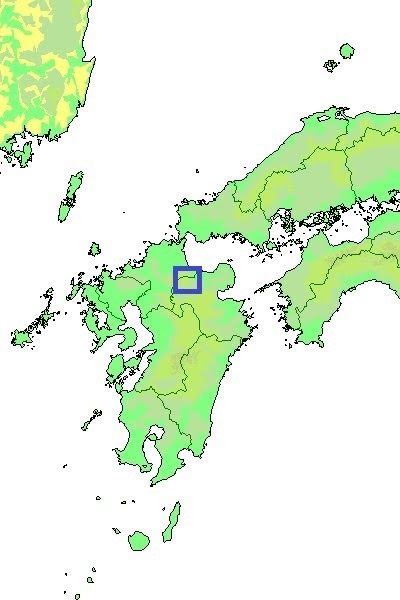 Buzen province (eastern part of Fukuoka prefecture) including Nakatsu area became the territory of Yoshitaka Kuroda (1546-1604), an excellent military staff of Hideyoshi. At this time Utsunomiya clan once followed to Hideyoshi, but was only recognized as the retainer of Kuroda clan and lost their autonomy. 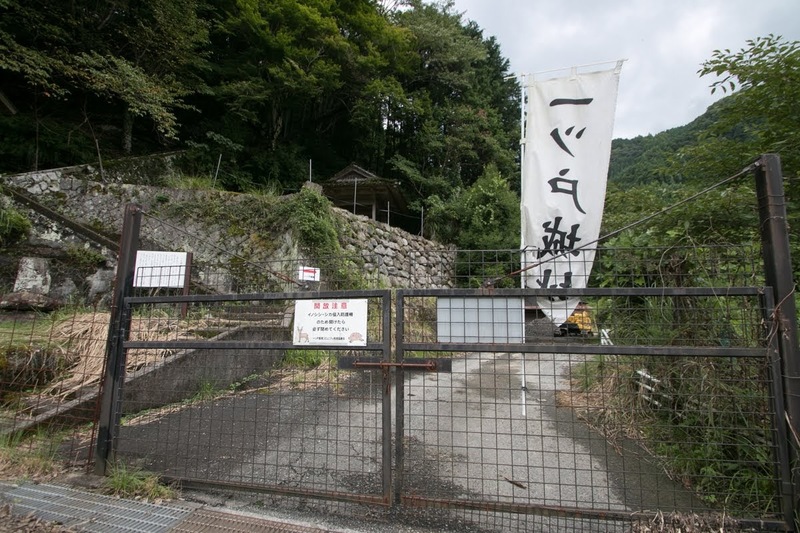 Utusnomiya clan also declined to the move to Iyo province (Ehime prefecture) to stay their original territory, and became hostile against Kuroda clan. 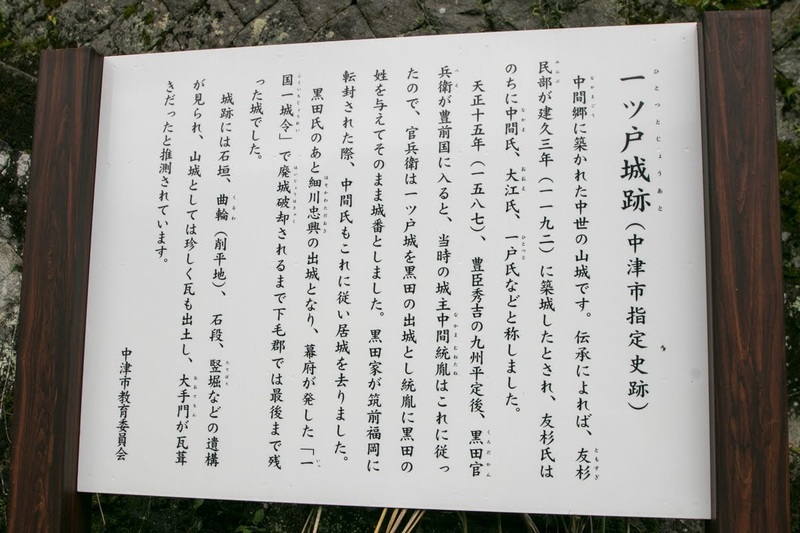 In 1588, Shigefusa Utsunomiya (1536-1588), the leader of Utsunomiya clan, raised their army along with their tributaries against Kuroda clan. 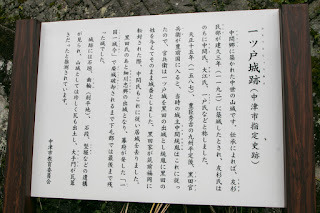 At this time Nonaka clan at neighbor Nagaiwa castle acted with Utsunomiya clan, but Munetane Nakama (1551-1625), the leader of Nakama clan chose to support Kuroda clan after discussion among retainers. 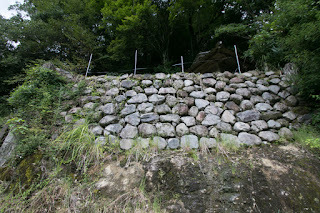 As Yamada clan which was a relative of Nakama clan securely stood at Yamada castle near Nakatsu plan, Nakama clan introduced Kuroda army to Yamada castle and let it fall. 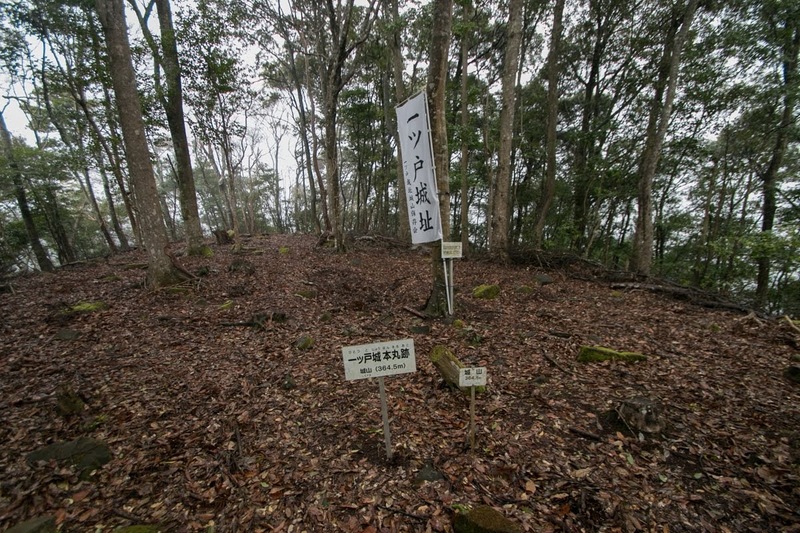 In 1600 Kuroda army fought against army of former Otomo retainers which attempted restoration of the clan at the battle of Ishigakibaru, and Nakama clan contributed to the victory of Kuroda army against Otomo clan and was praised its braveness. 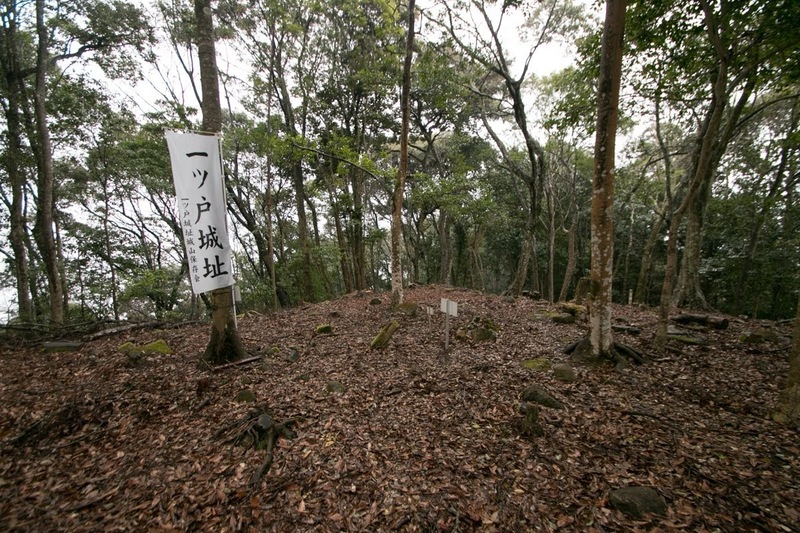 At that year, as a result of the battle of Sekigahara, Kuroda clan became the large lord of Chikuzen province (Fukuoka prefecture), and Tadaoki Hosokawa (1563-1646) was appointed as the governor of Buzen province. 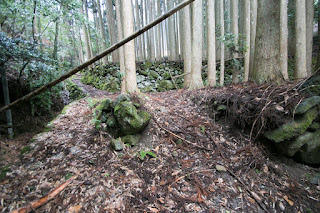 But as Kuroda clan took all harvests of Buzen province at their movement, there arose tension between both clan. 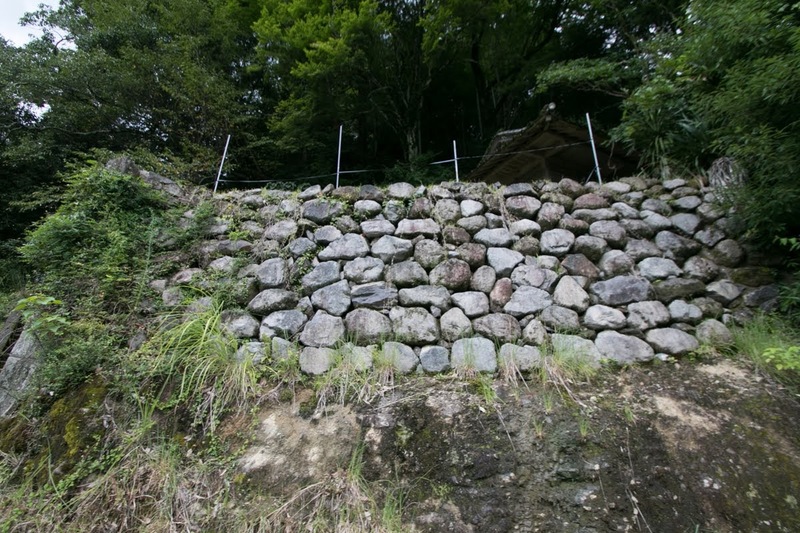 Along with the border of Chikuzen province and Buzen province, Kuroda clan built border castles such as Wakamatsu castle, Kurosaki castle, Masutomi castle and Matsuo castle. Especially Nakama clan became the commander of Matsuo castle (Fukuoka prefecture), only 10 kilometer apart from Hitotsuto castle. 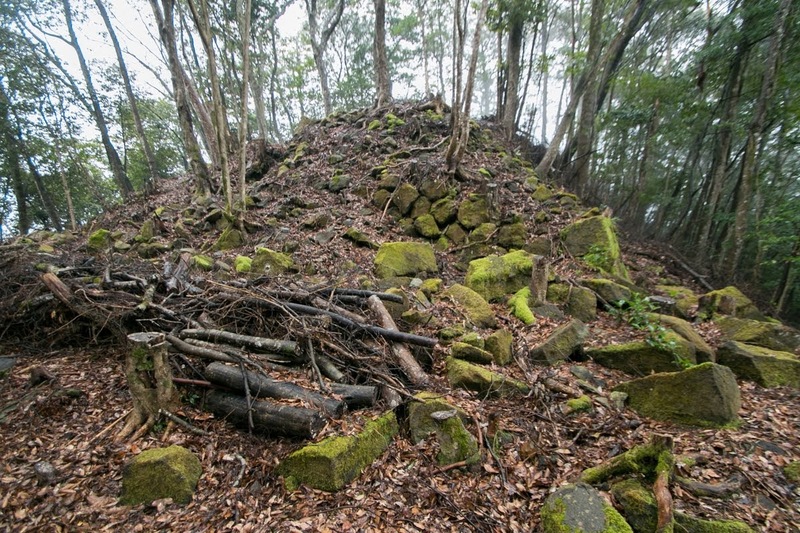 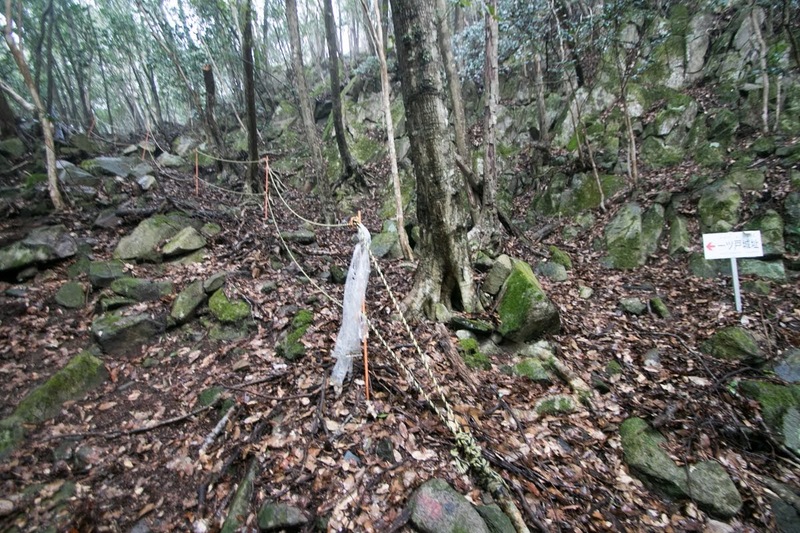 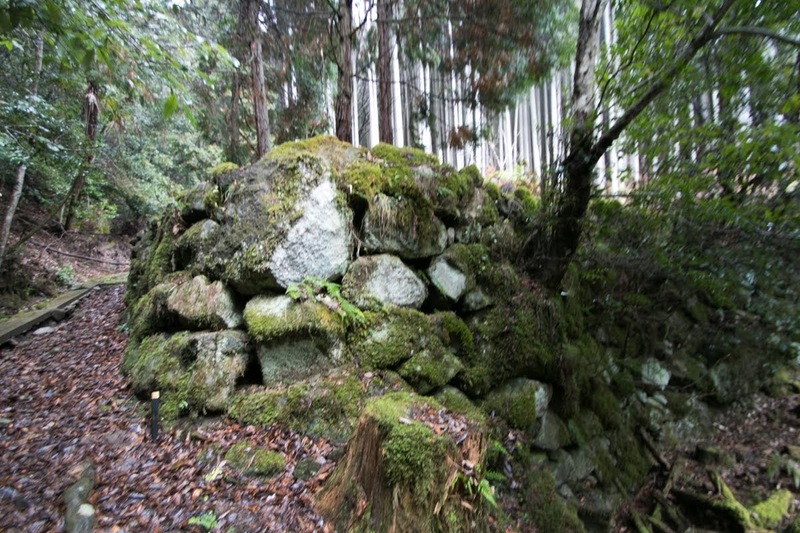 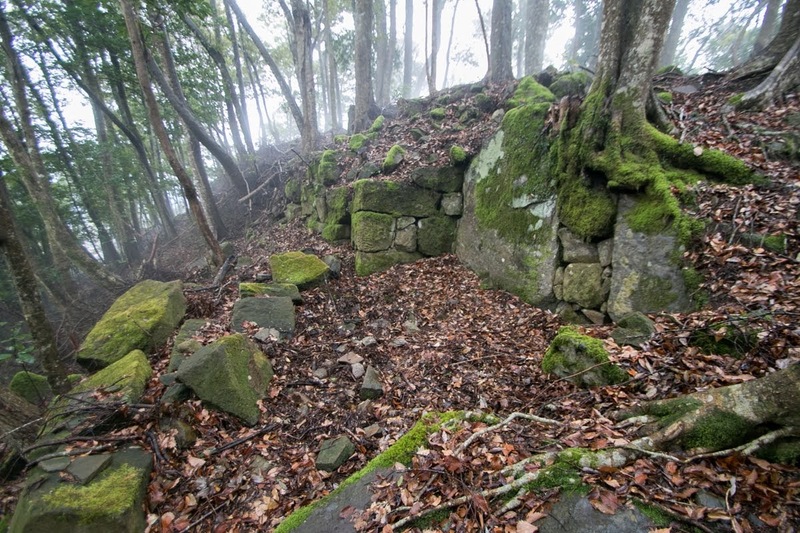 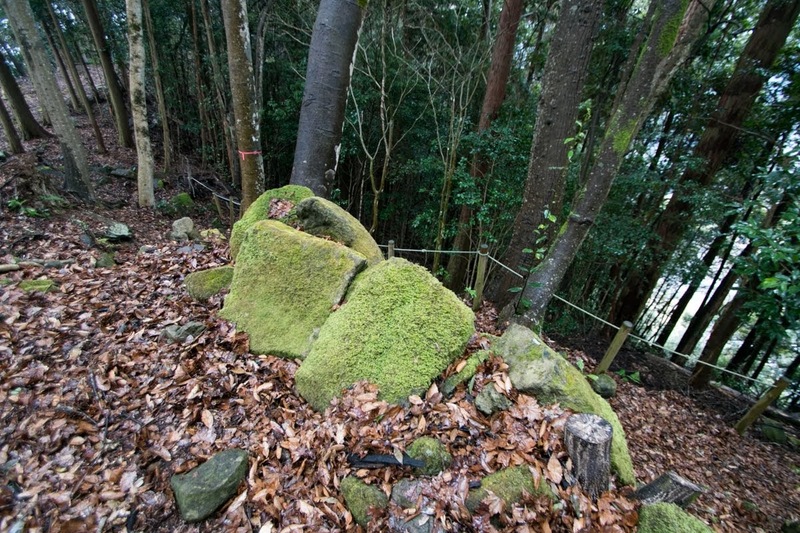 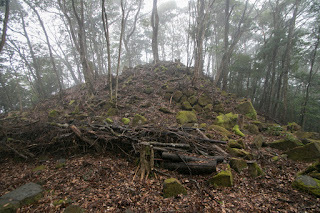 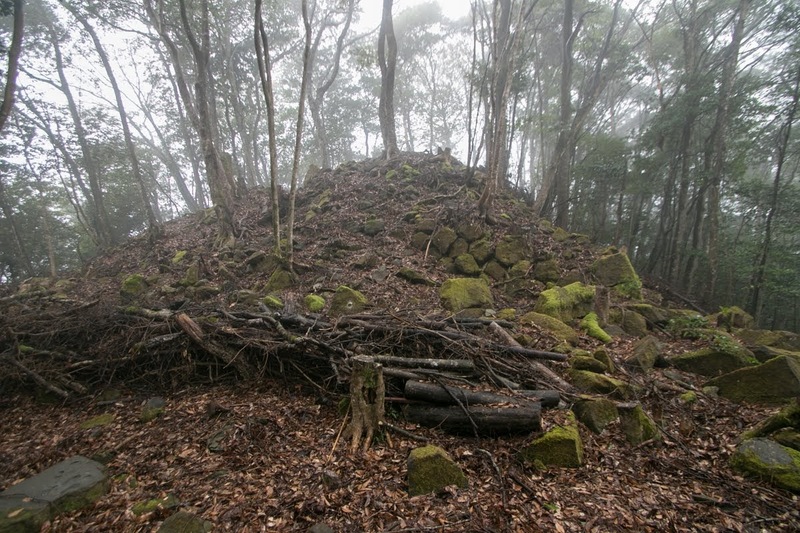 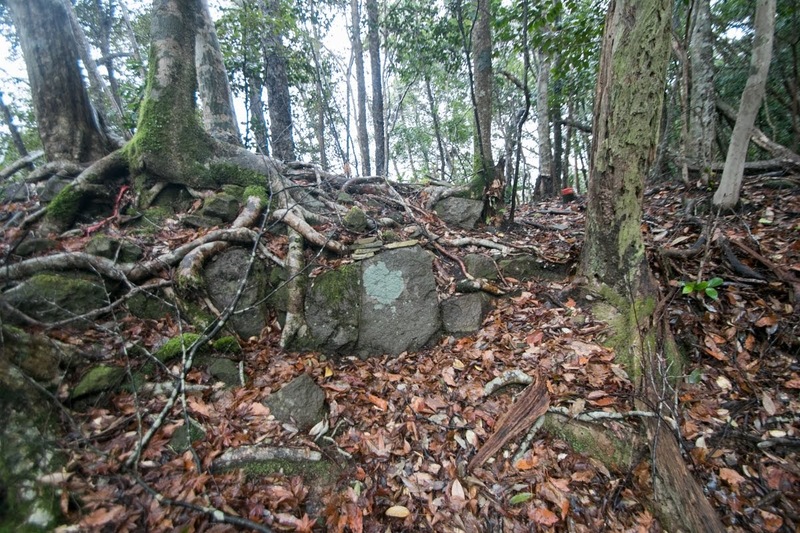 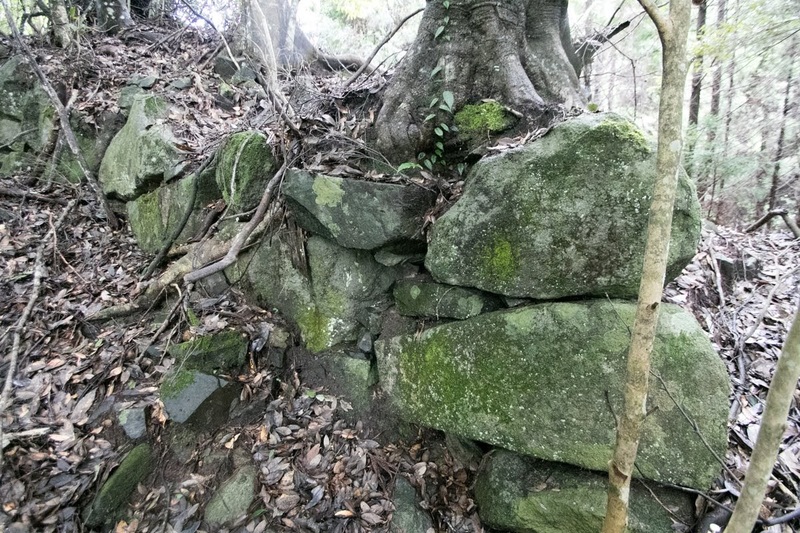 In response to this, Hosokawa clan also kept branch castles such as Kawaradake castle, Ganjaku castle (Fukuoka prefecture) or Hitotsuto castle along this border, other than their two main bases Kokura castle (Fukuoka prefecture) and Nakatsu castle (Oita prefecture). 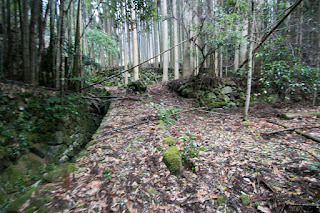 Hosokawa clan placed Arakawa clan as the commander of the castle, and might expanded Hitotsuto castle as the border castle, preparing for Nakama clan. Finally Utsunomiya clan and their supporter were totally purged, but Nakama clan became an important retainer of Kuroda clan. 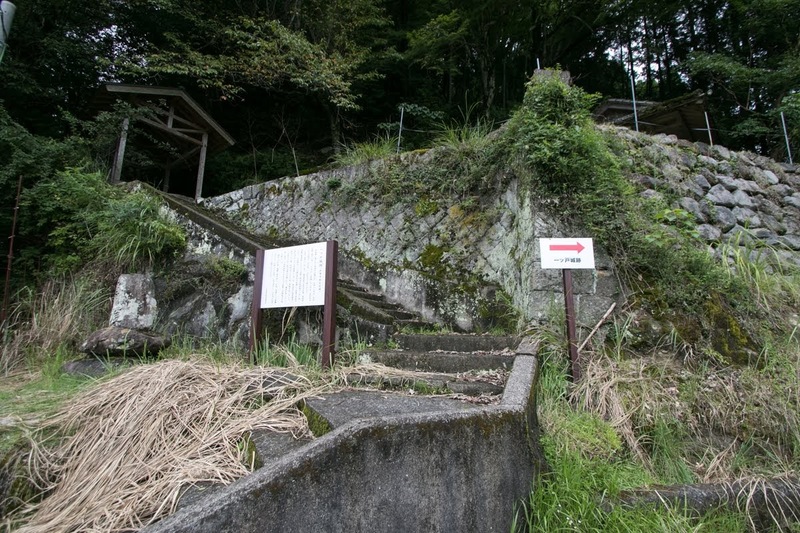 Hitotsuto castle was kept as a border castle against Hita area, and Nakama clan also remained as the commander of the castle. Otomo clan once became the feudal lord under Toyotomi government was expelled in 1593, Kuroda clan might reform Hitotsuto castle to prepare for instability of the area. 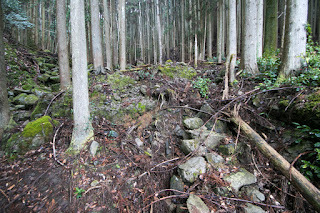 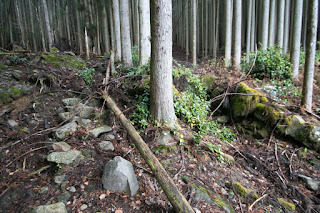 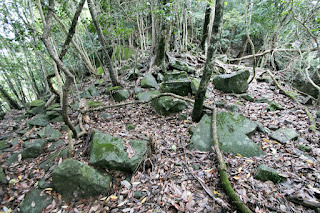 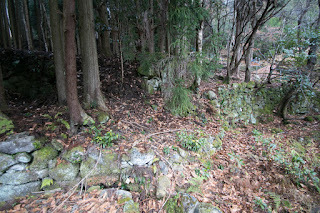 According to the information, main part of this castle is built over a huge rock spreads toward east and west. 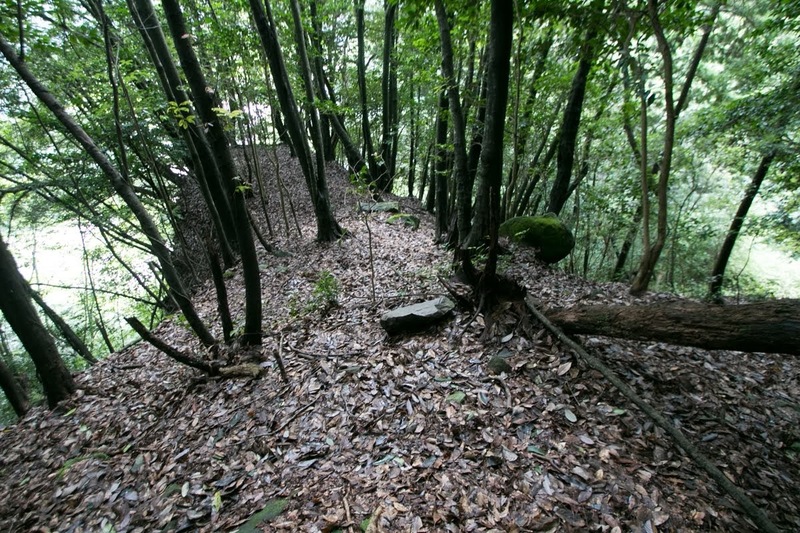 Central area of the castle is an oblong one of about 50 meter long and 15 meter wide, and secondary area, third area and outer fort stands eastward in line. 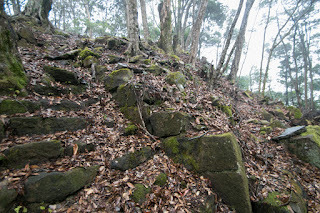 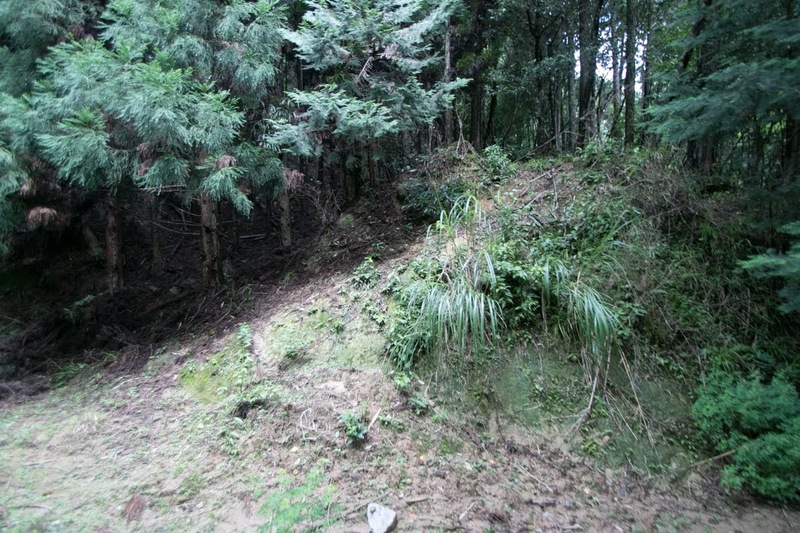 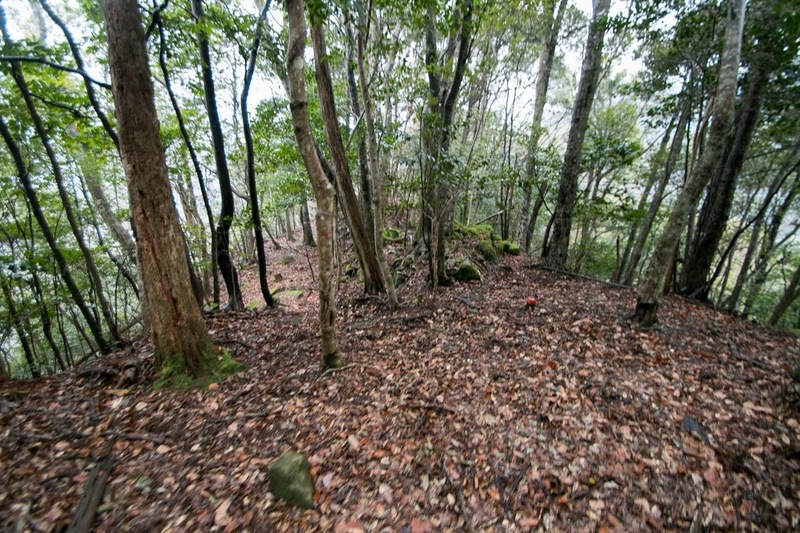 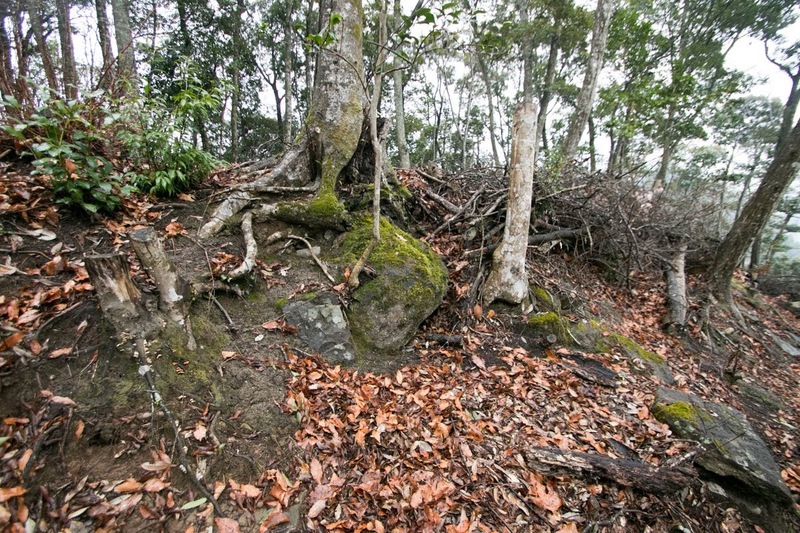 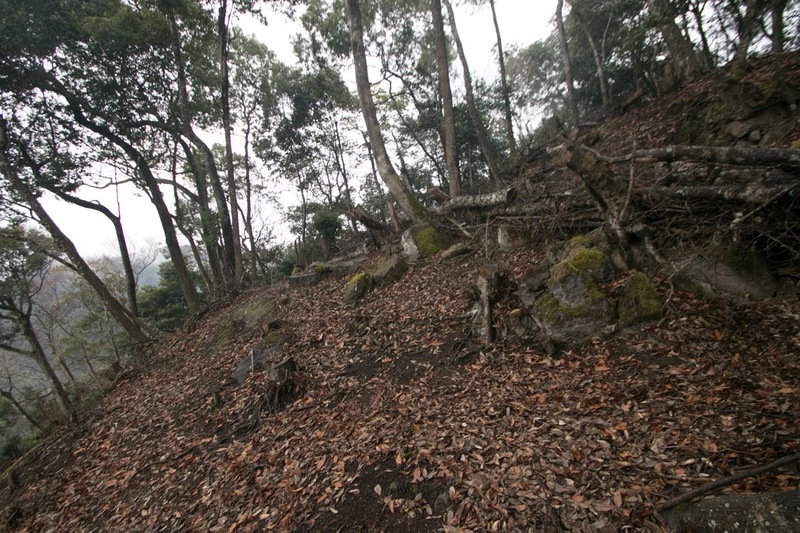 On the other hand, westward of central area which is connected to backside mountain is protected by small terraces, steep slope and dry moat. 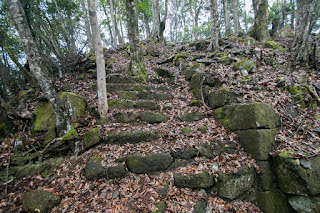 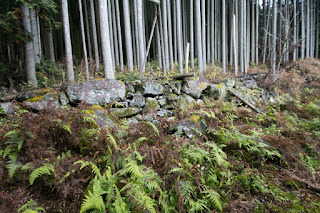 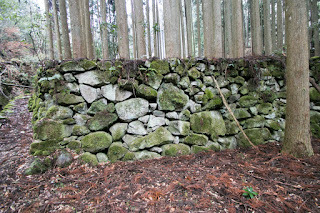 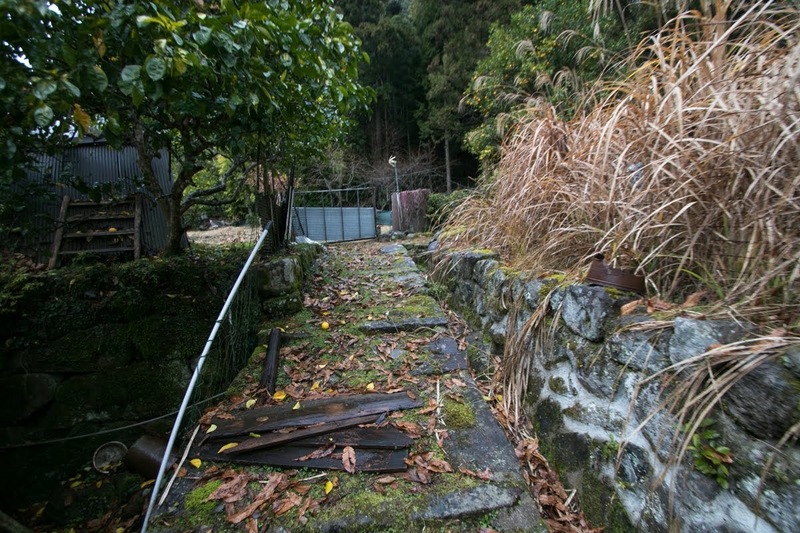 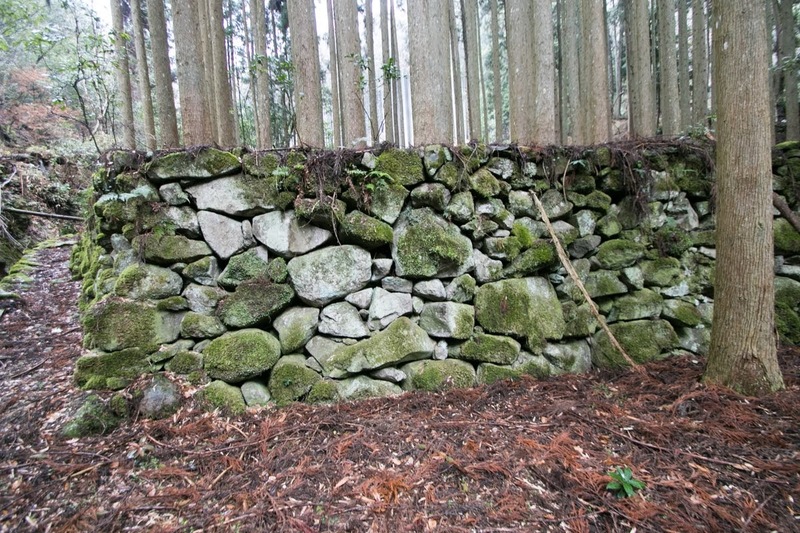 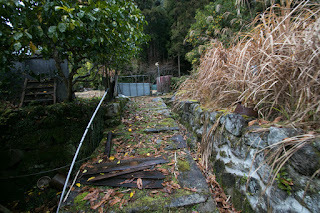 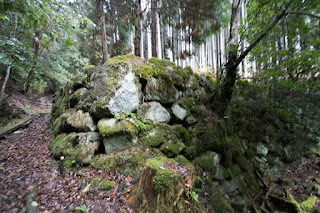 Front side of central area and secondary area was securely protected by stone wall, Masugata style gate and folded stone steps. 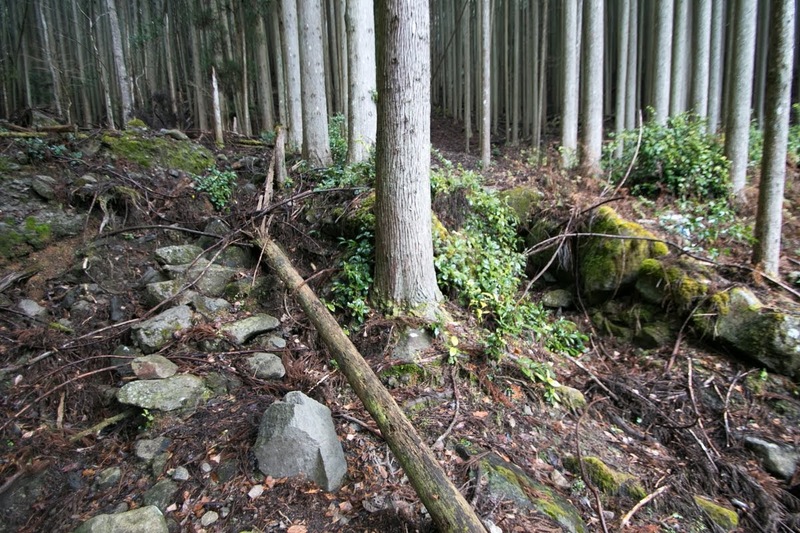 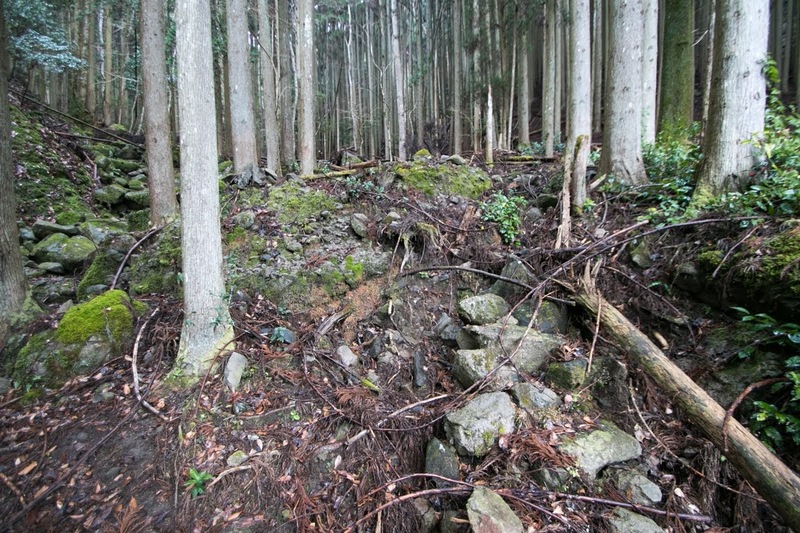 Main tower of the castle might be built at the front side of central area, where large cornerstone of stone wall remains. 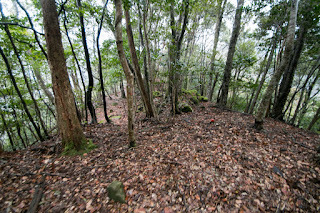 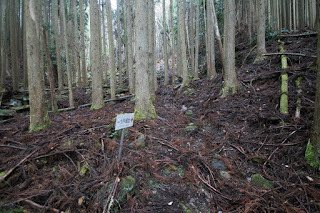 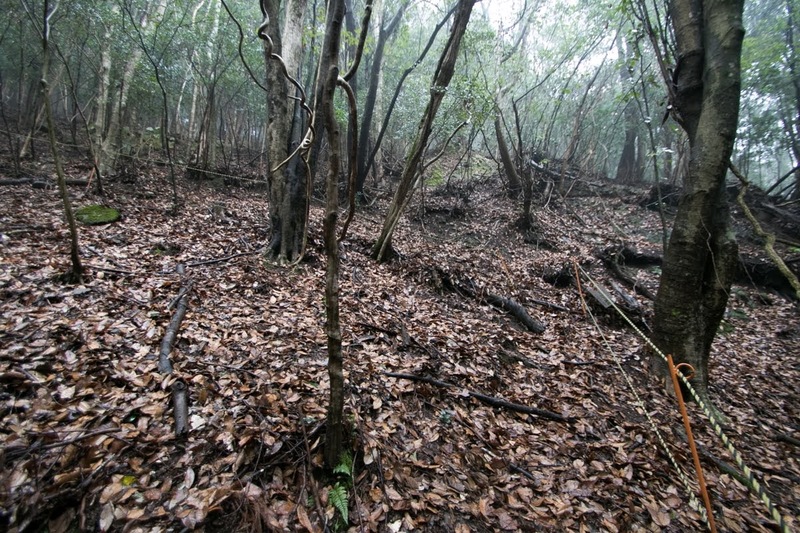 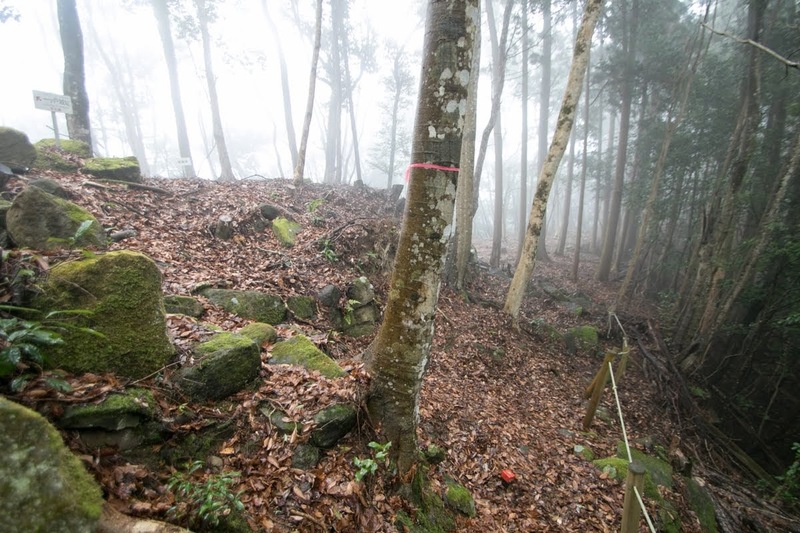 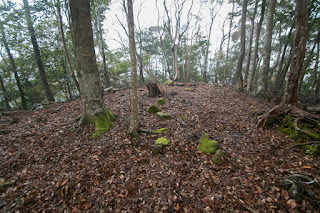 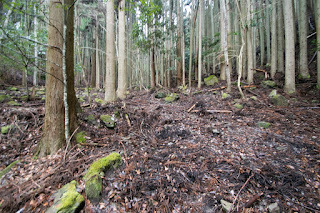 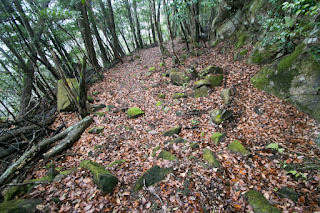 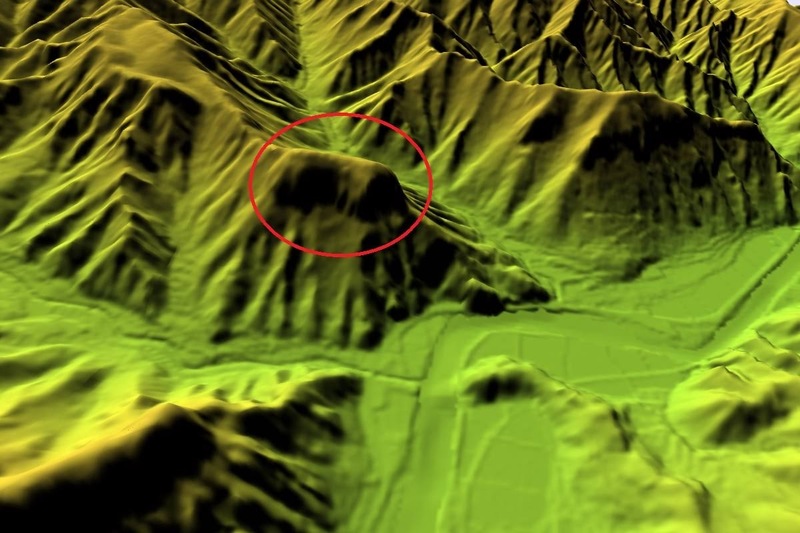 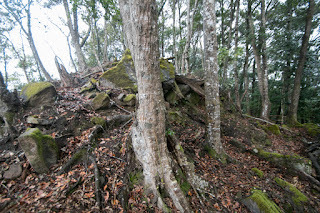 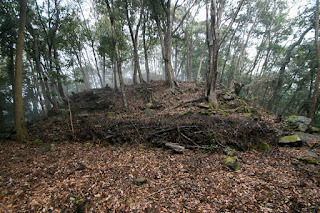 Between central area and east edge small peak which might be the central area of Kuroda period there is a large flat space of about 100 meter long, which might be built at Hosokawa period. 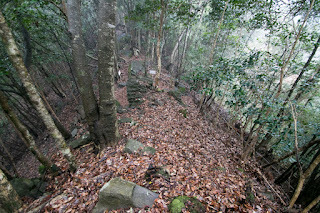 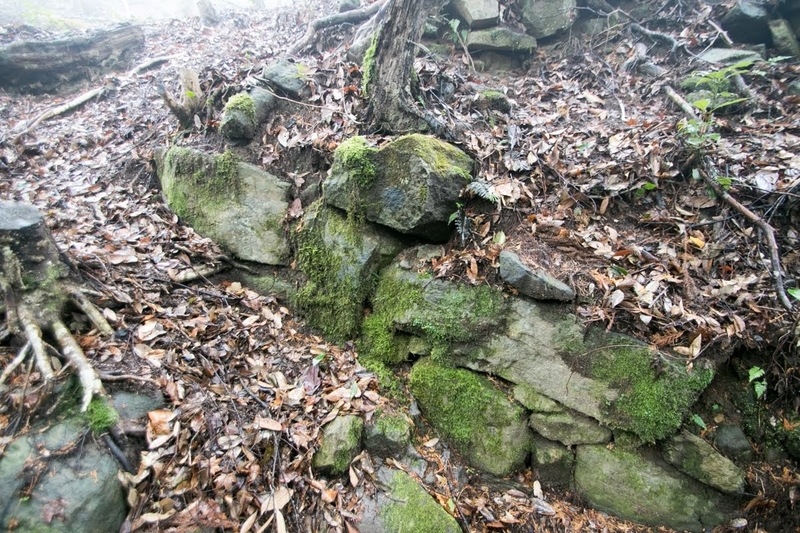 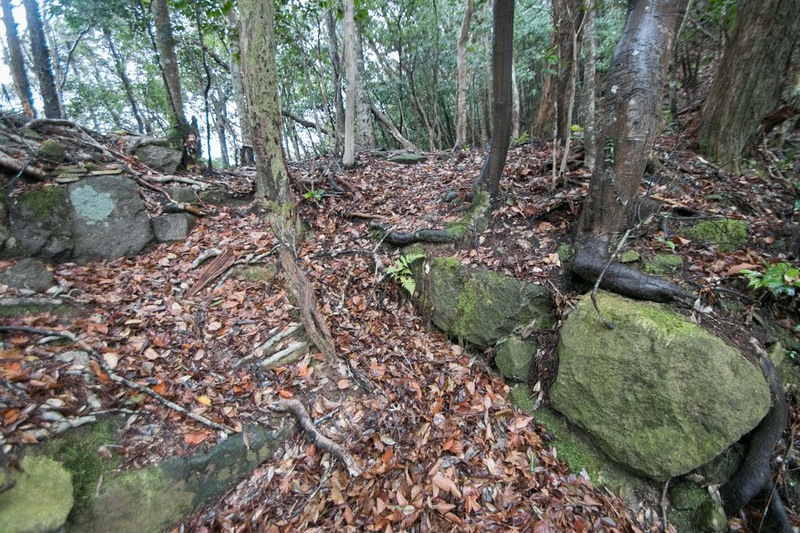 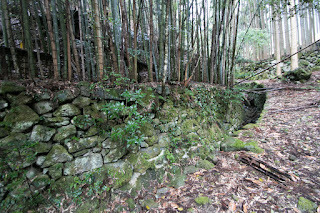 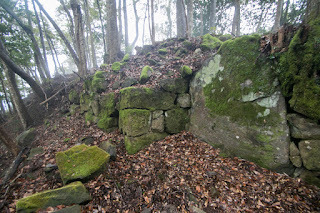 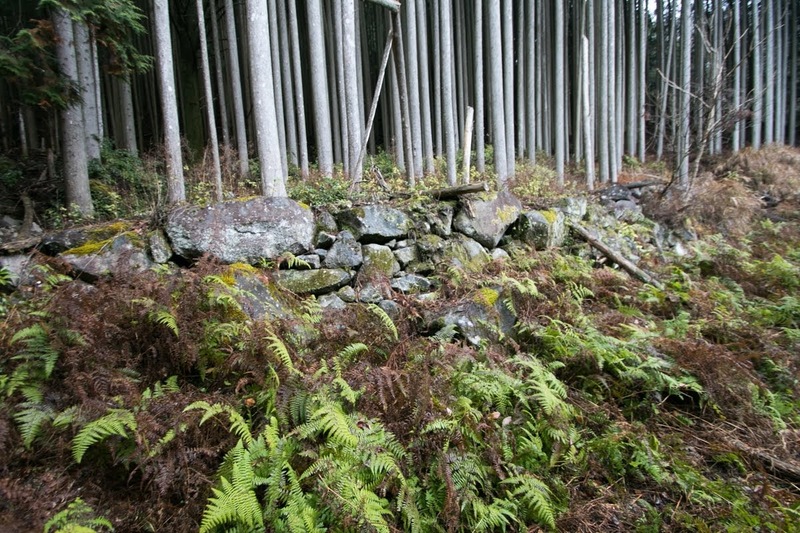 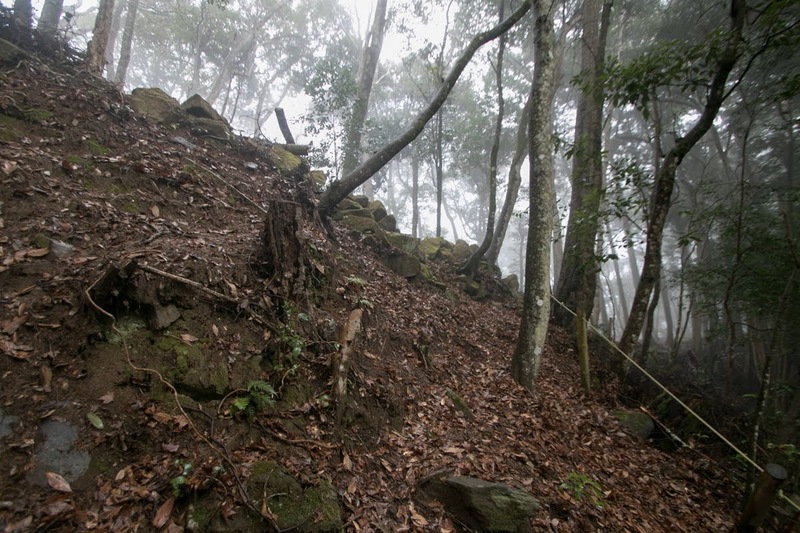 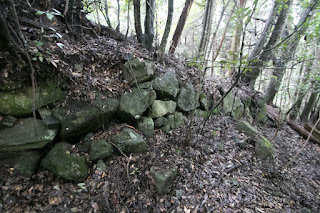 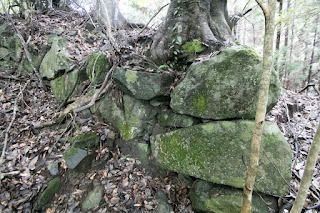 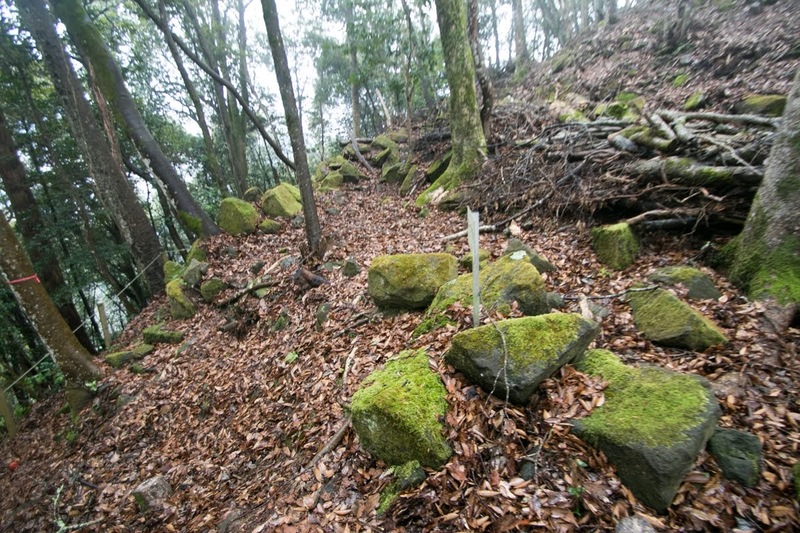 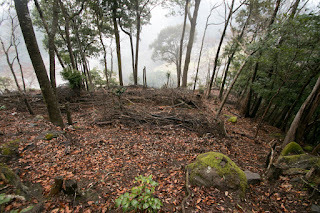 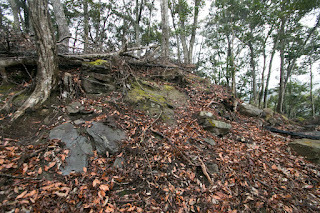 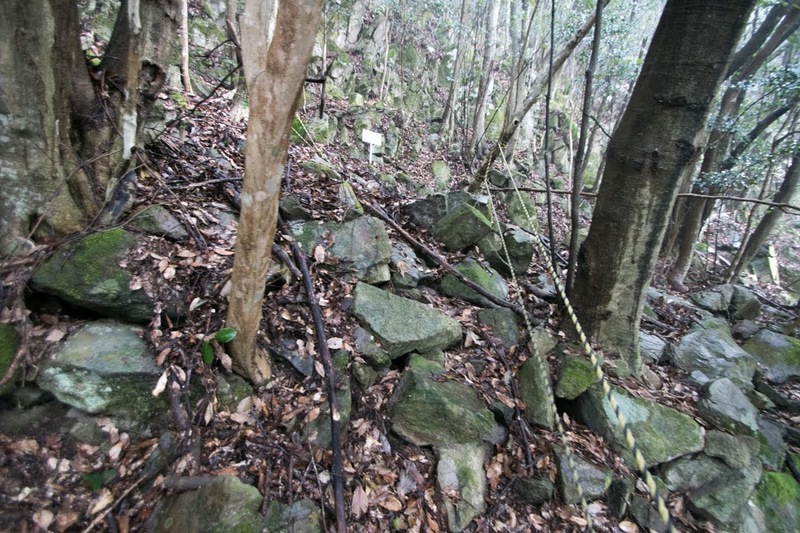 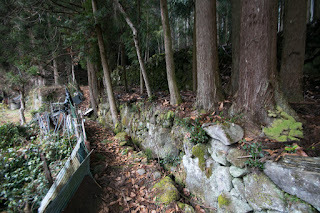 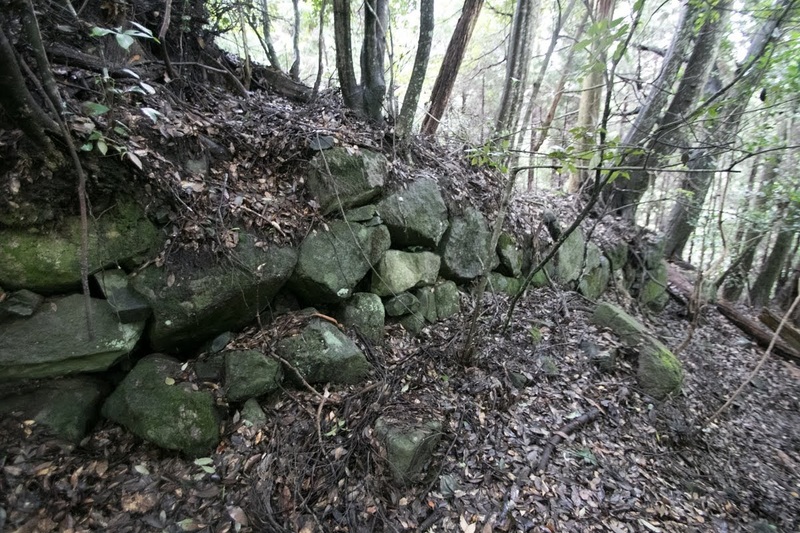 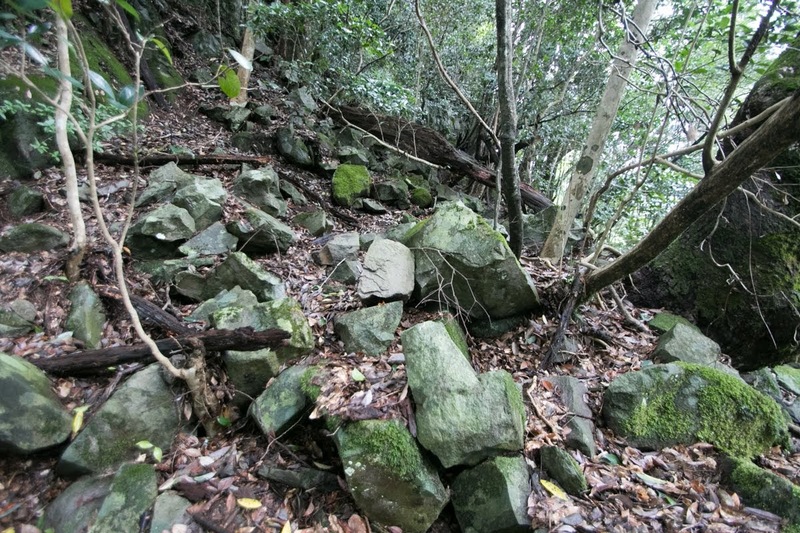 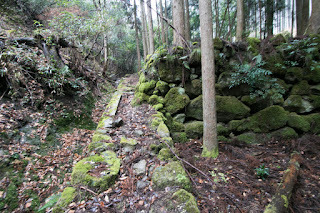 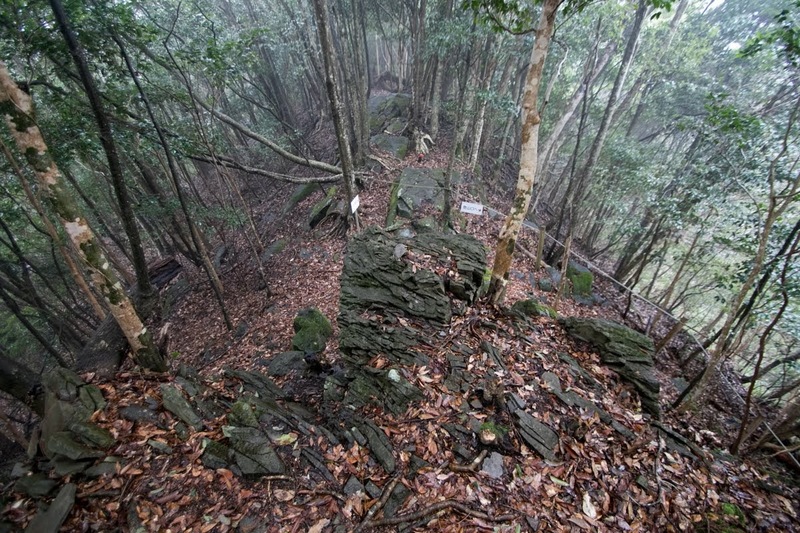 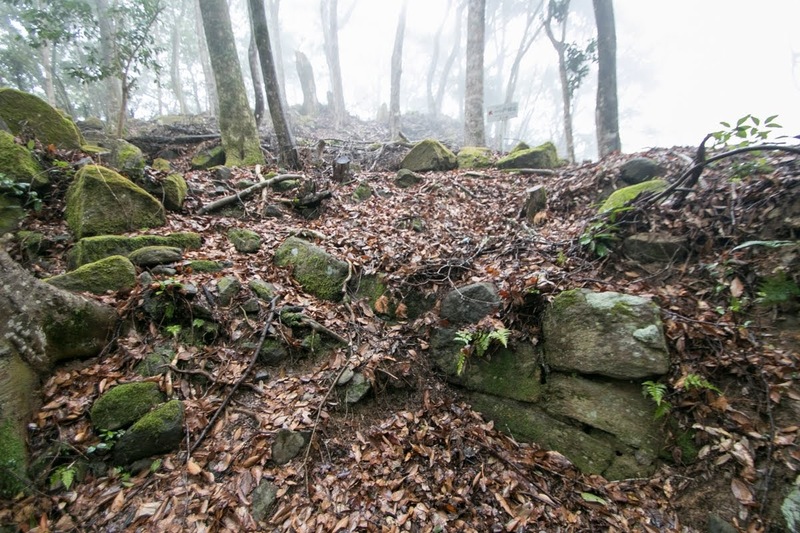 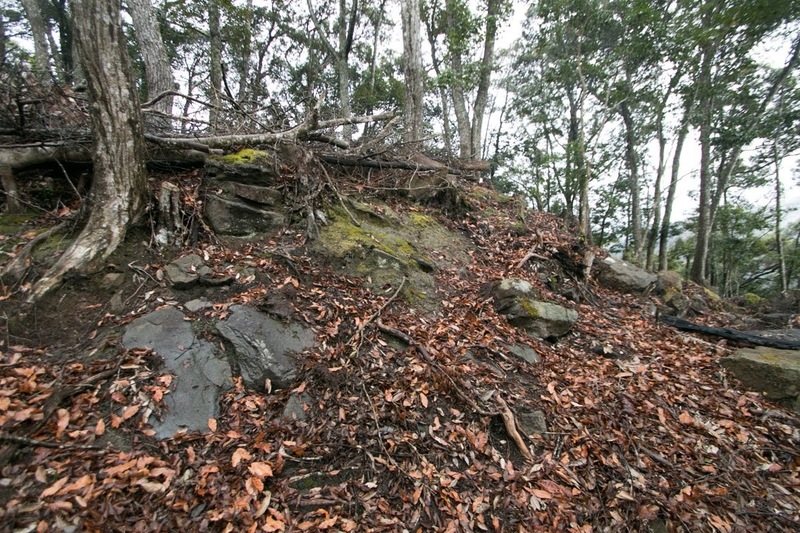 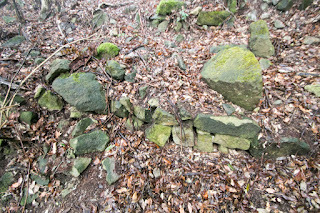 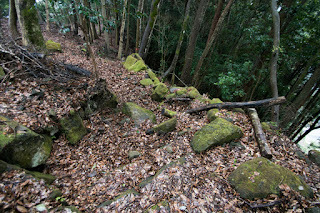 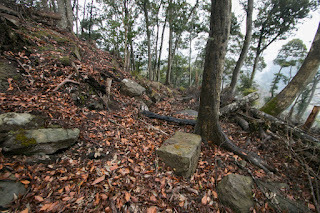 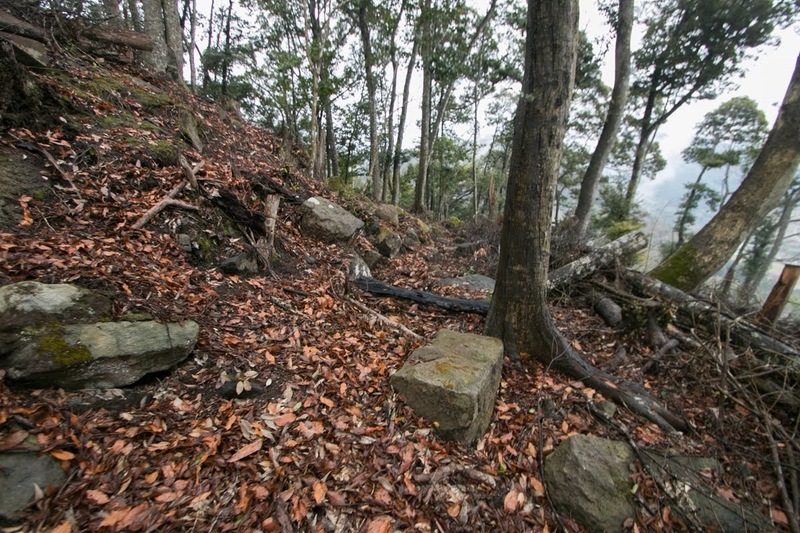 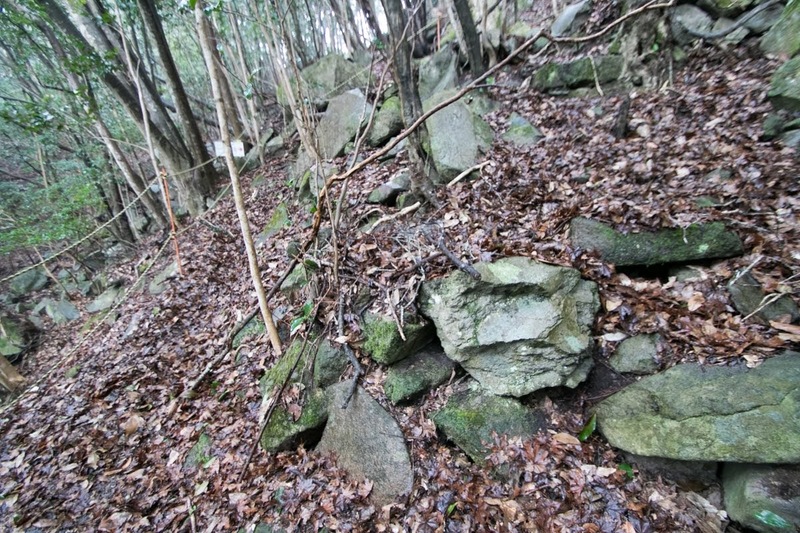 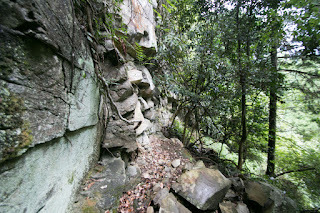 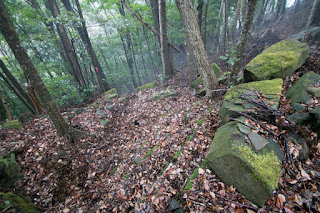 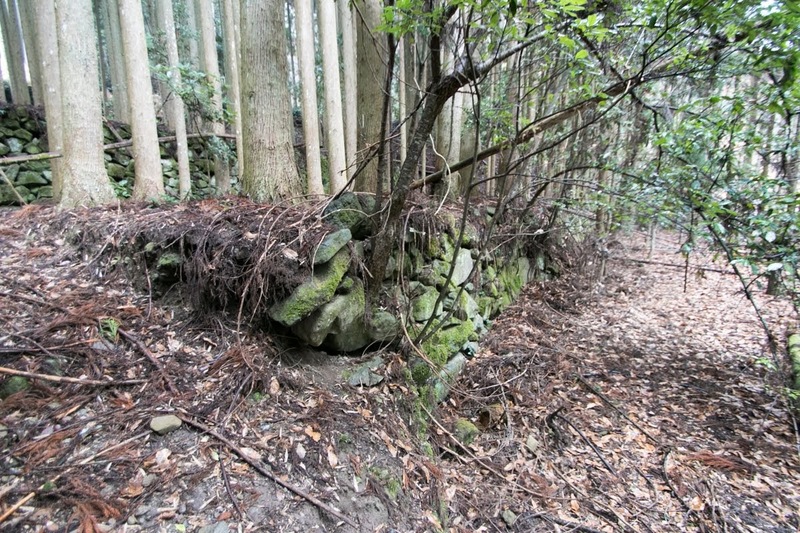 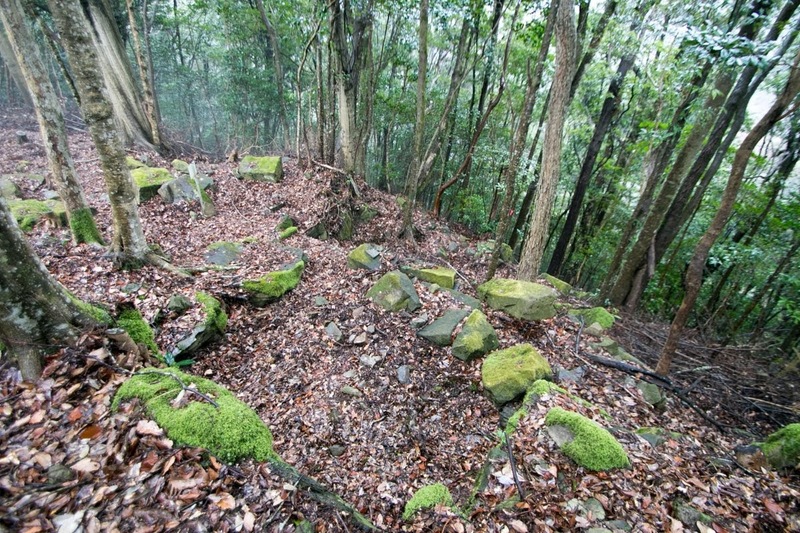 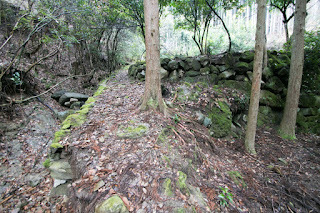 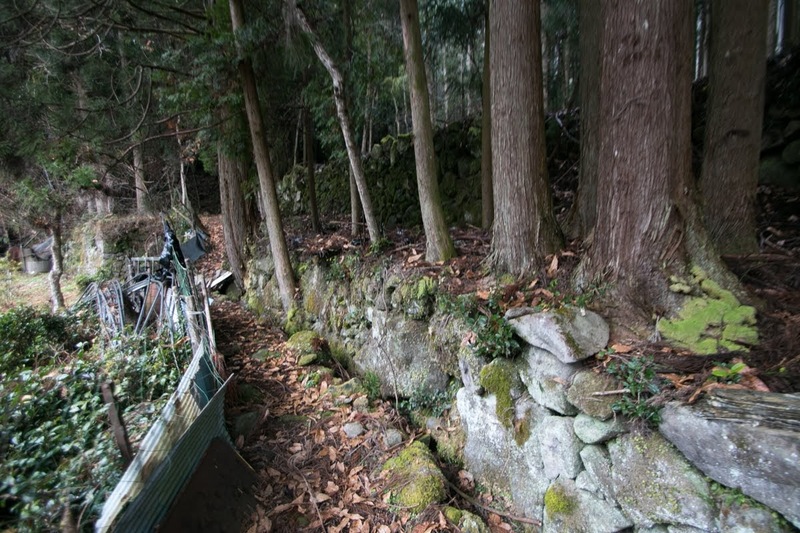 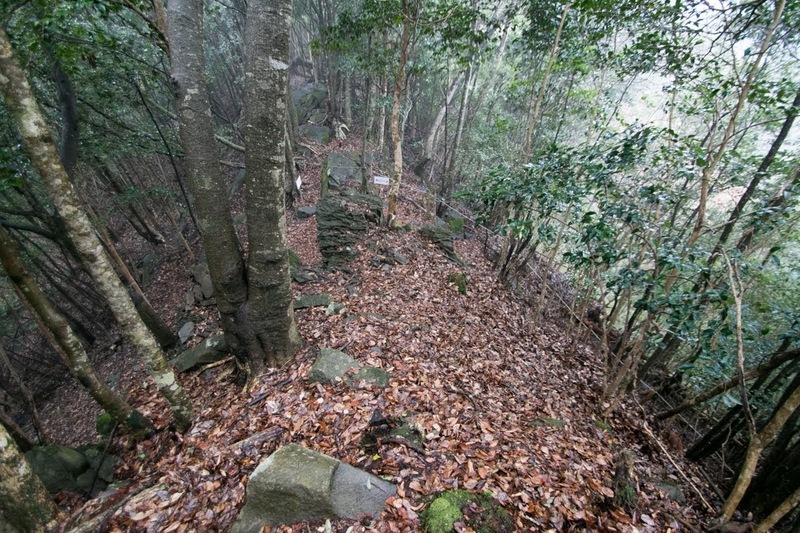 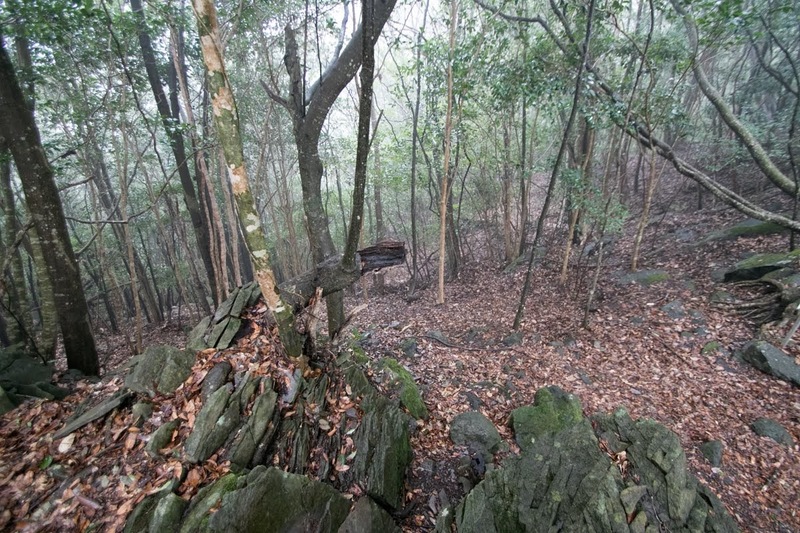 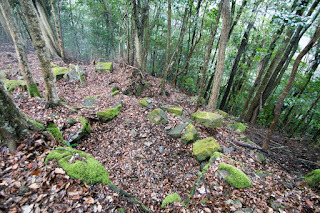 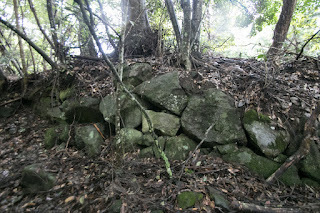 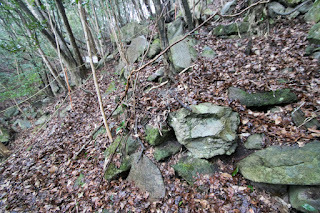 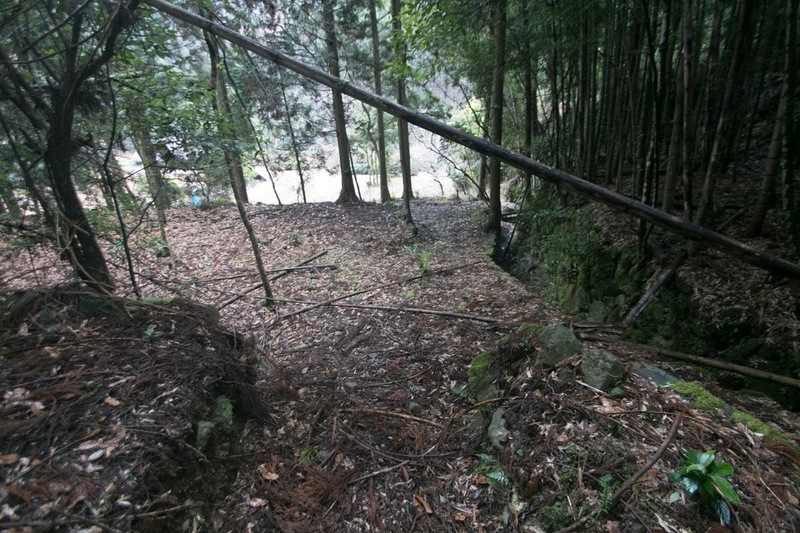 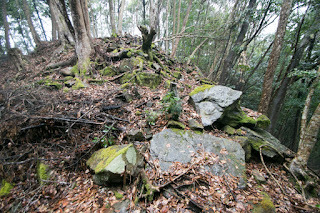 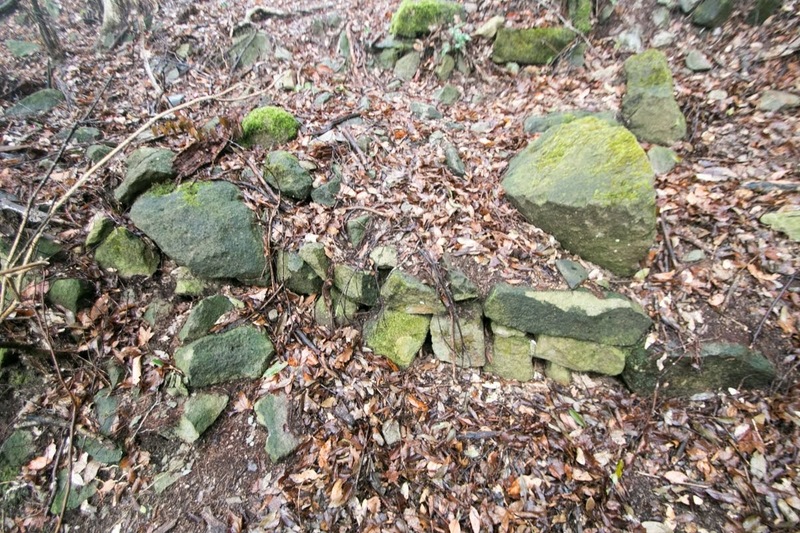 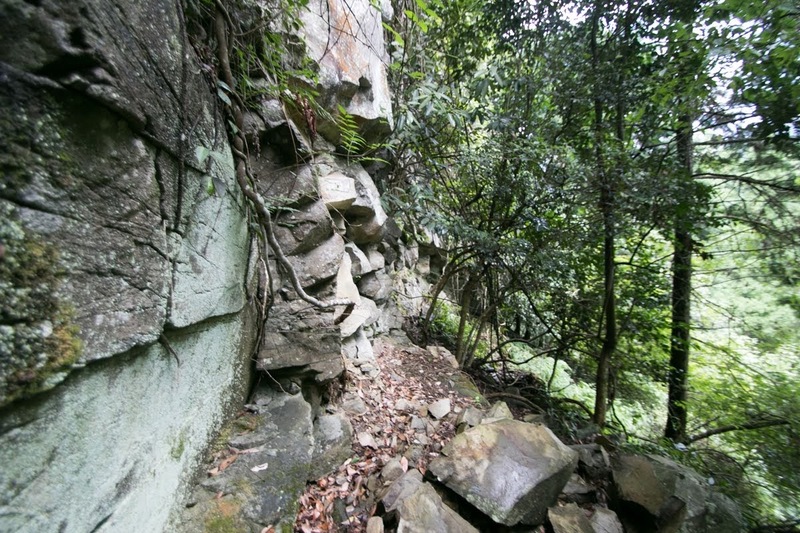 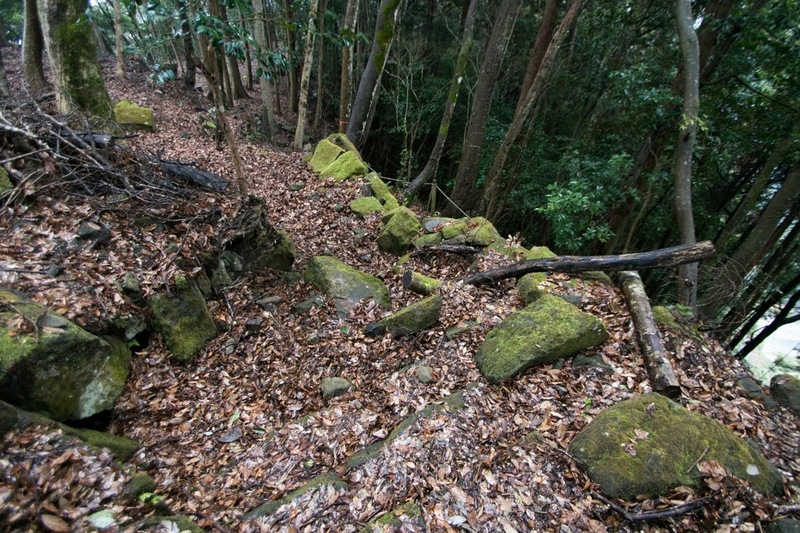 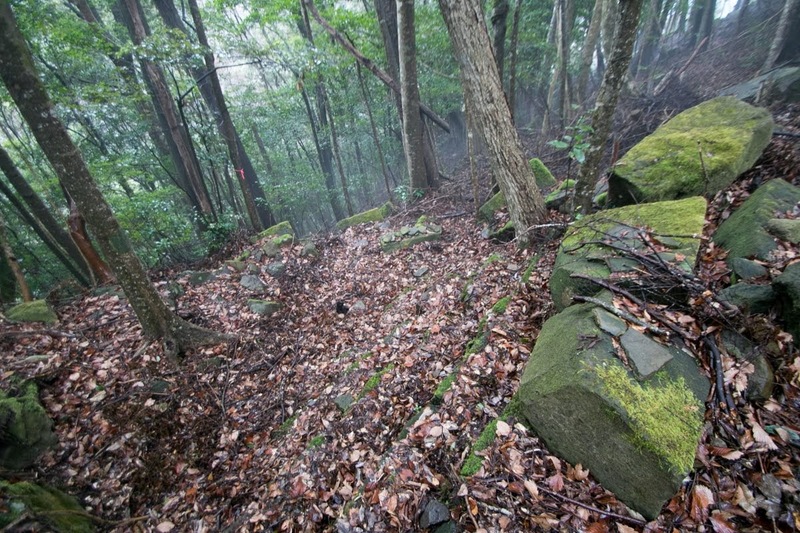 The north and east slope of hilltop area is protected by vertical rock wall of over 20 meter, and the ruin of front side gate of hilltop area remains at this part but climbing road to this gate disappeared. 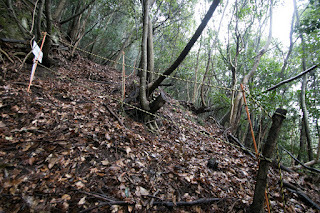 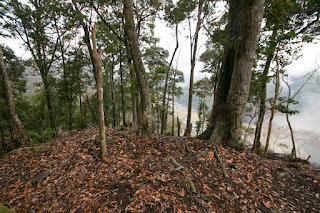 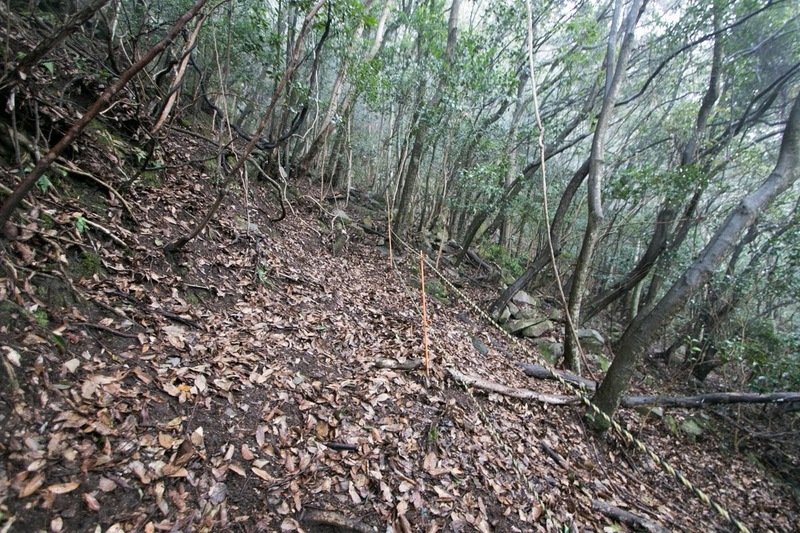 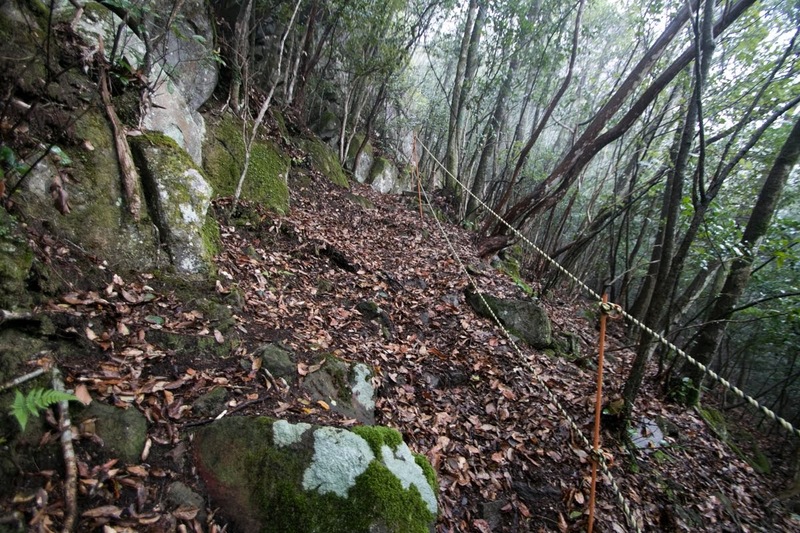 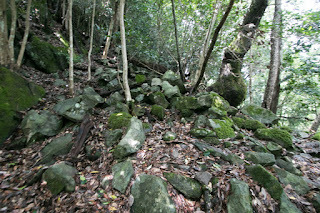 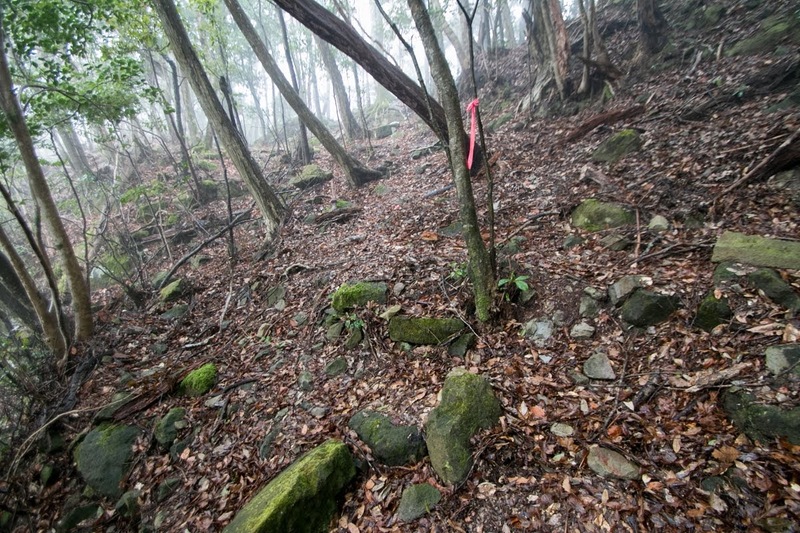 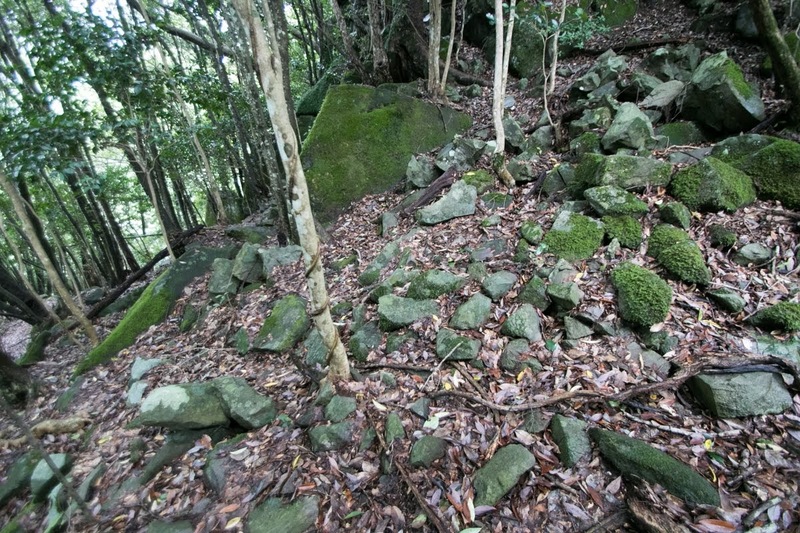 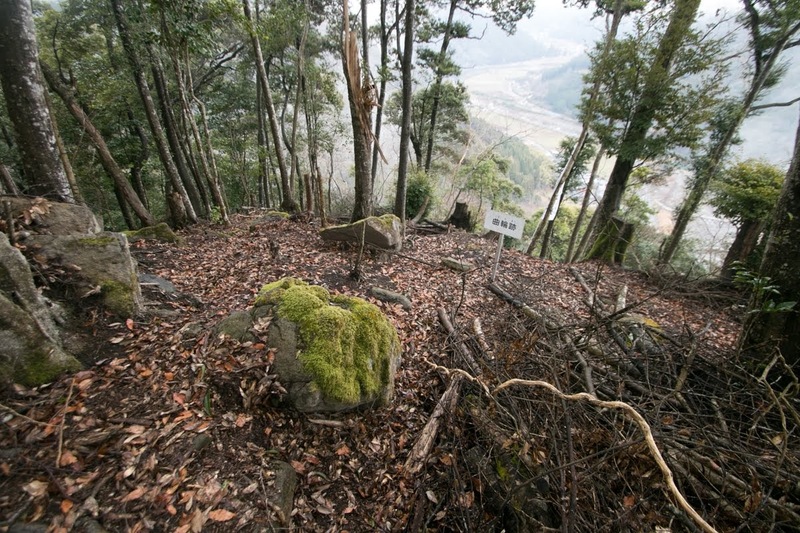 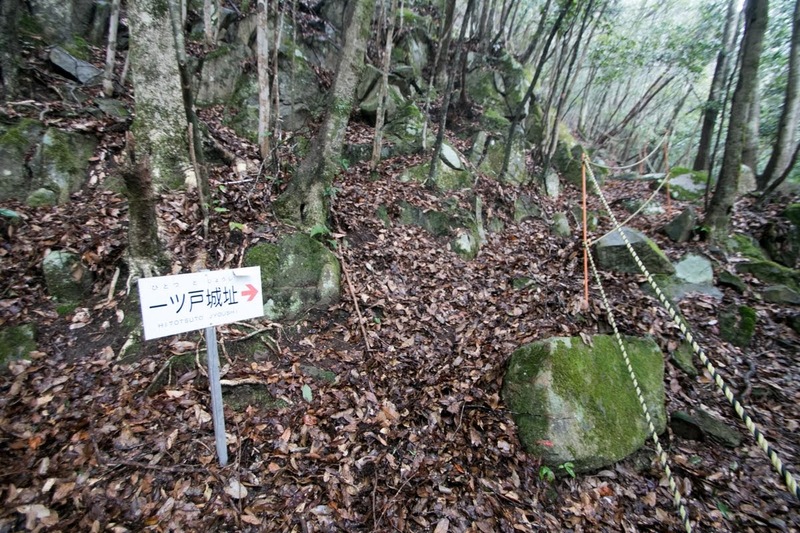 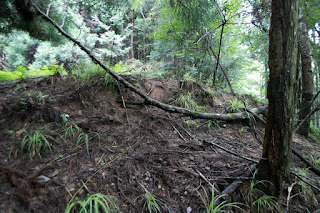 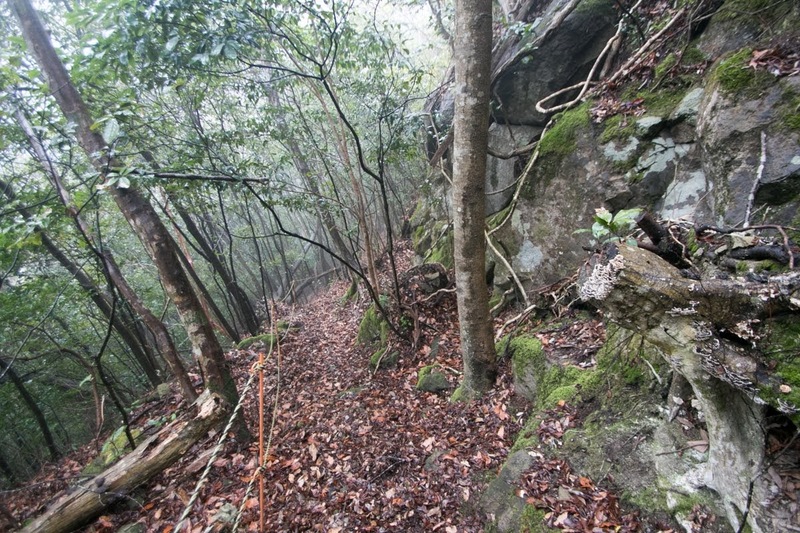 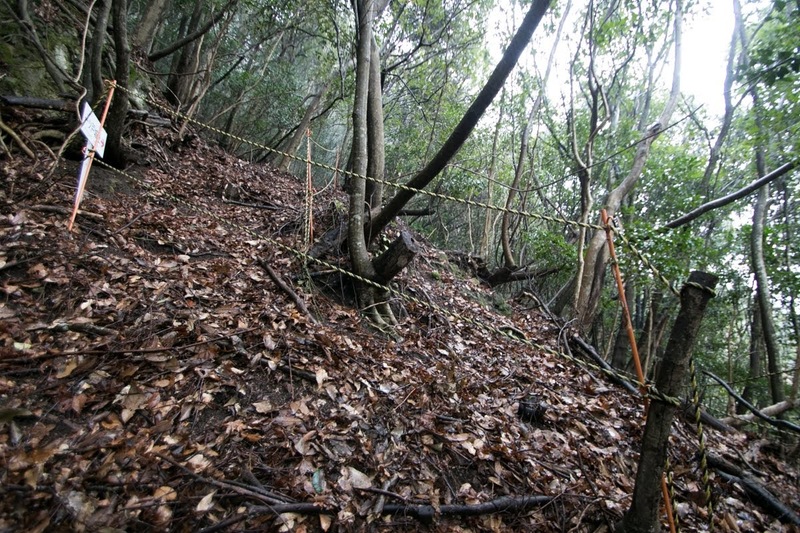 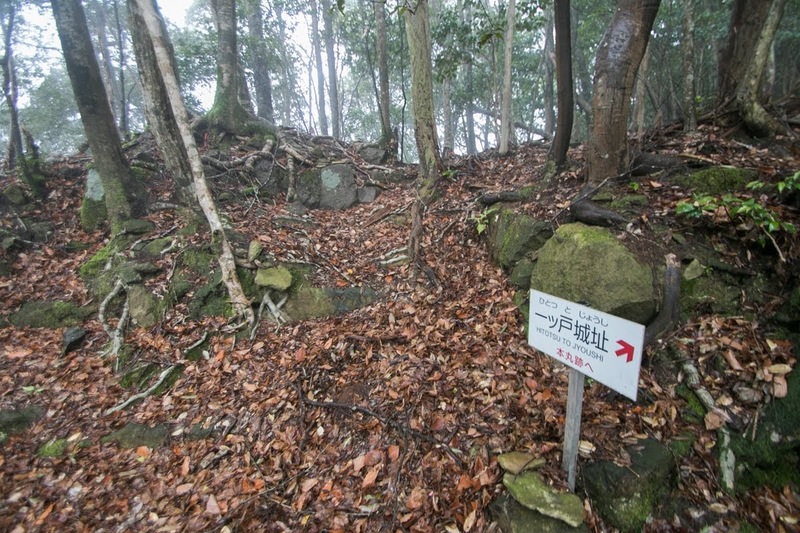 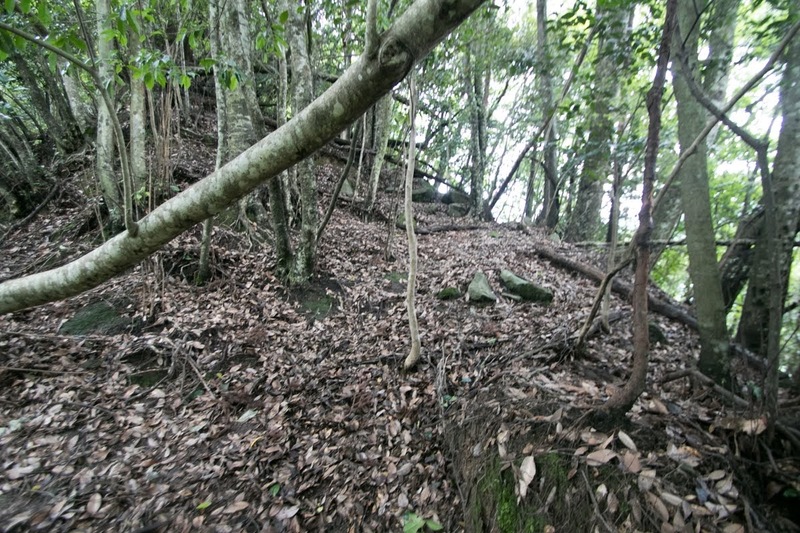 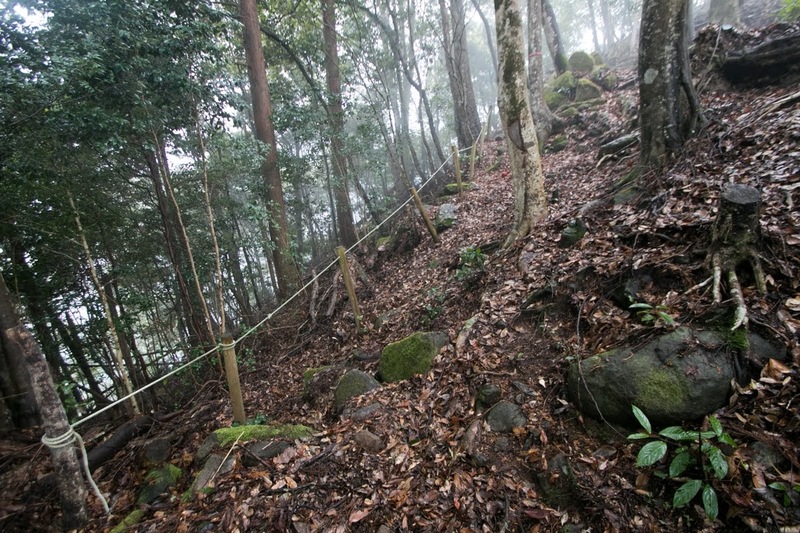 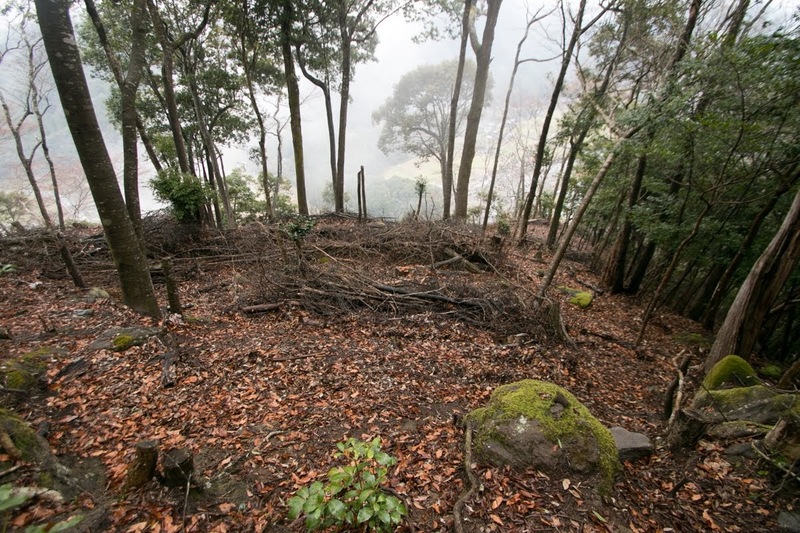 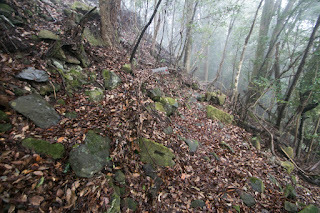 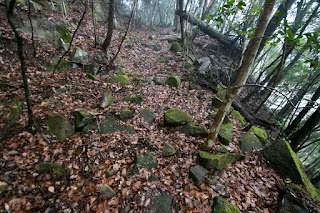 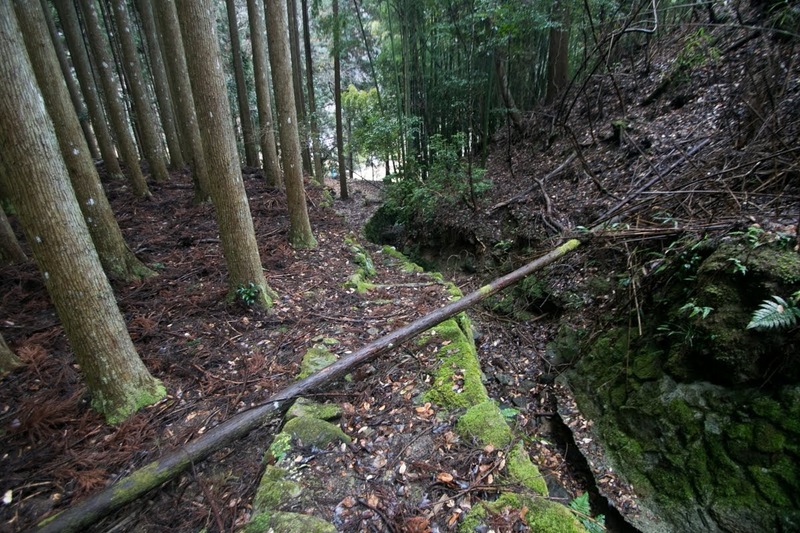 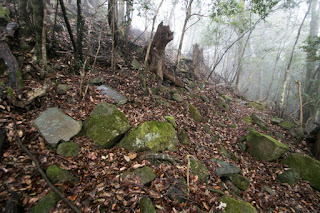 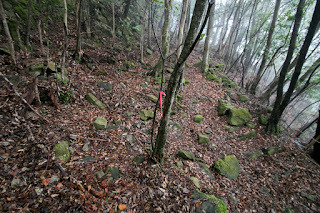 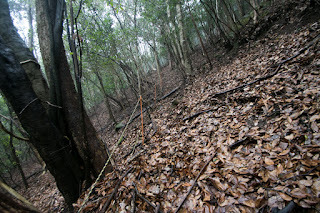 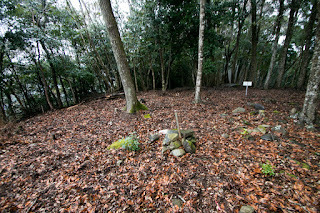 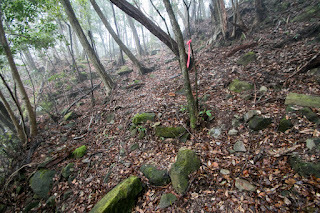 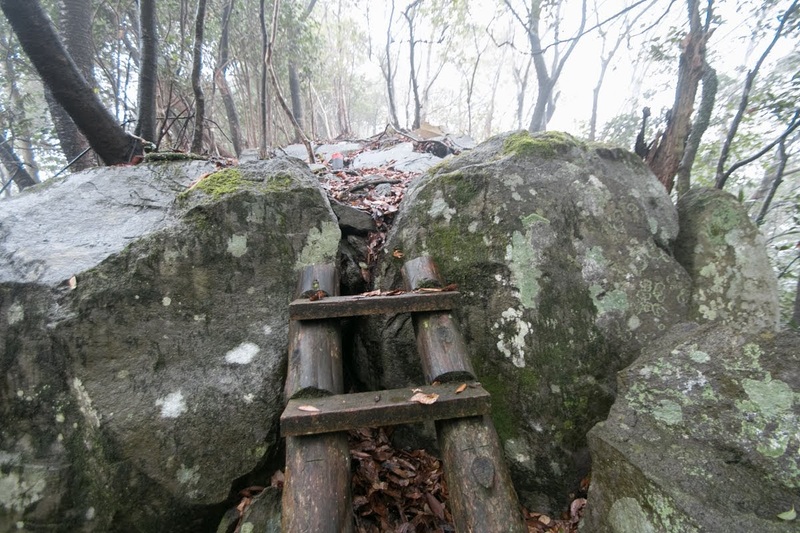 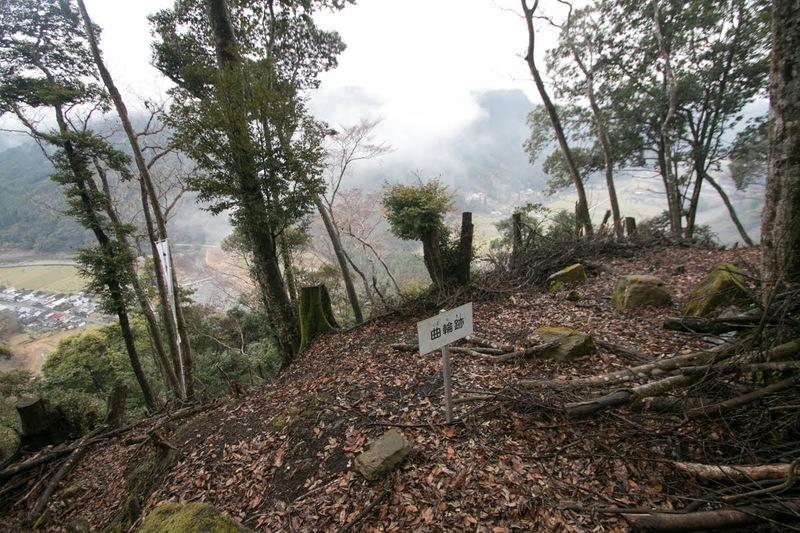 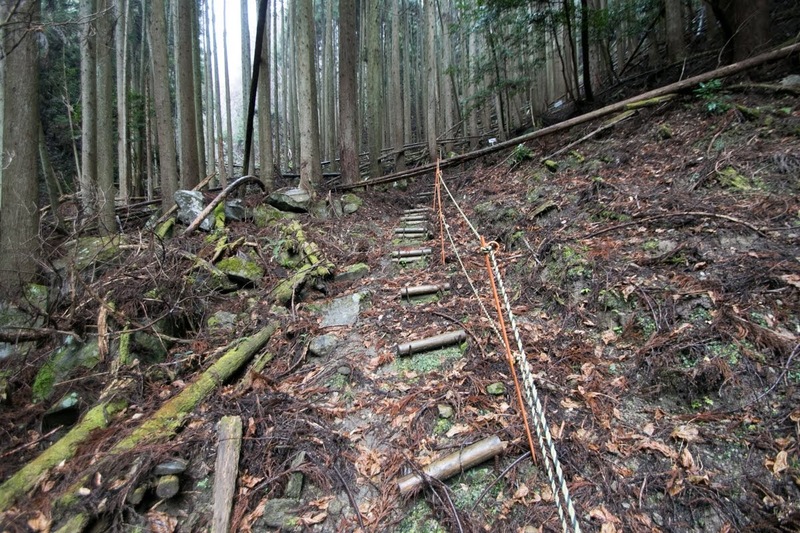 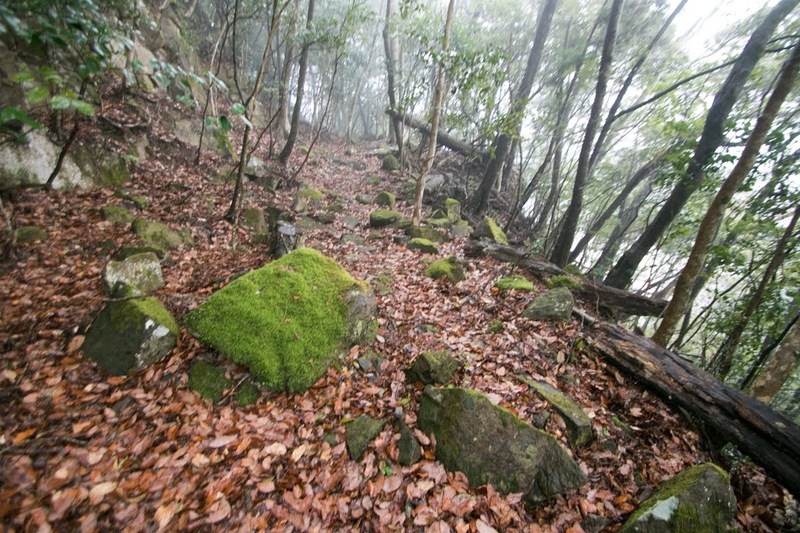 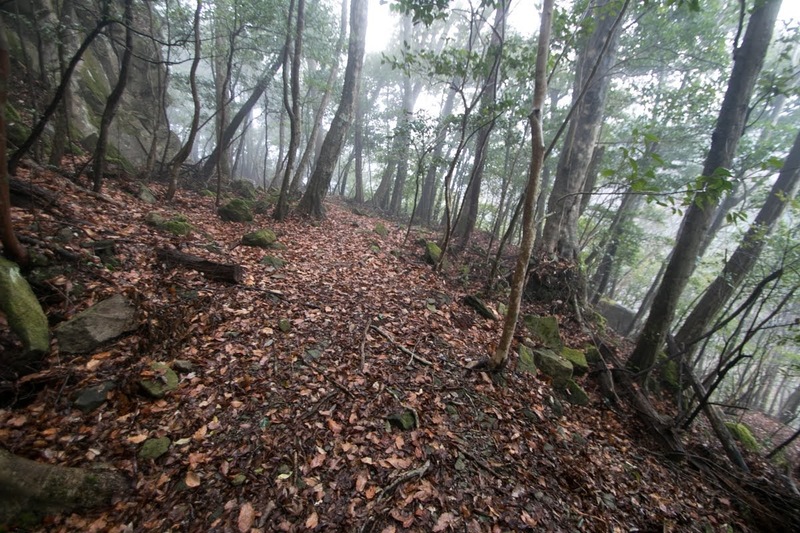 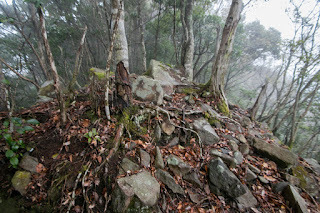 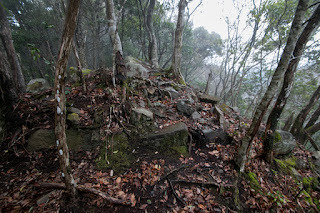 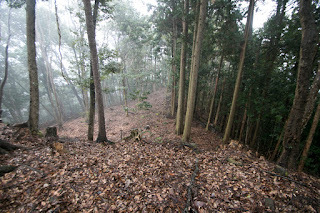 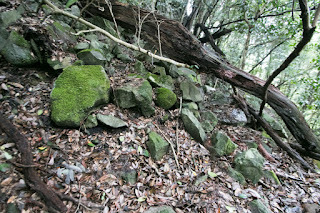 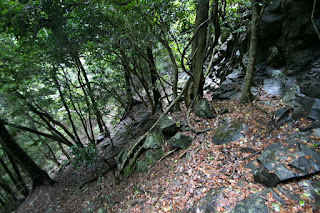 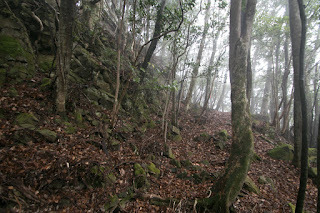 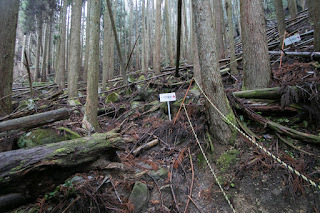 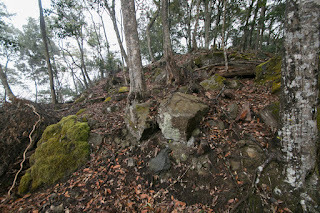 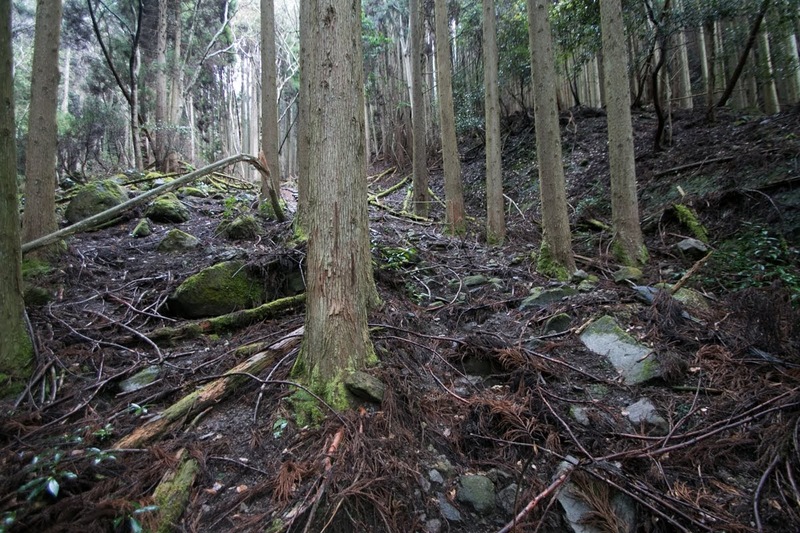 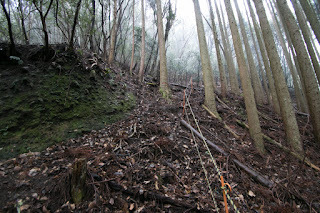 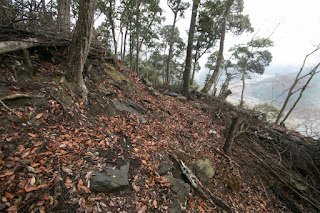 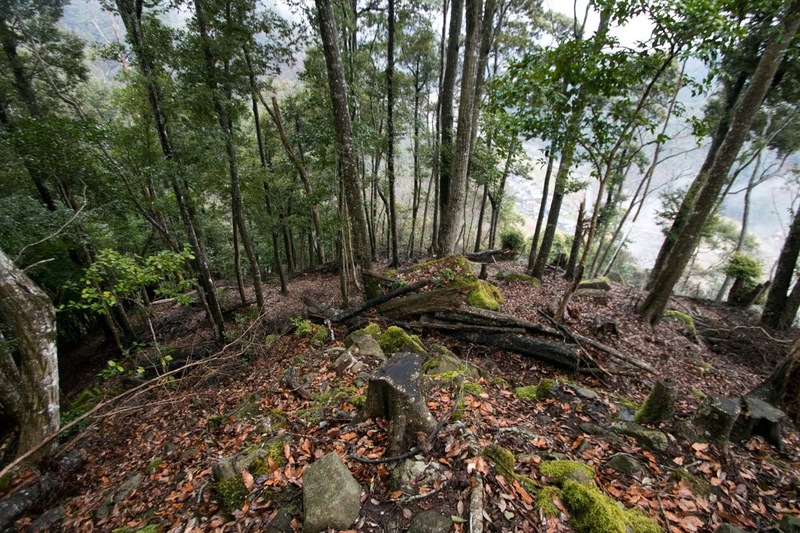 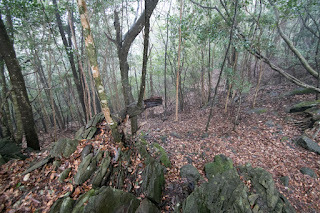 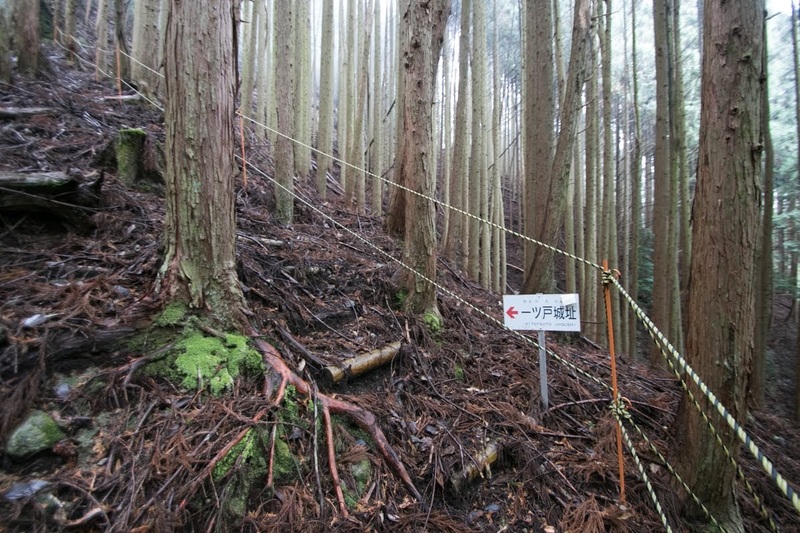 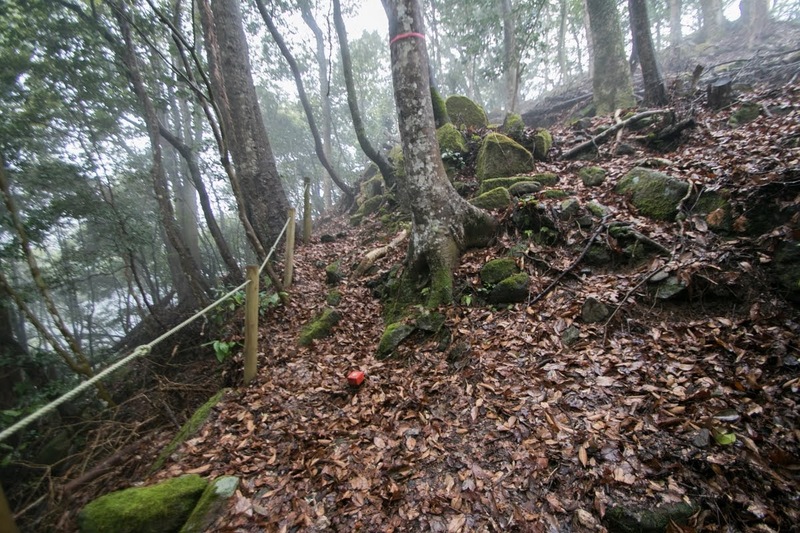 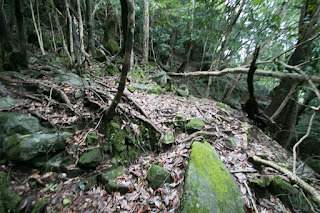 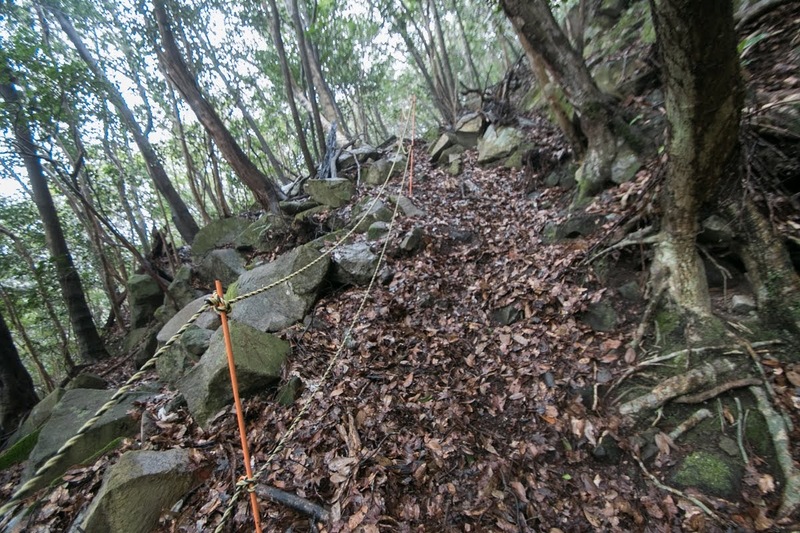 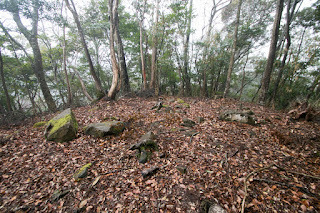 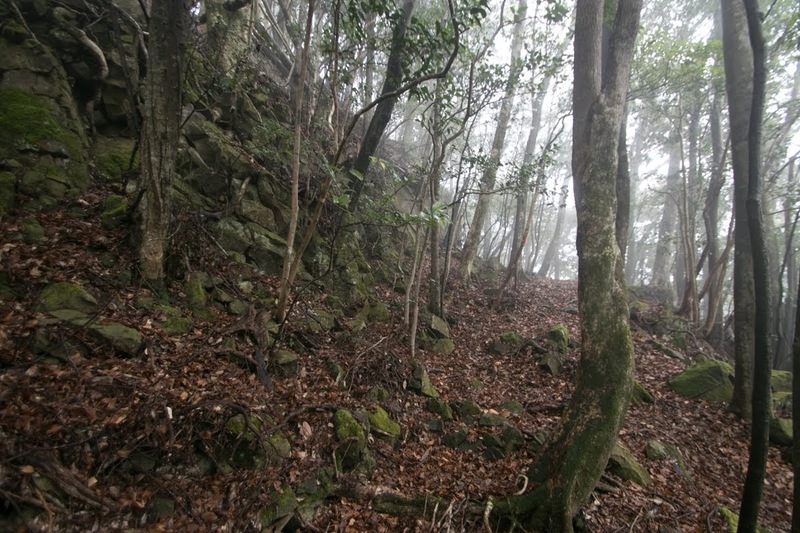 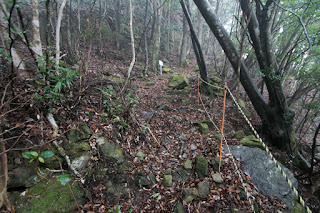 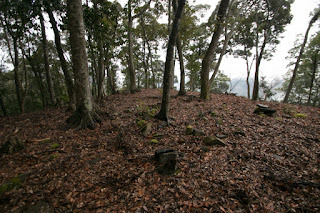 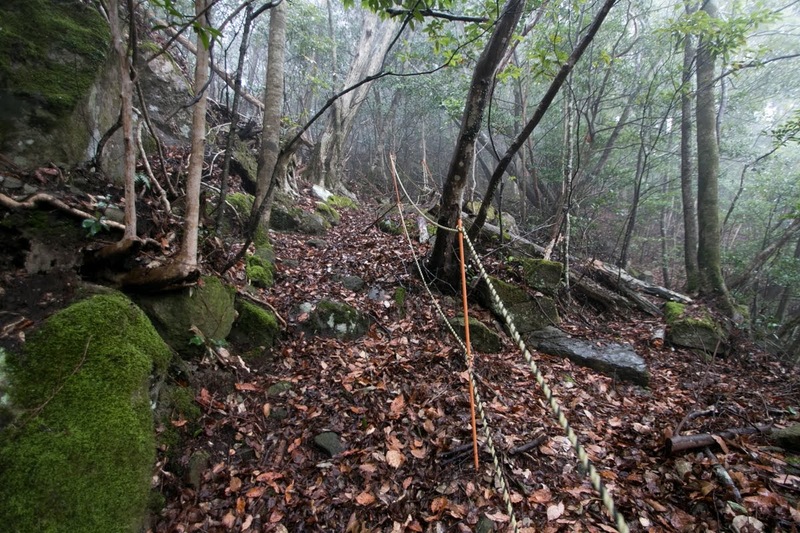 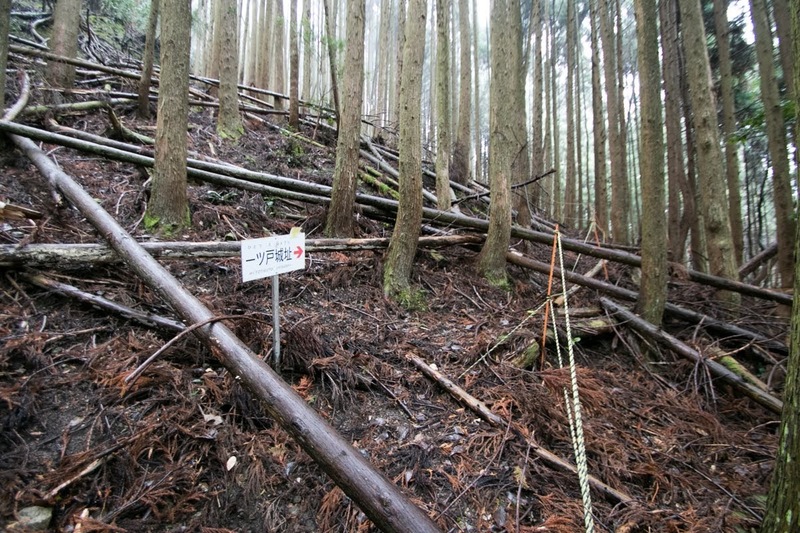 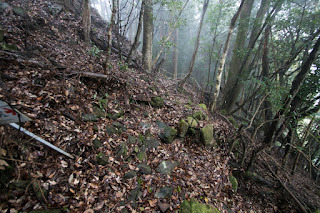 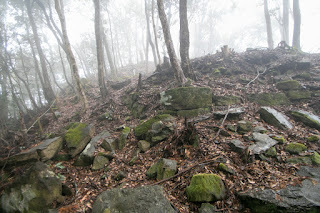 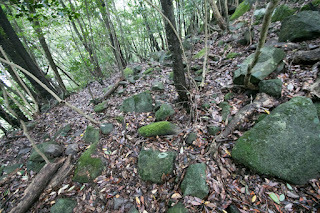 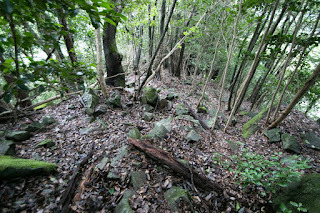 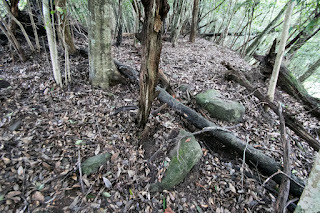 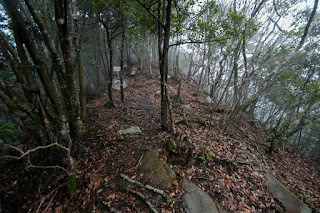 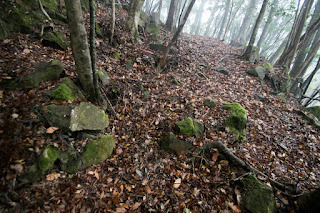 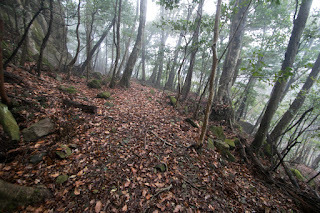 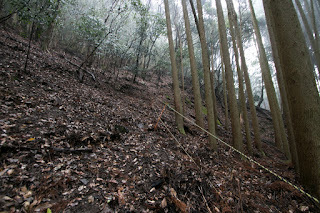 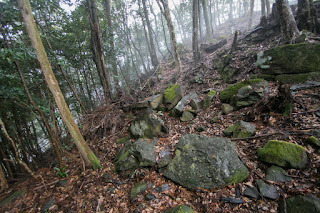 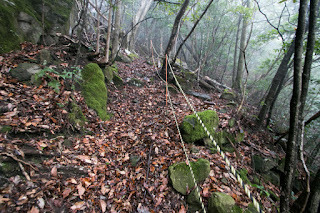 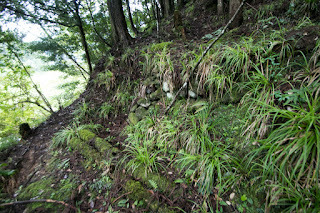 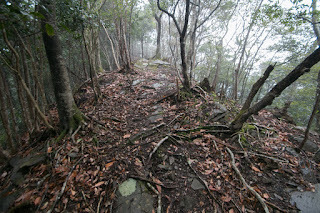 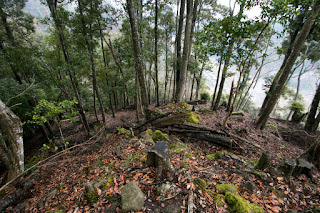 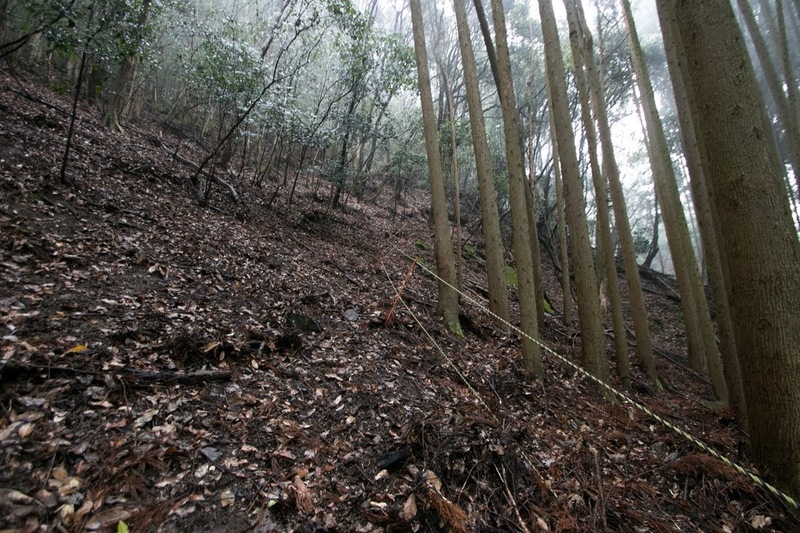 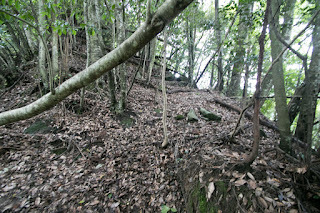 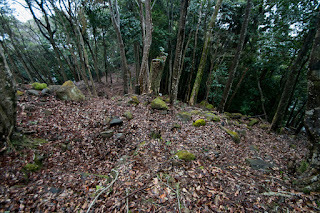 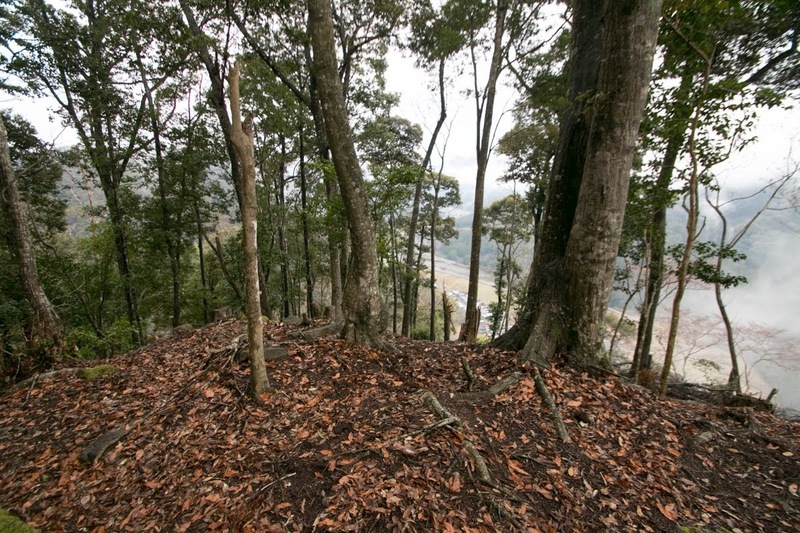 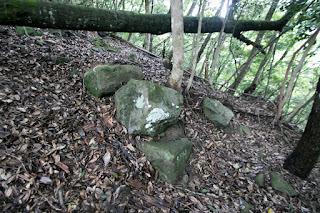 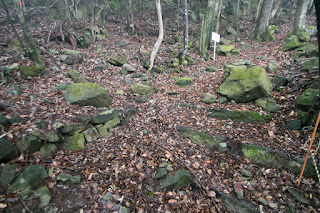 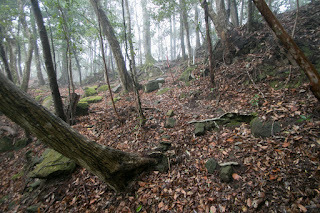 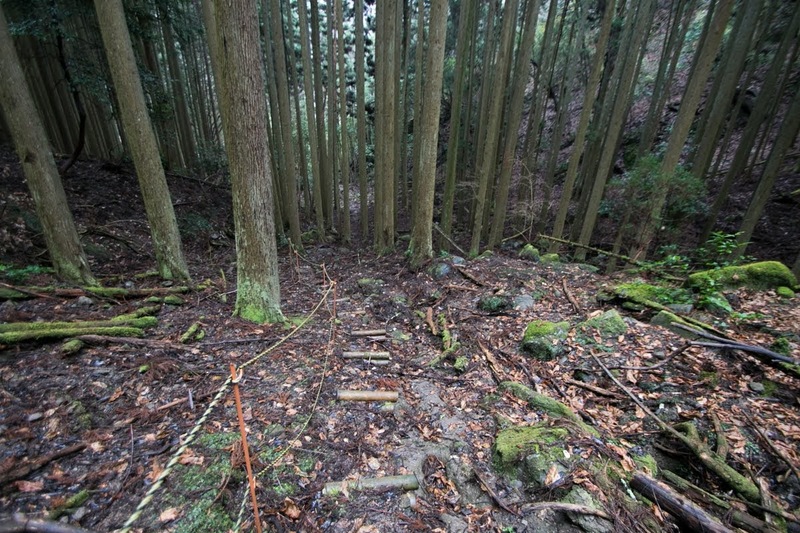 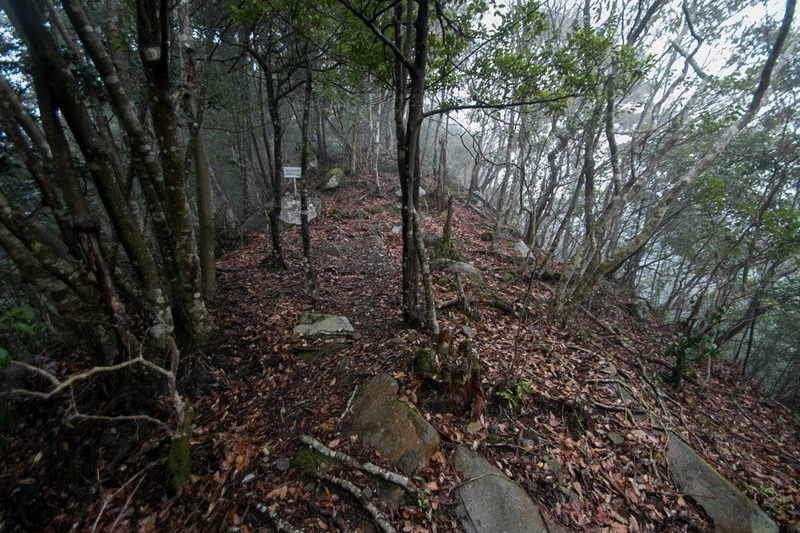 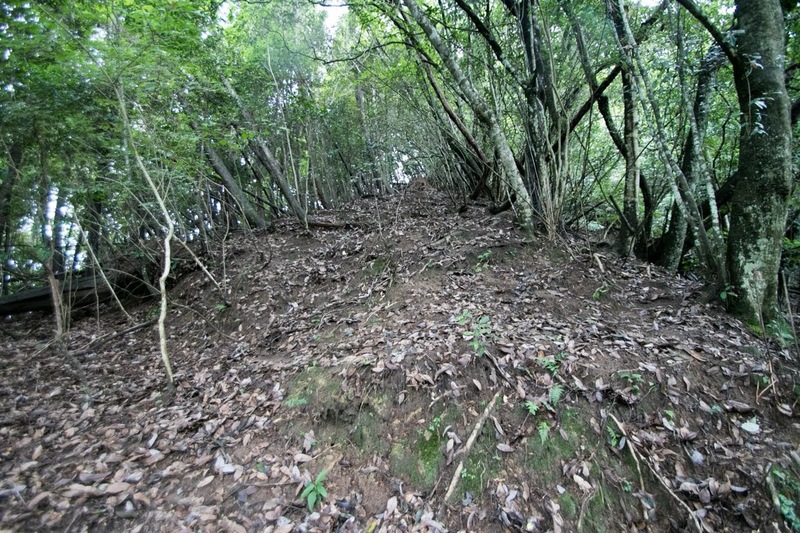 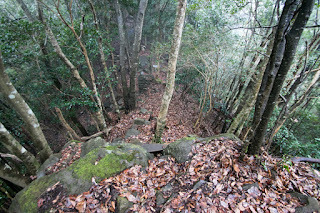 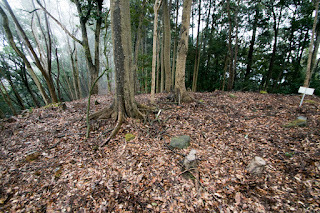 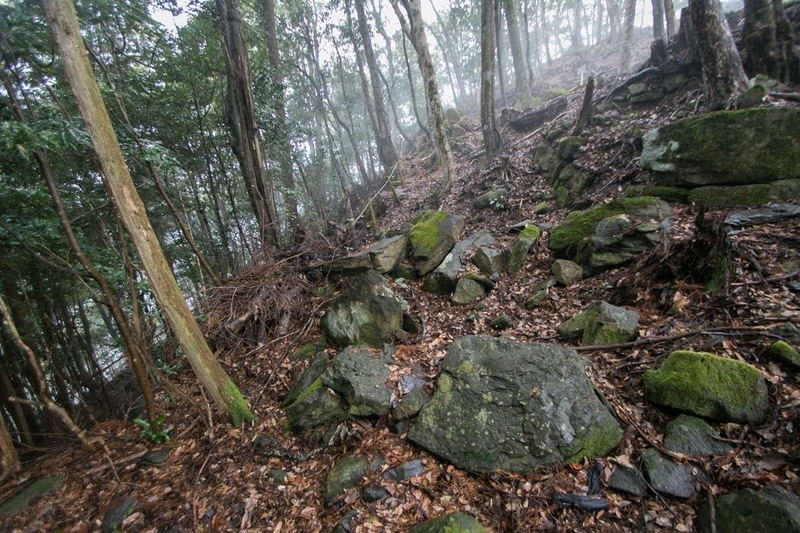 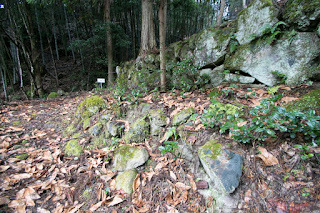 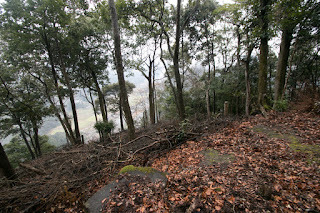 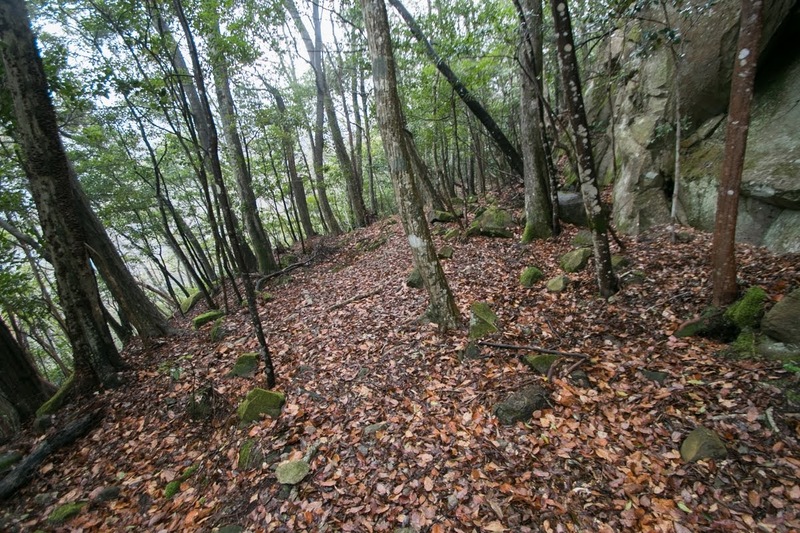 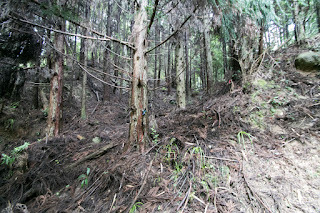 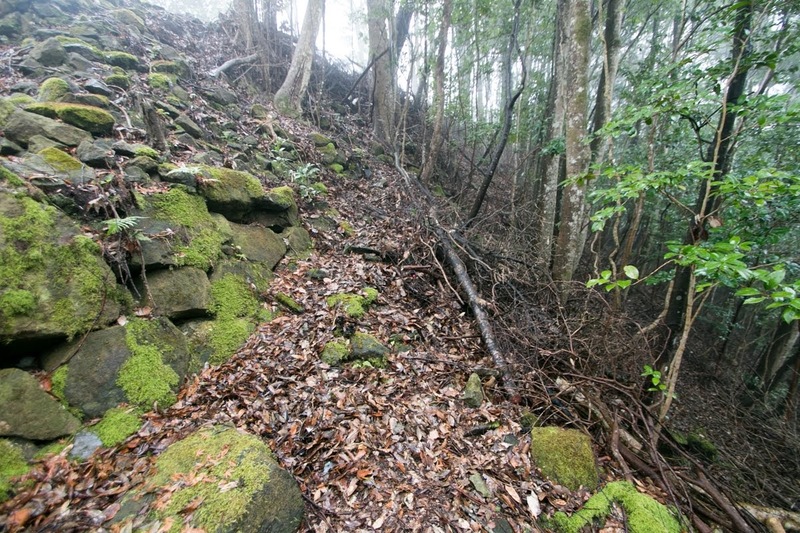 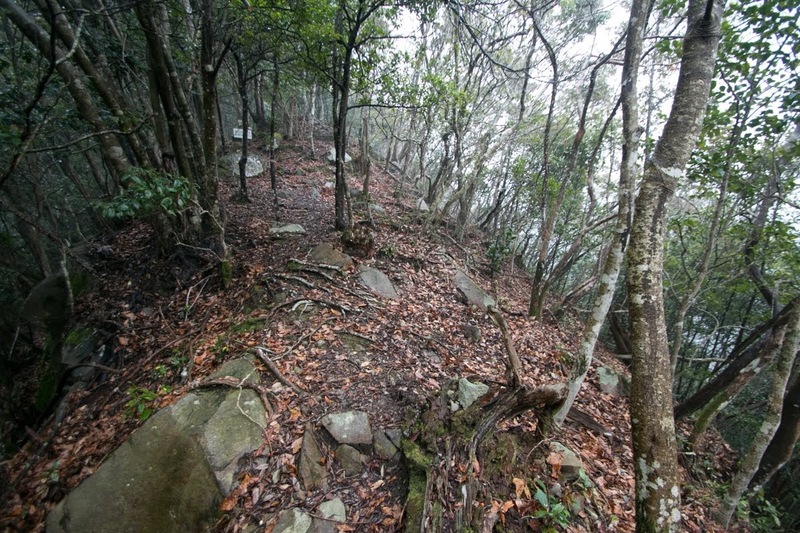 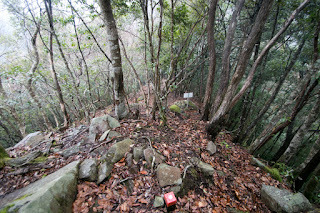 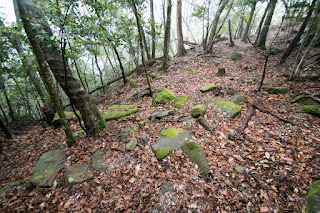 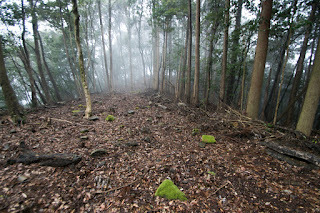 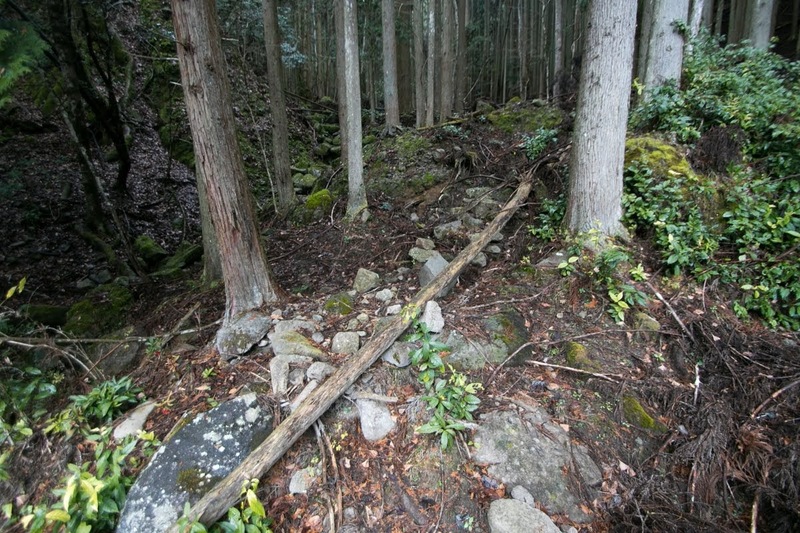 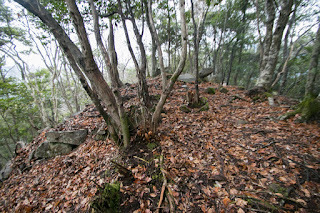 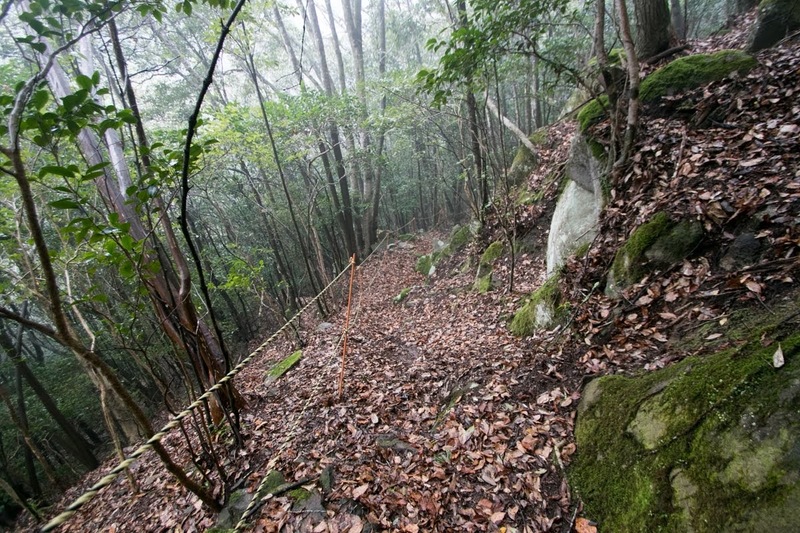 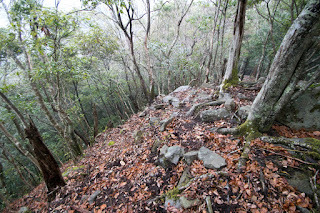 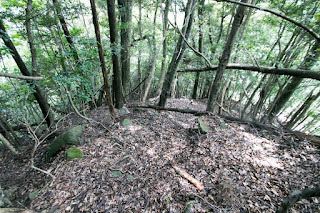 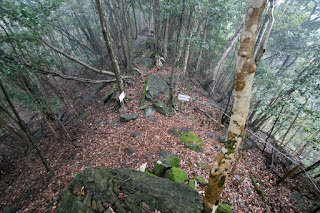 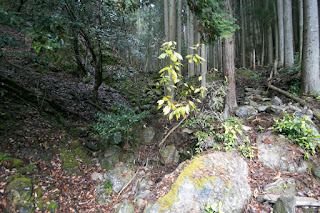 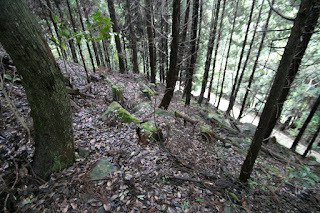 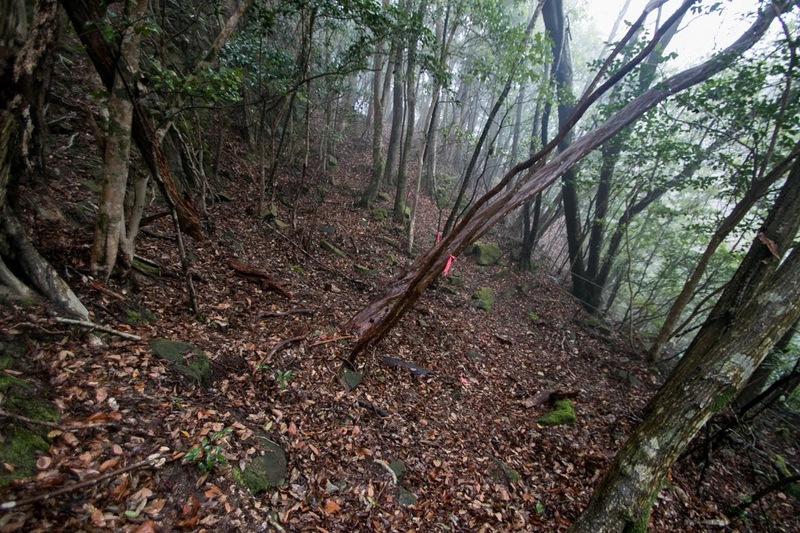 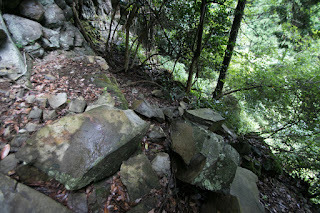 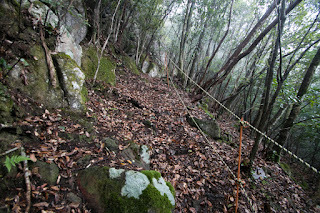 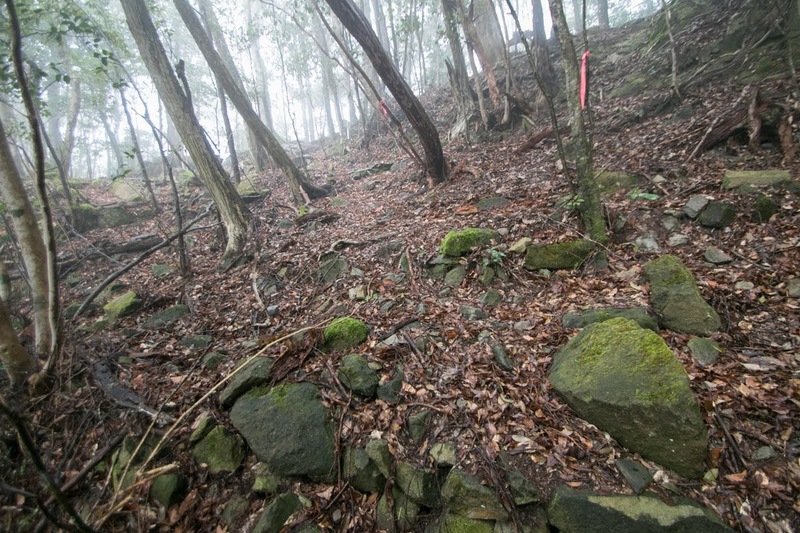 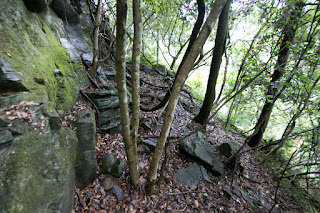 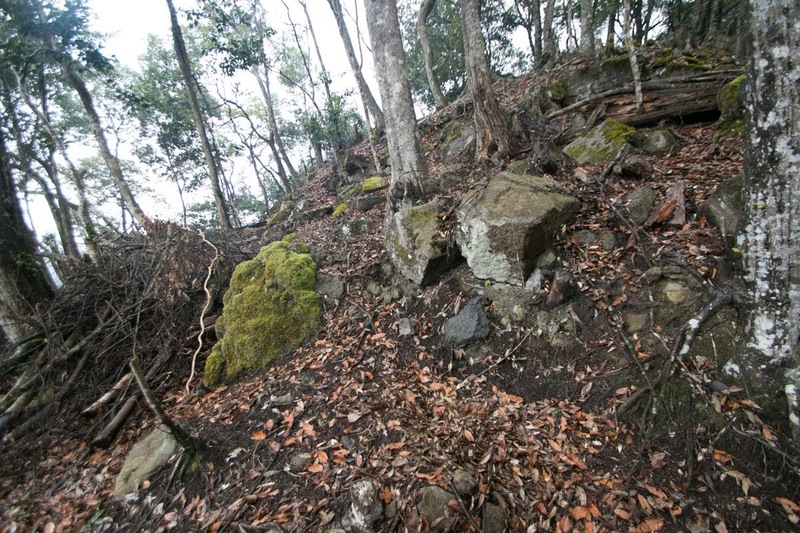 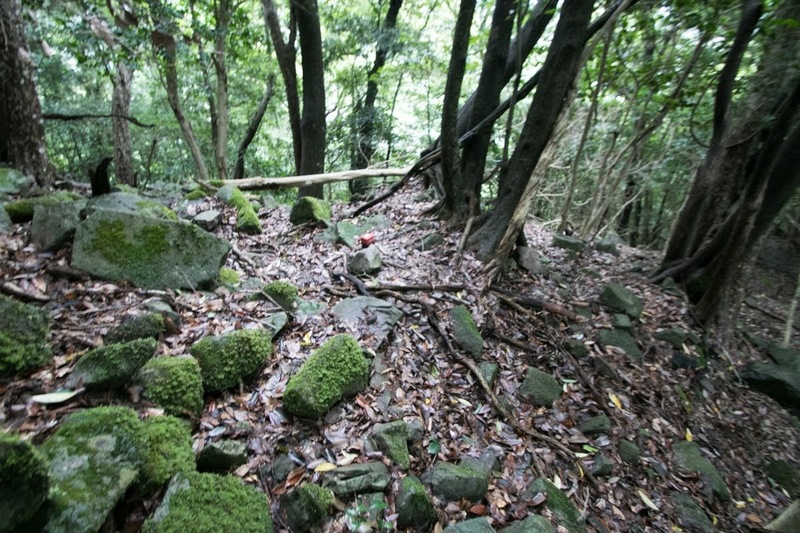 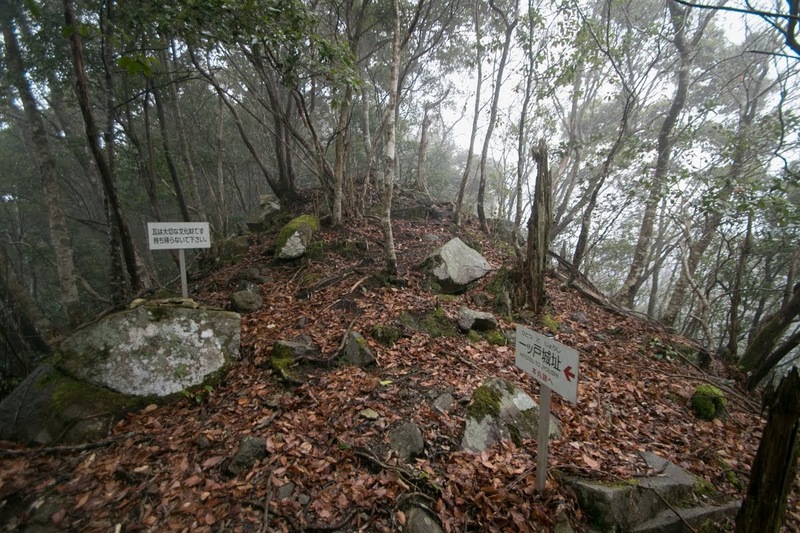 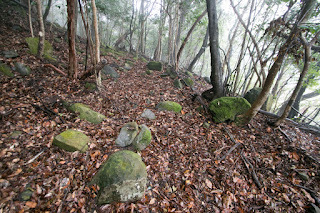 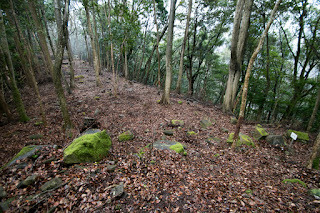 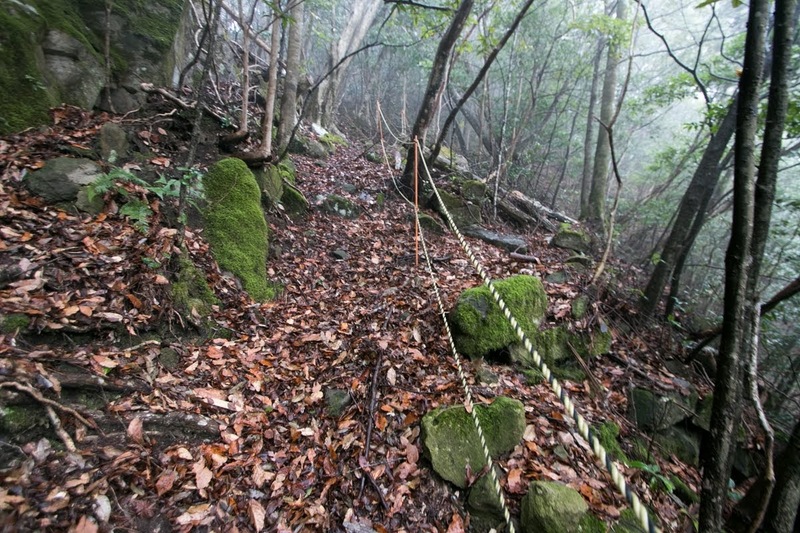 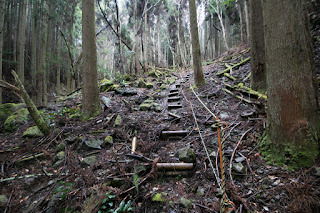 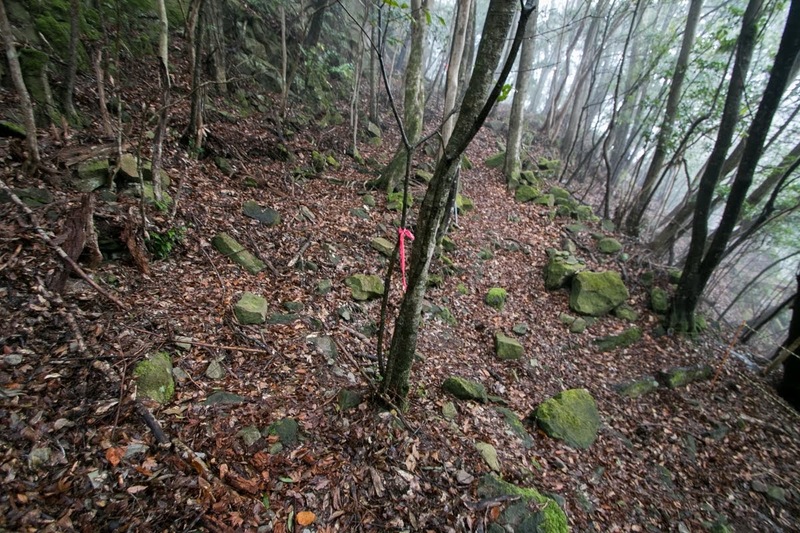 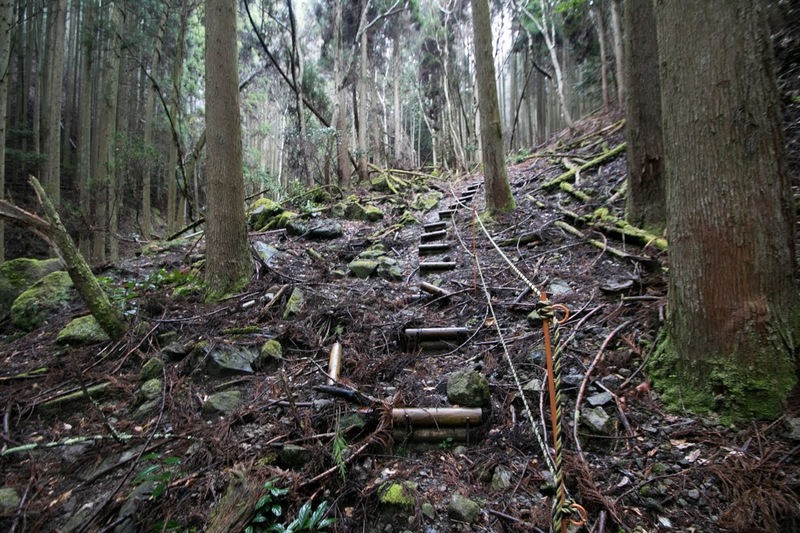 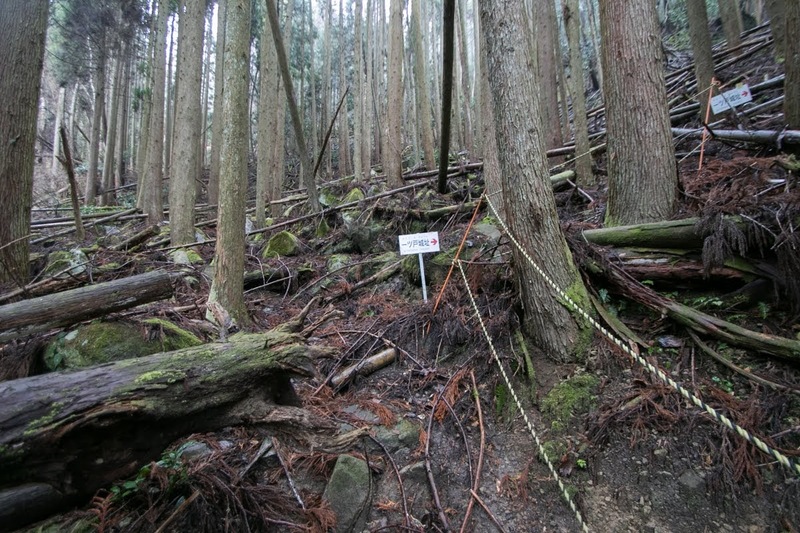 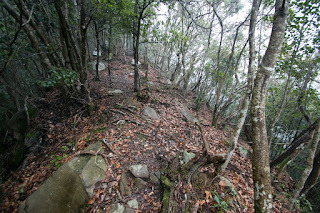 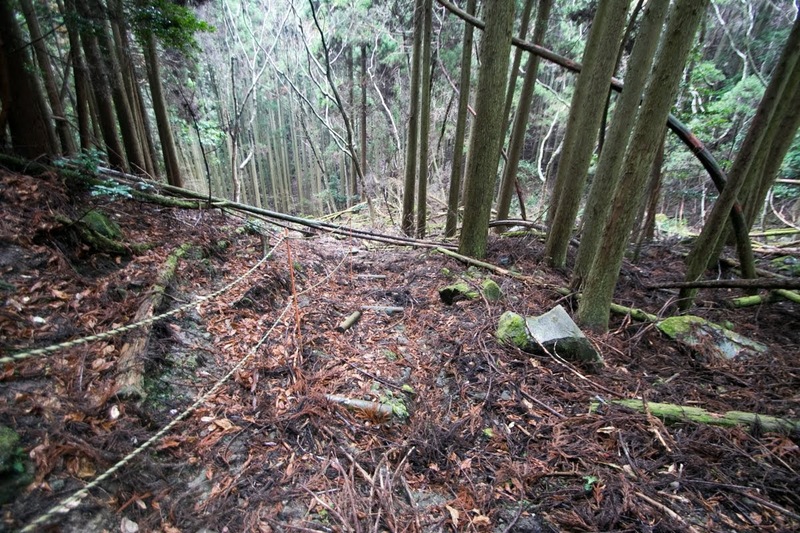 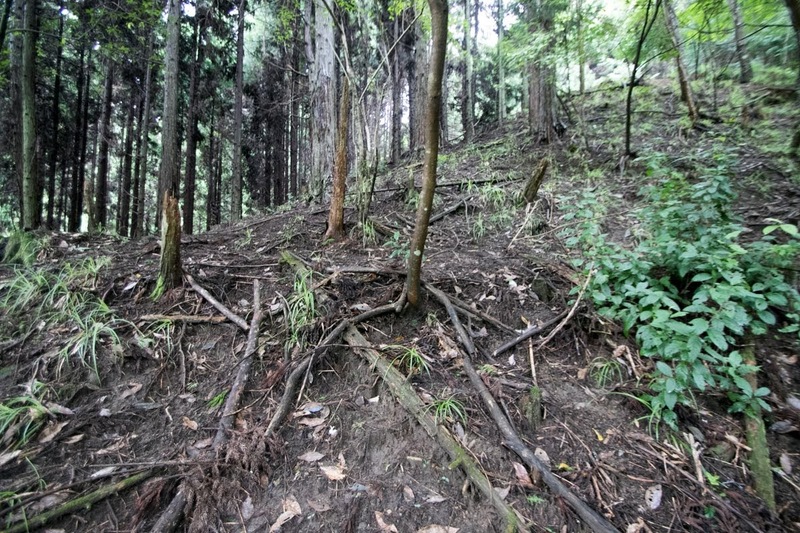 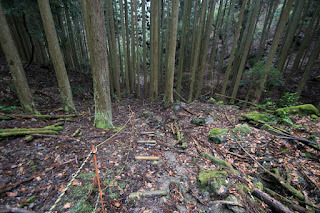 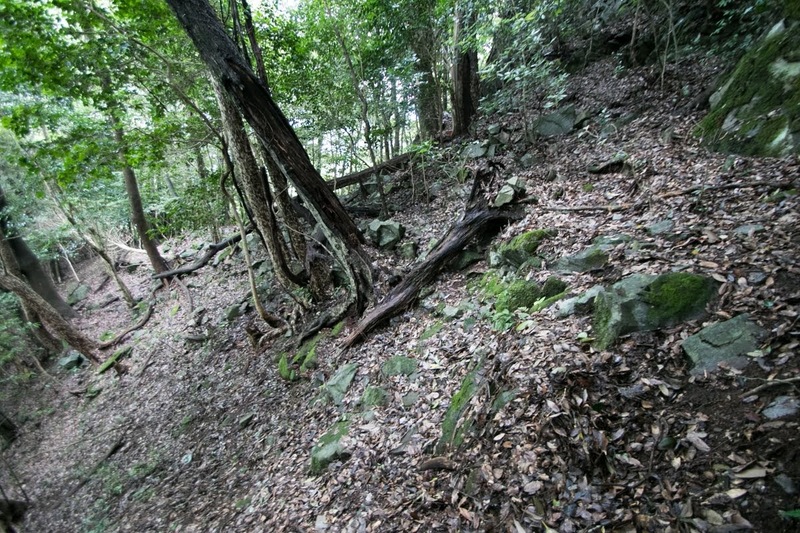 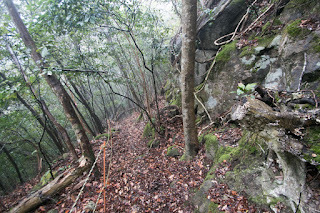 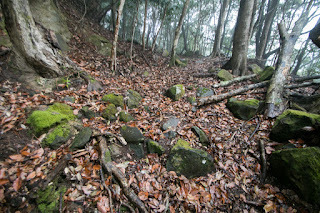 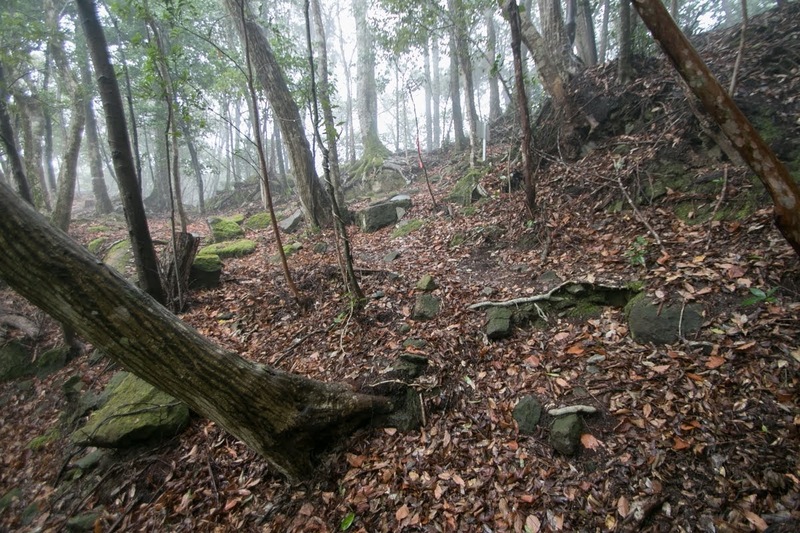 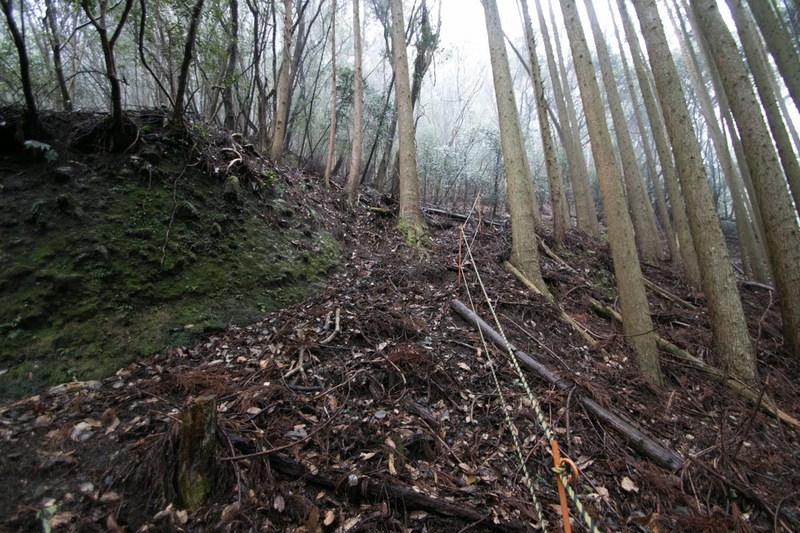 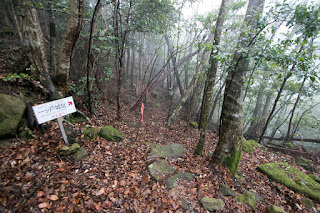 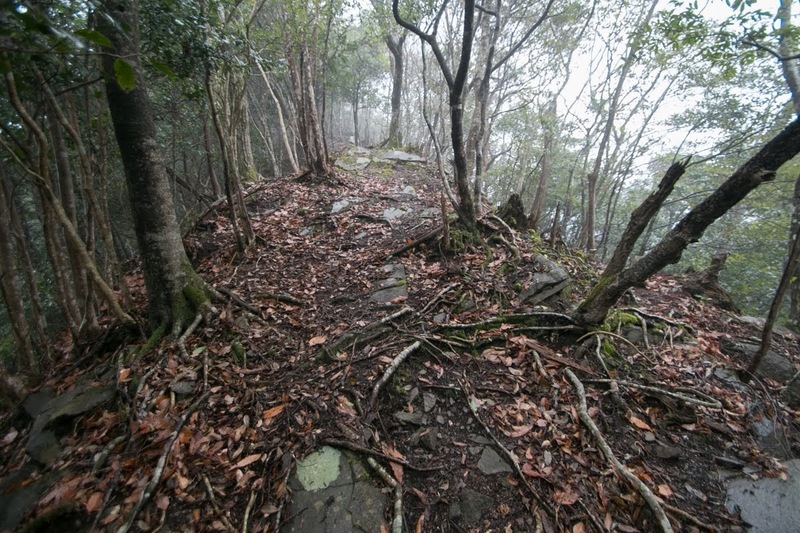 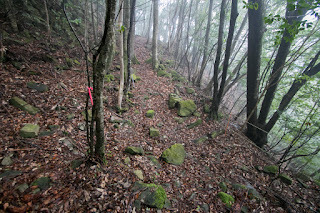 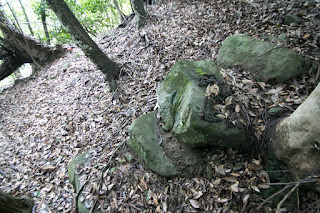 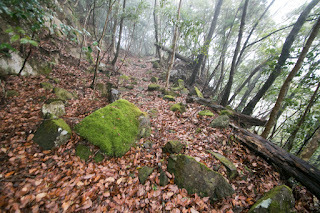 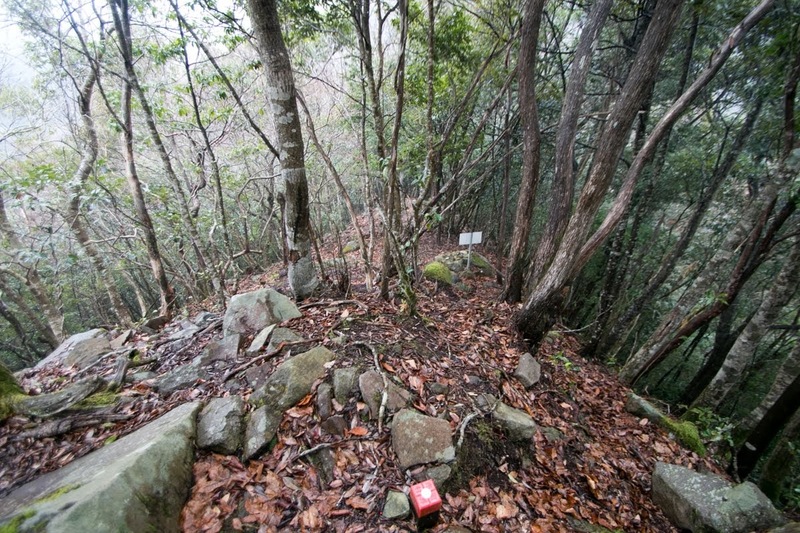 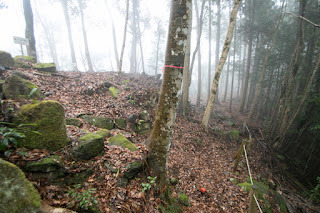 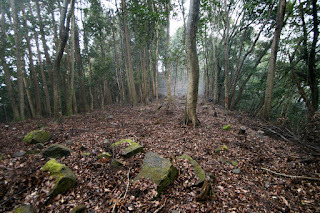 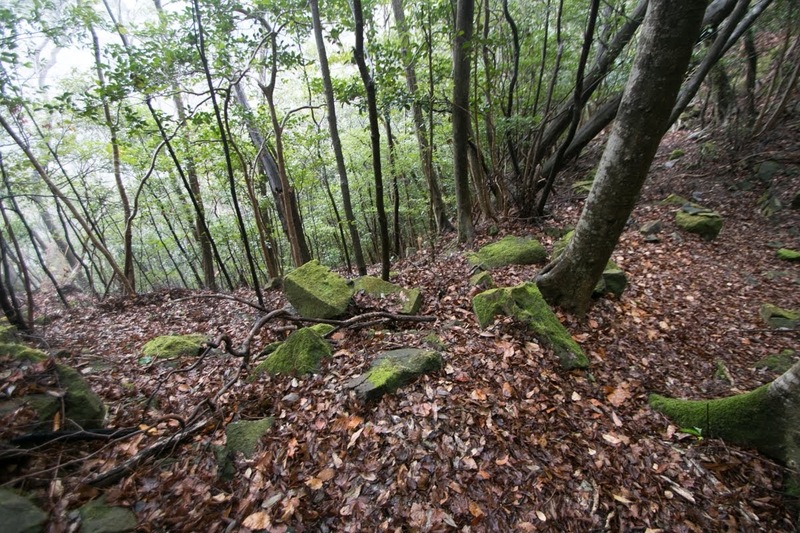 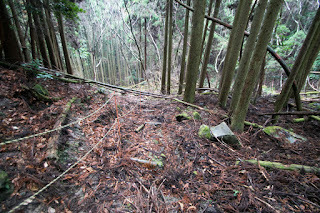 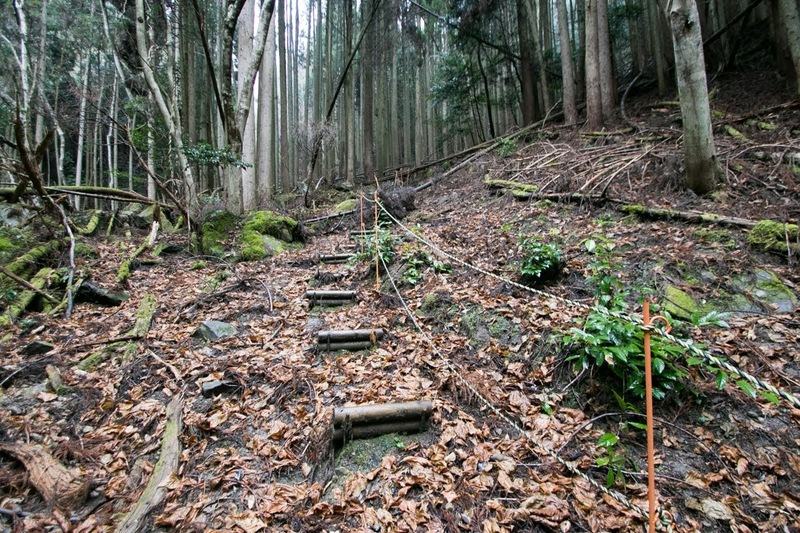 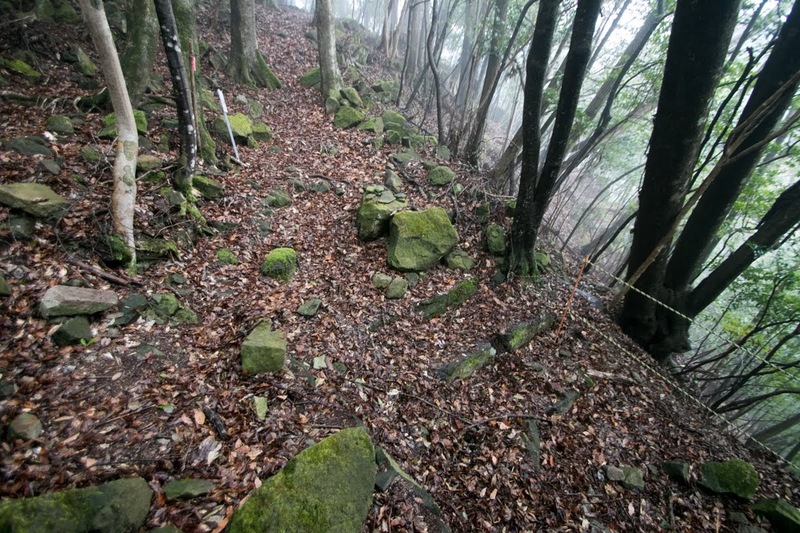 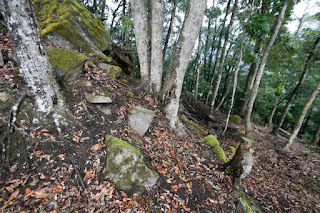 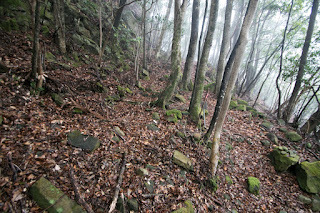 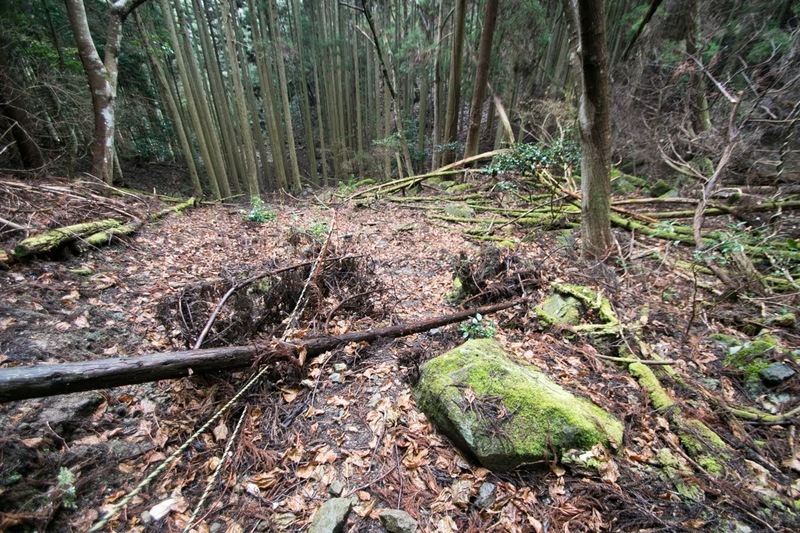 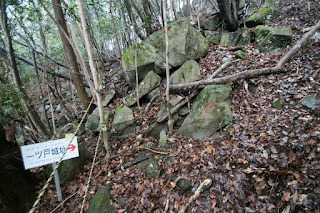 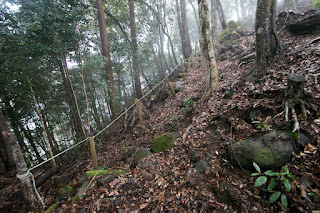 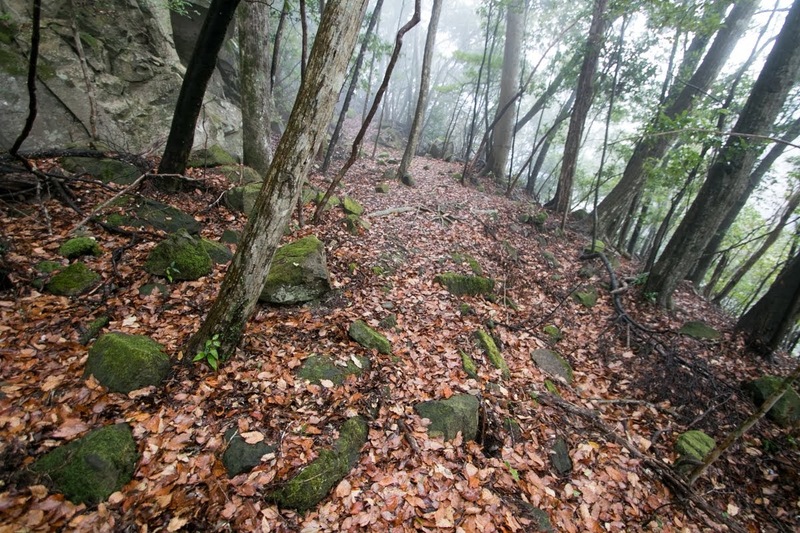 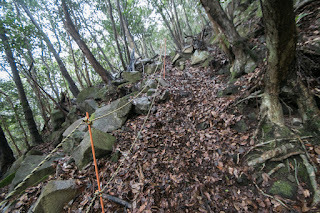 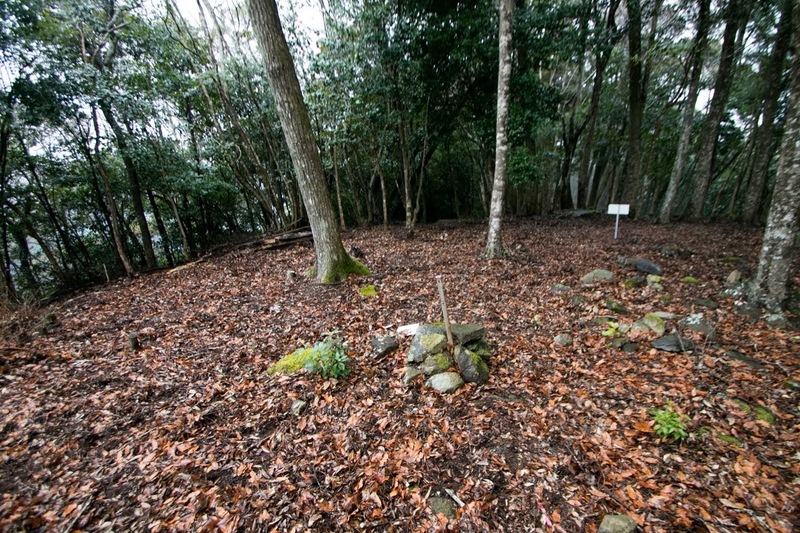 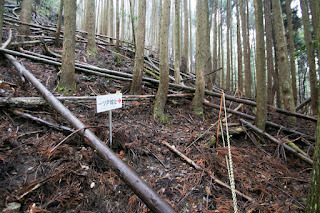 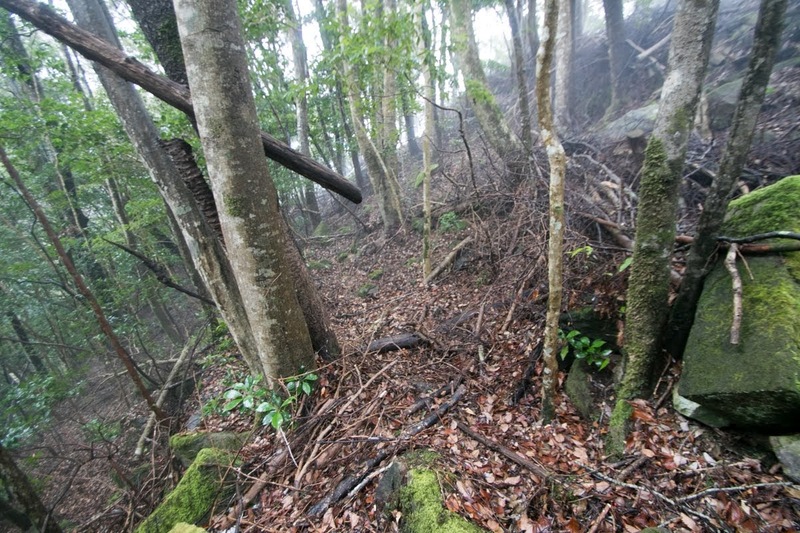 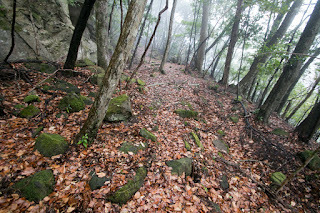 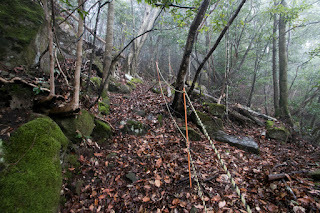 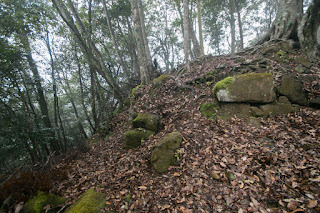 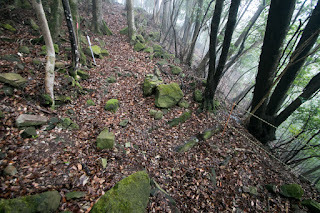 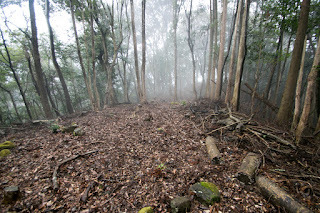 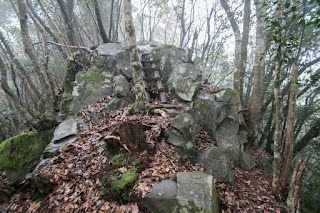 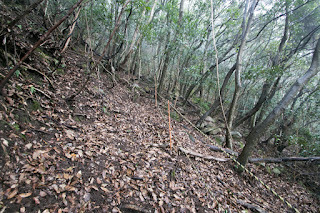 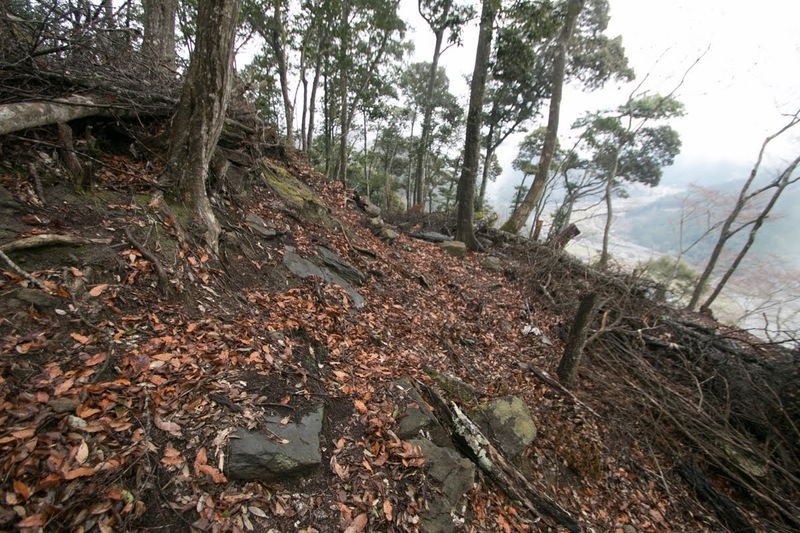 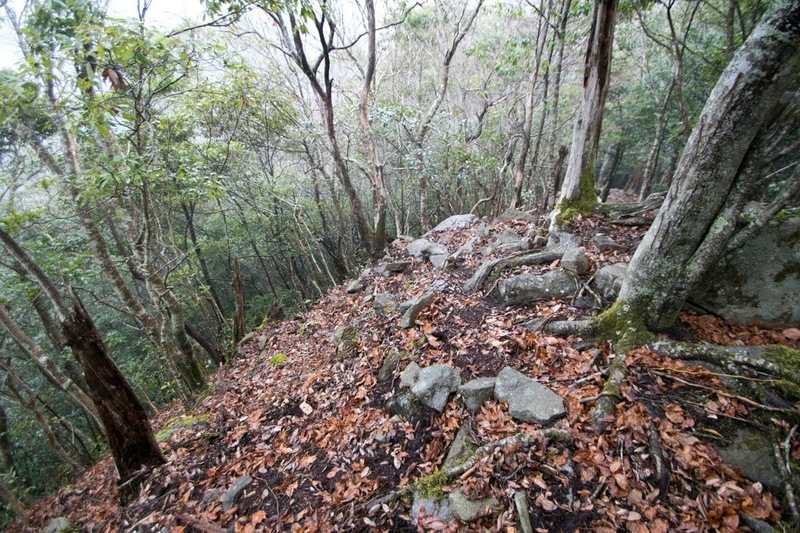 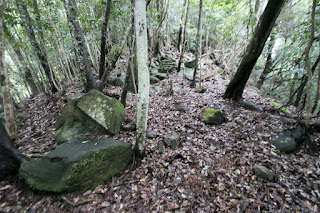 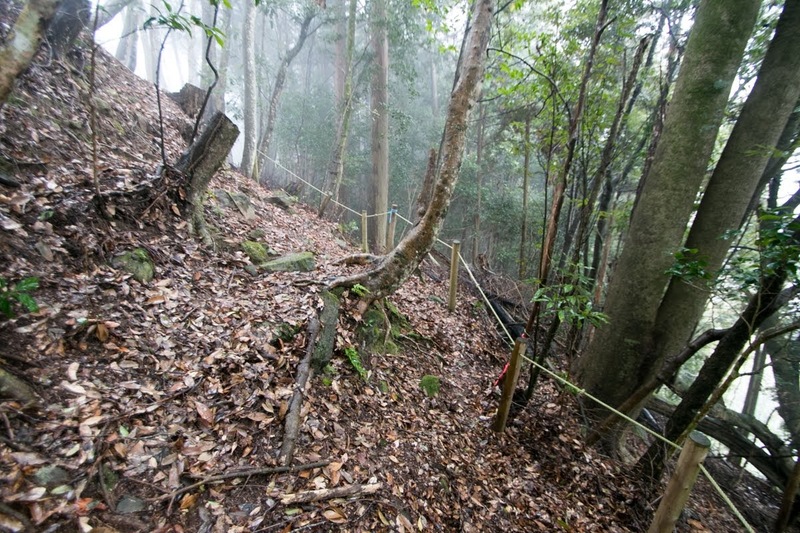 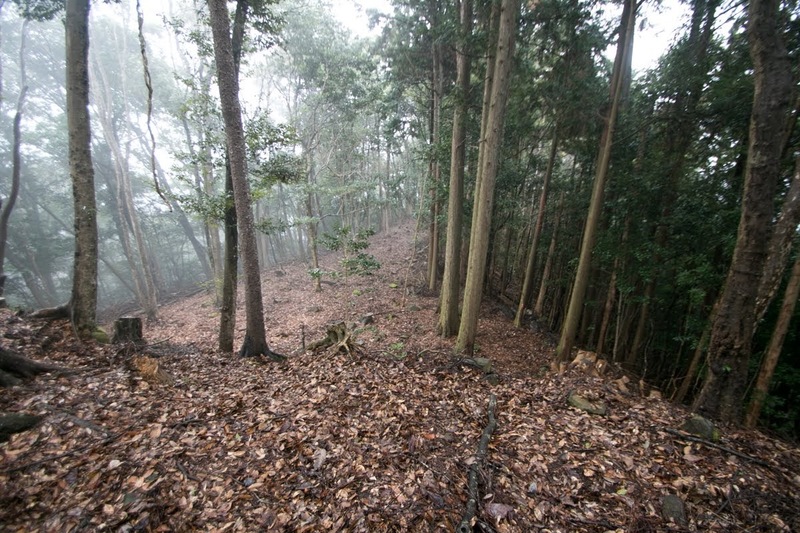 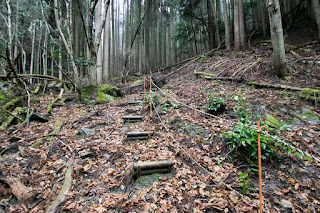 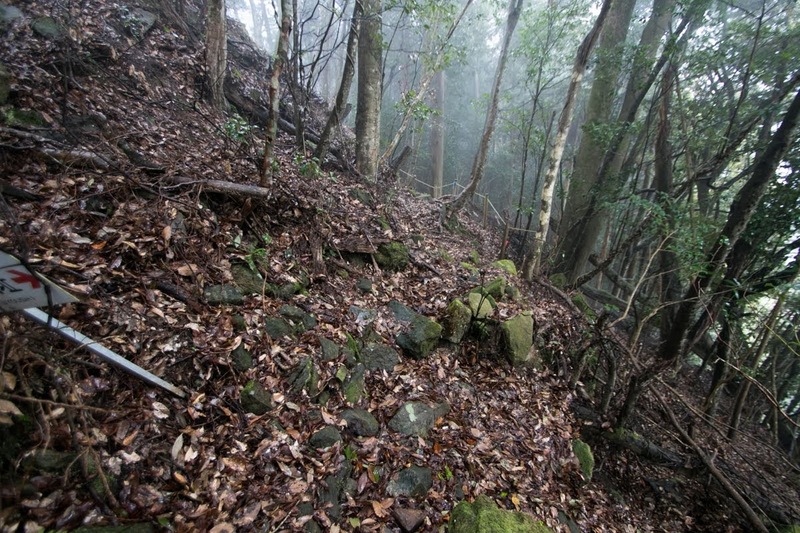 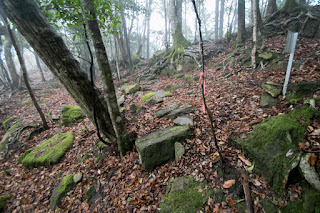 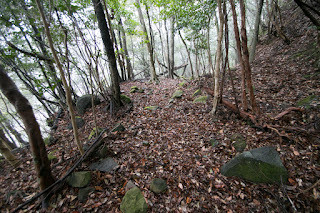 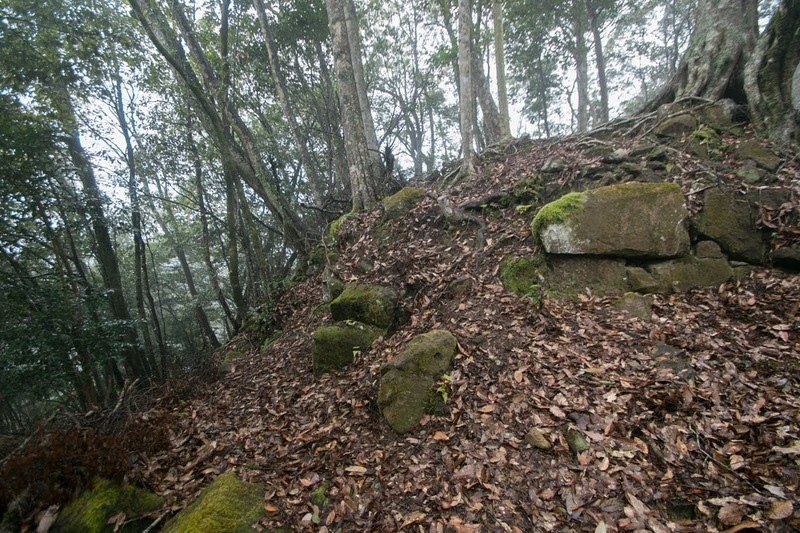 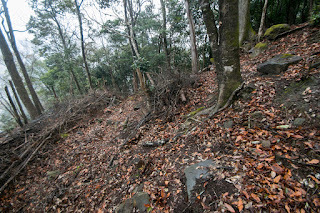 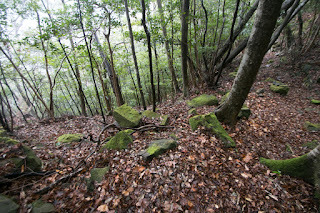 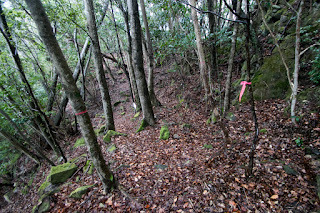 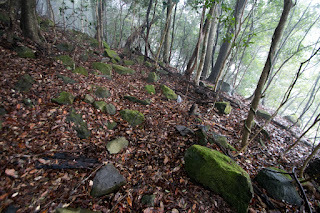 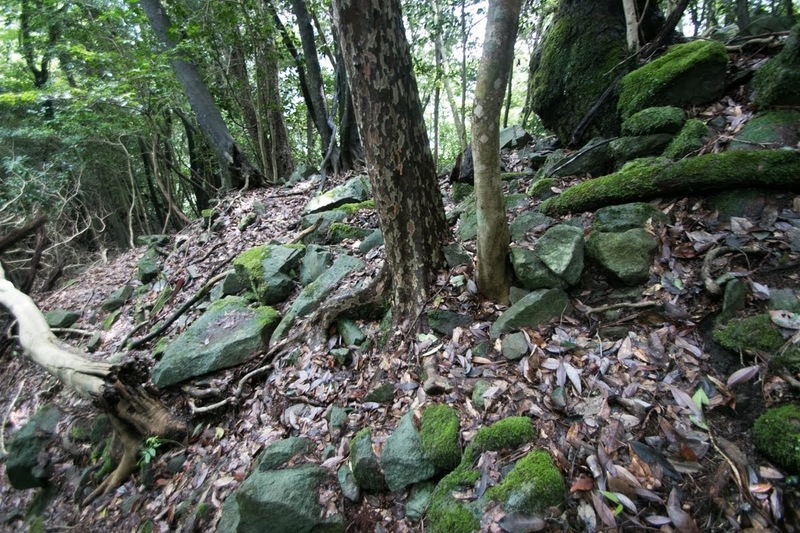 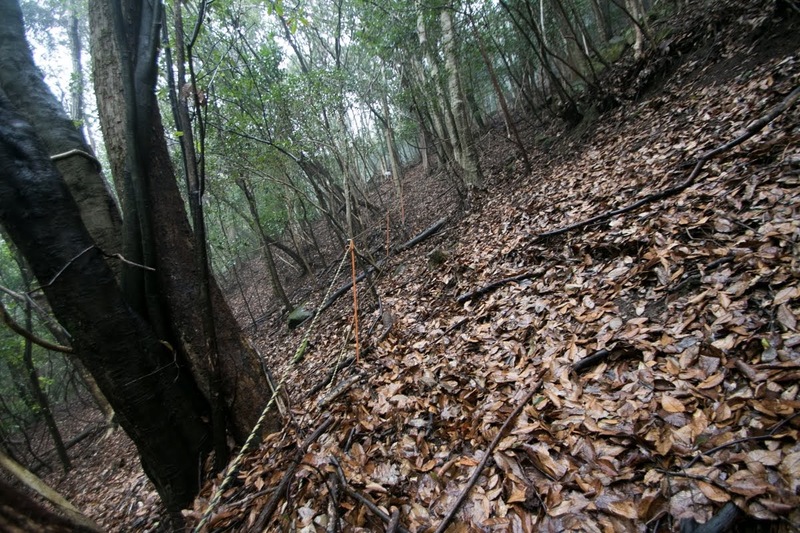 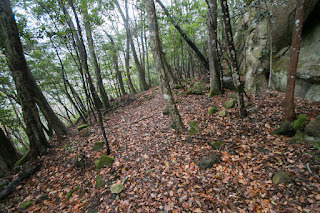 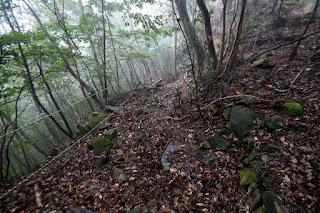 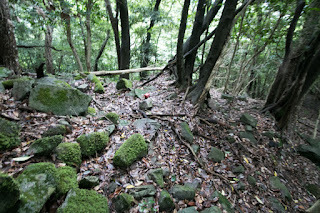 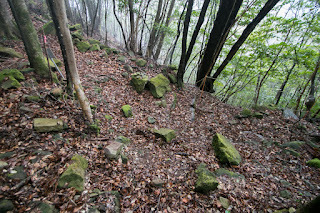 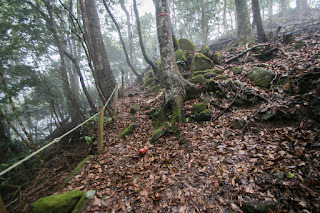 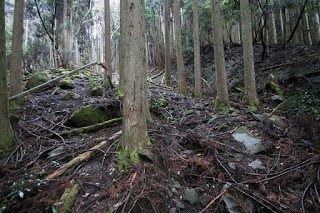 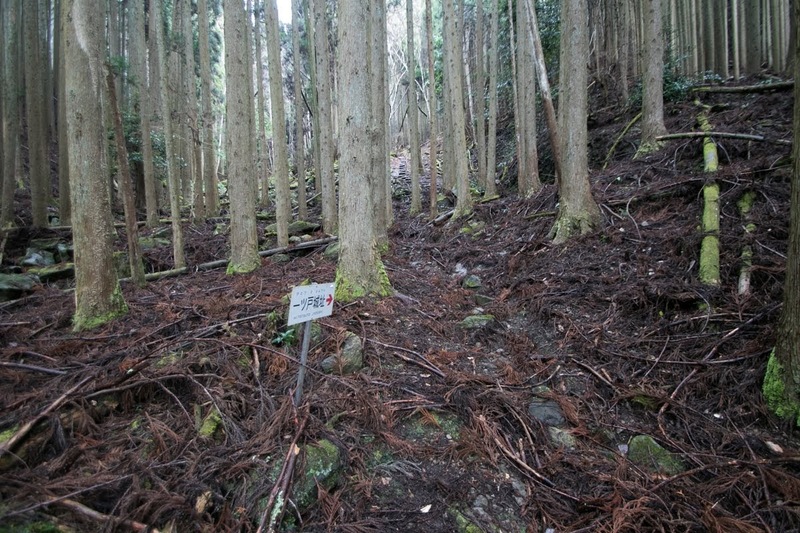 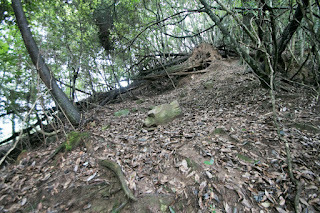 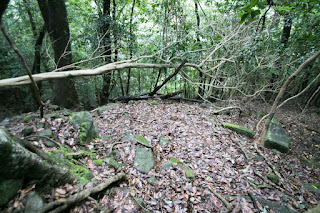 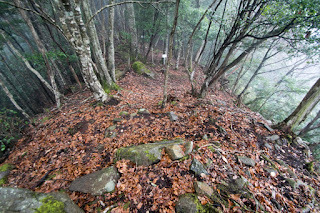 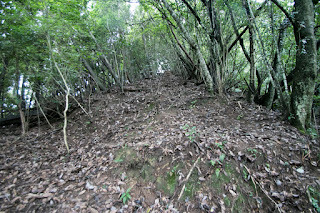 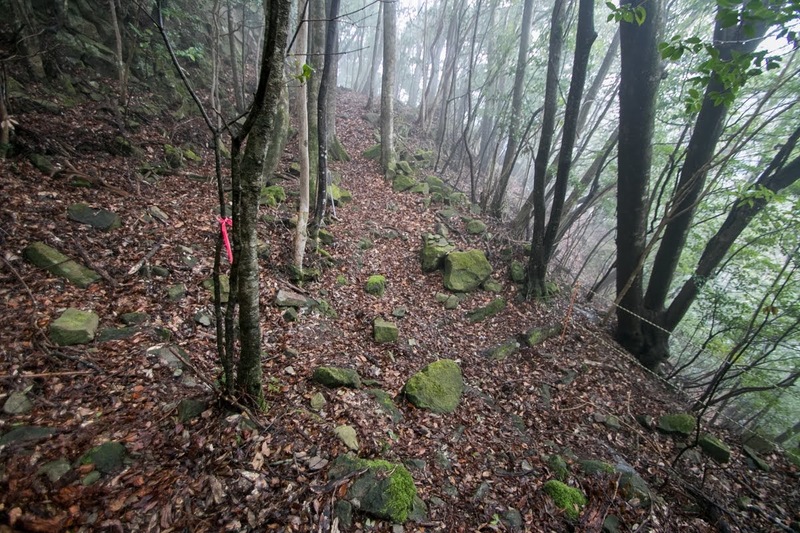 As long as the result of visiting, it might be impossible to climb hilltop area from northeast slope of the mountain. 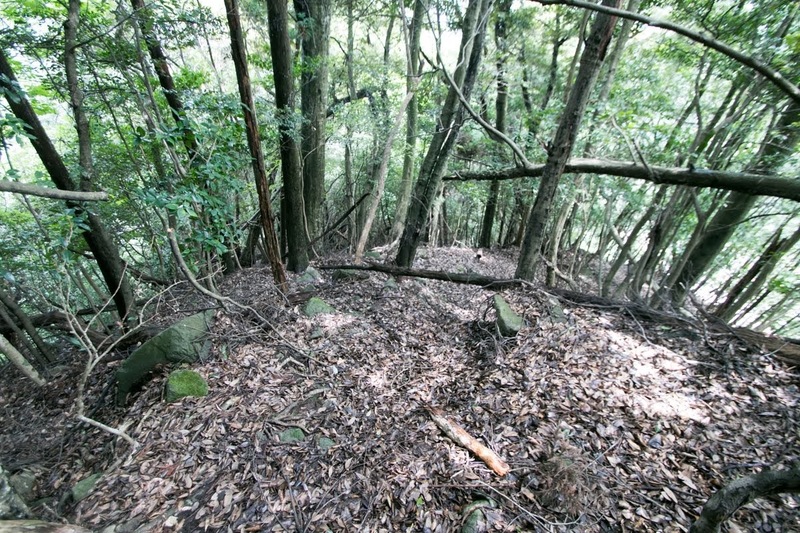 But because of the space, castle town and residence of the lord might exist at northeast hillside. 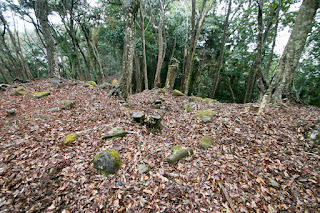 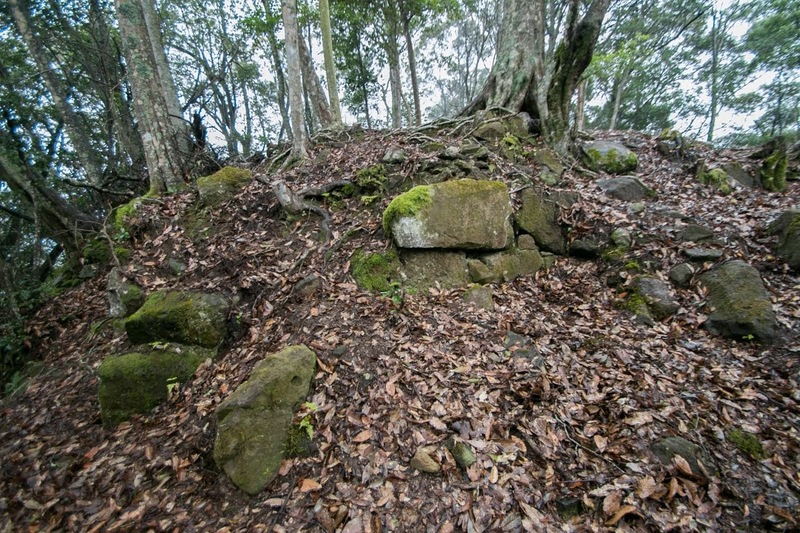 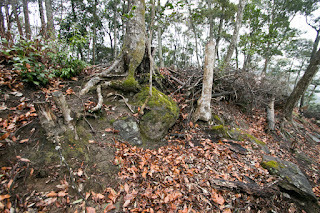 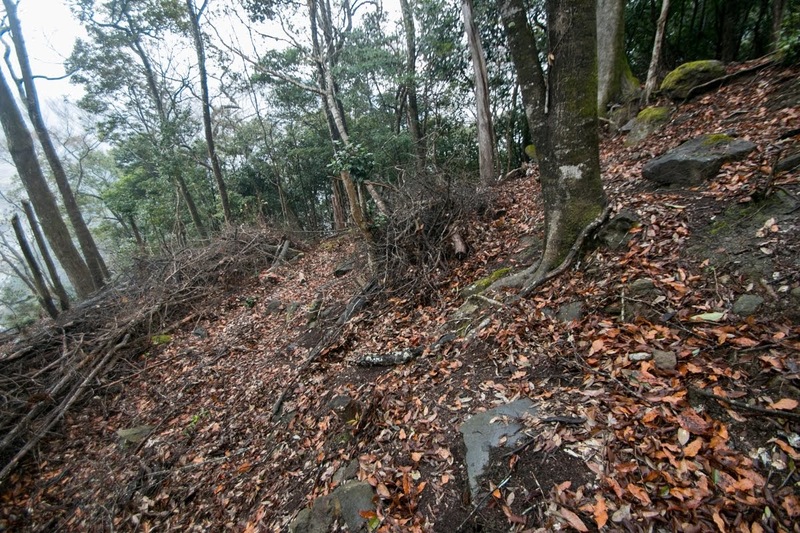 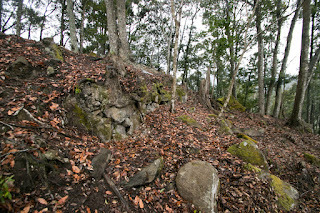 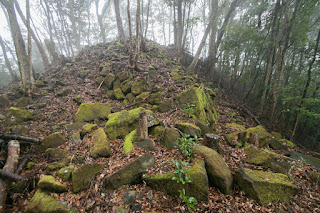 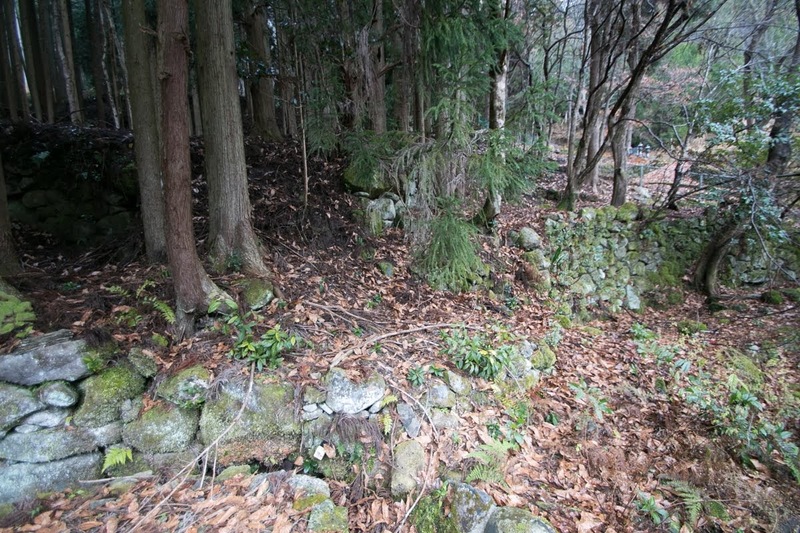 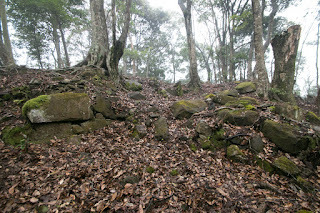 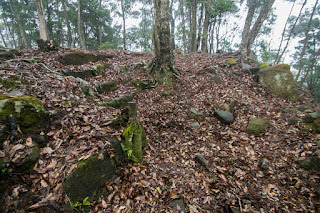 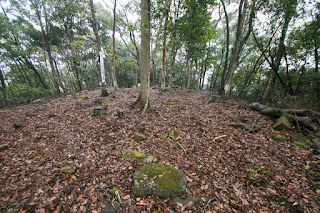 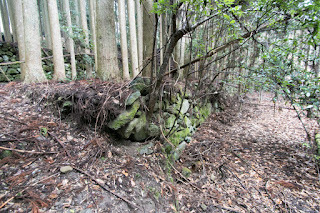 There is a ruin of hillside area with a line of stone wall built by large stones which now used as a ground of shrine, and a large terrace might be a ground of the residence of the lord. 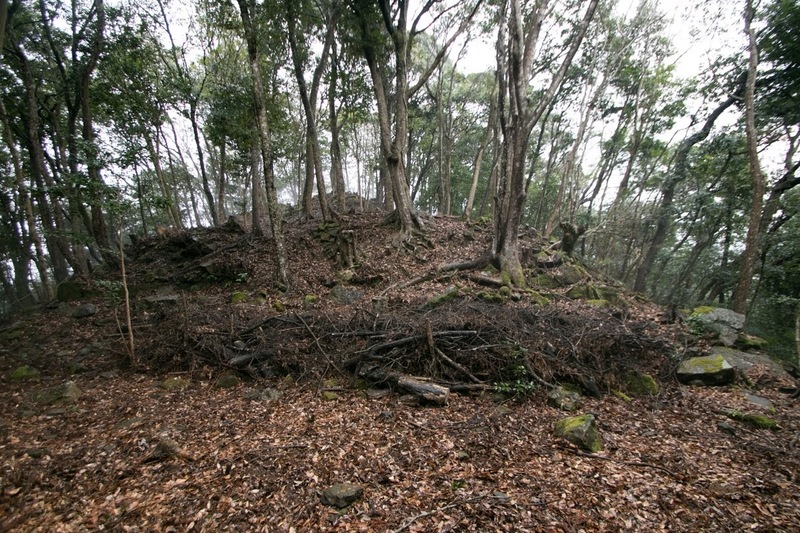 Total size of hilltop area is about 300 meter long, and the size and construction of the castle exceeds ordinary branch castle and rather close to Kokura castle and Nakatsu castle, two main bases of Hosokawa clan. 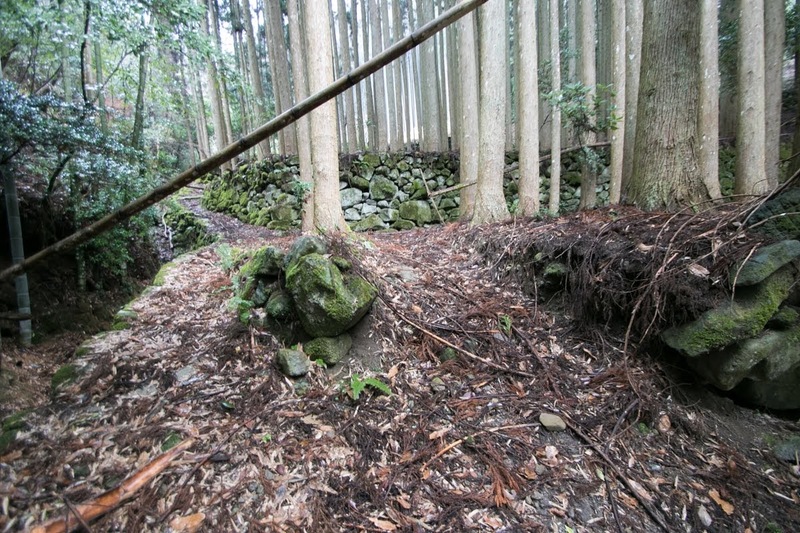 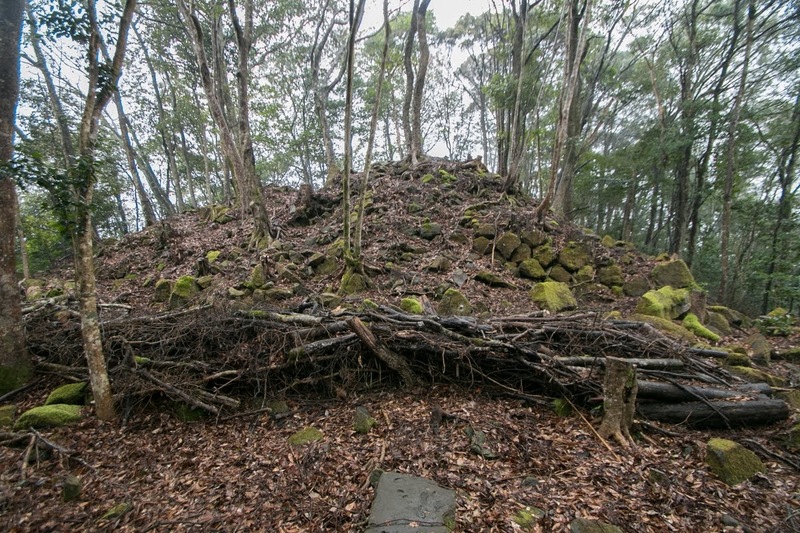 Combination of not so strong main bases and well constructed branch castles at Hosokawa clan is contrary to its rival Kuroda clan. 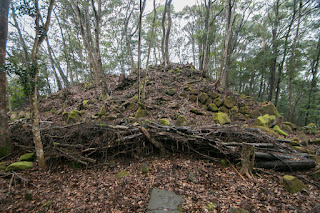 However, as a resulf of Ikkoku Ichino-Rei (one domain one castle rule) published in 1615, Hitotsuto castle was abolished at that time. 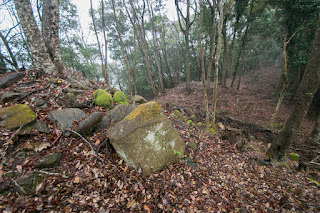 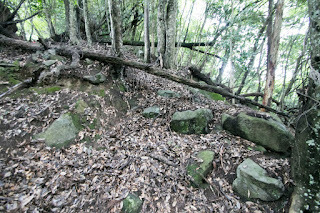 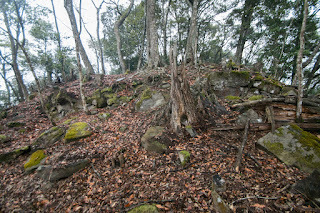 Now no building remain and it is even difficult to grasp climbing road, but broken stone wall still exist here and there of the mountain. 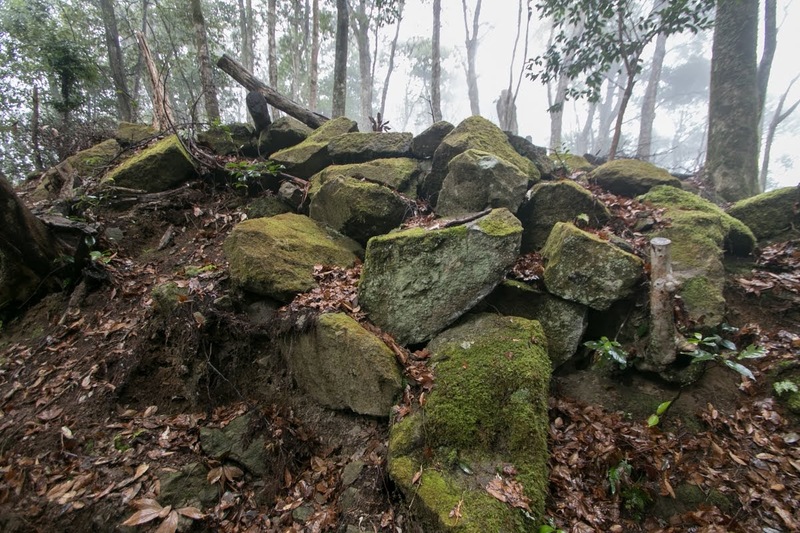 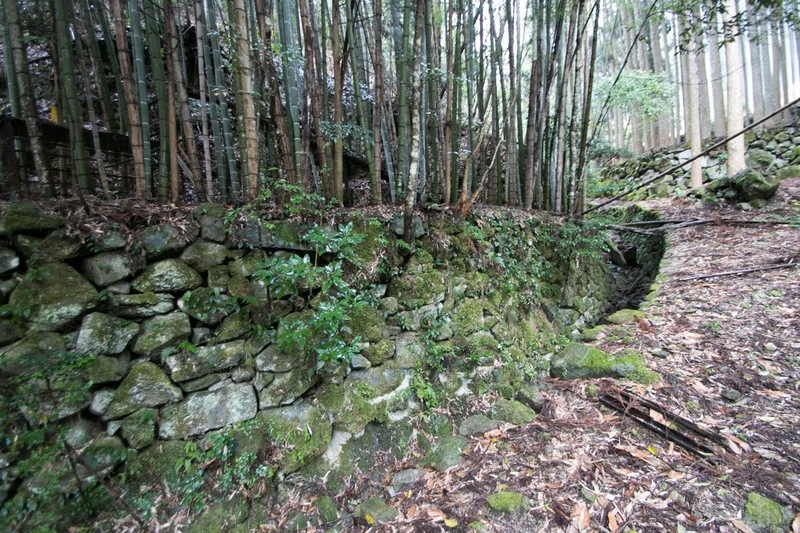 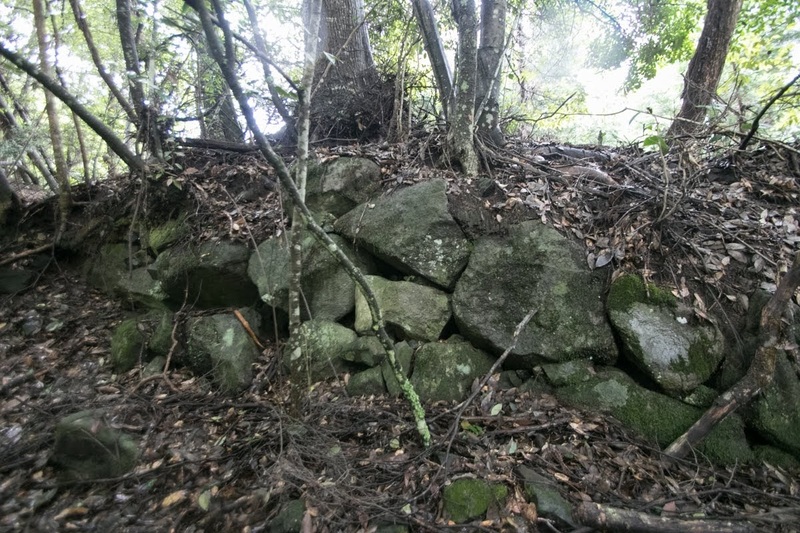 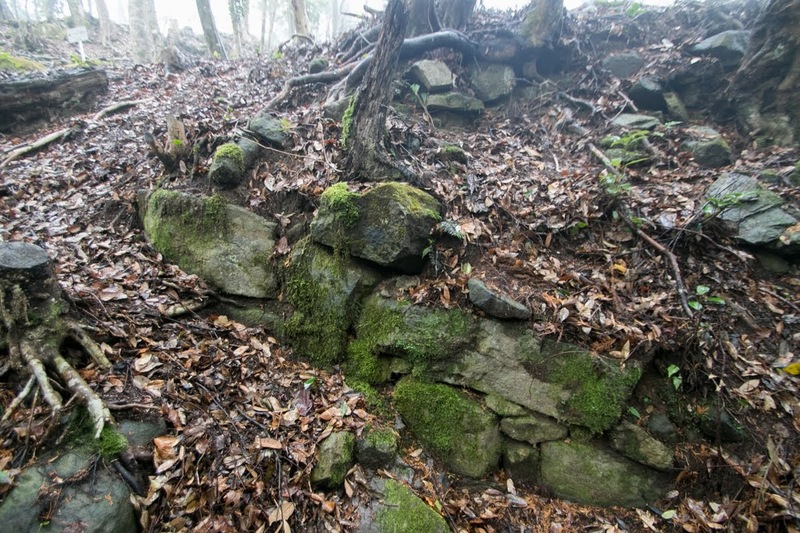 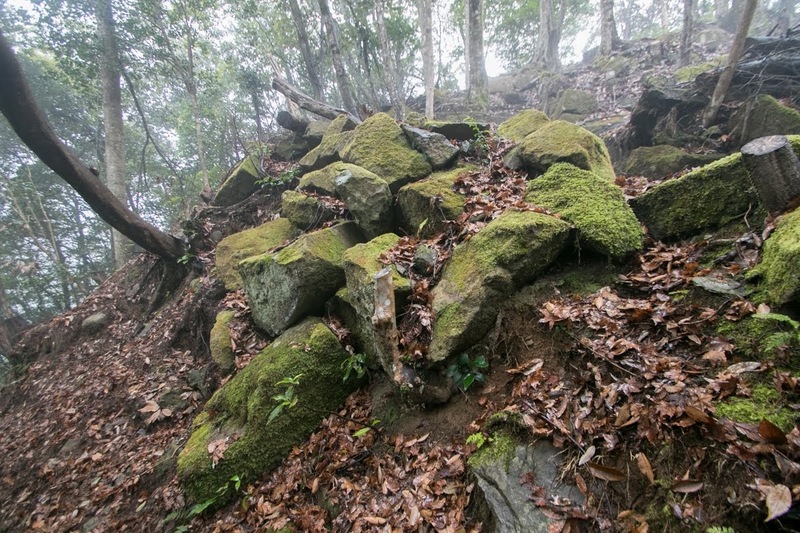 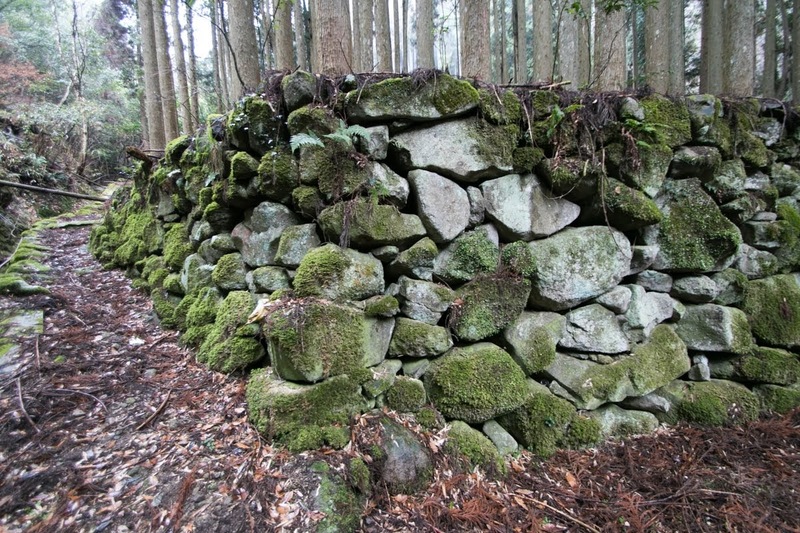 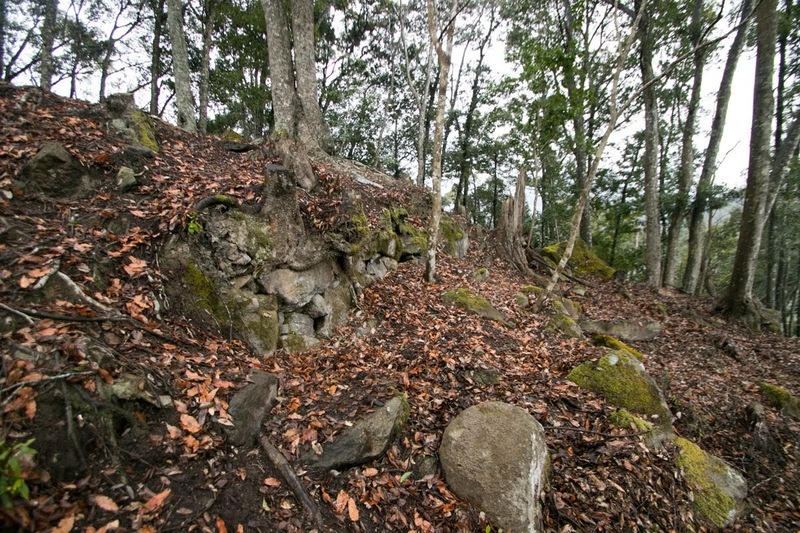 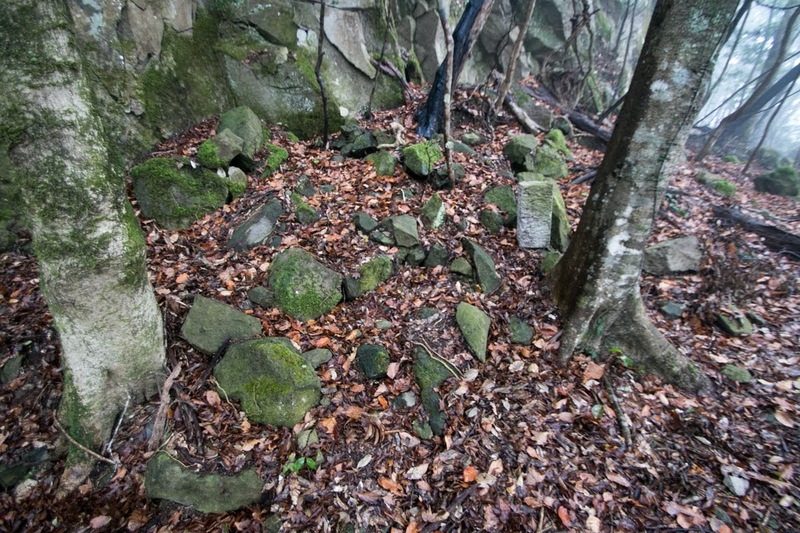 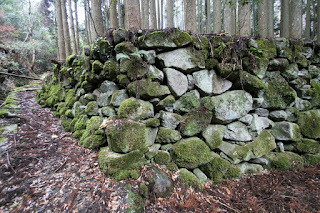 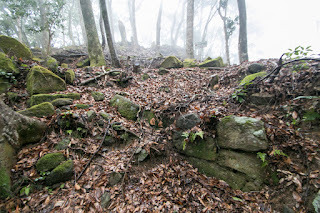 It is also difficult to distinguish artificial original stone walls, newer ones for cultivation and natural rocks, but there surely exist remnants of well built stone walls under good planning. 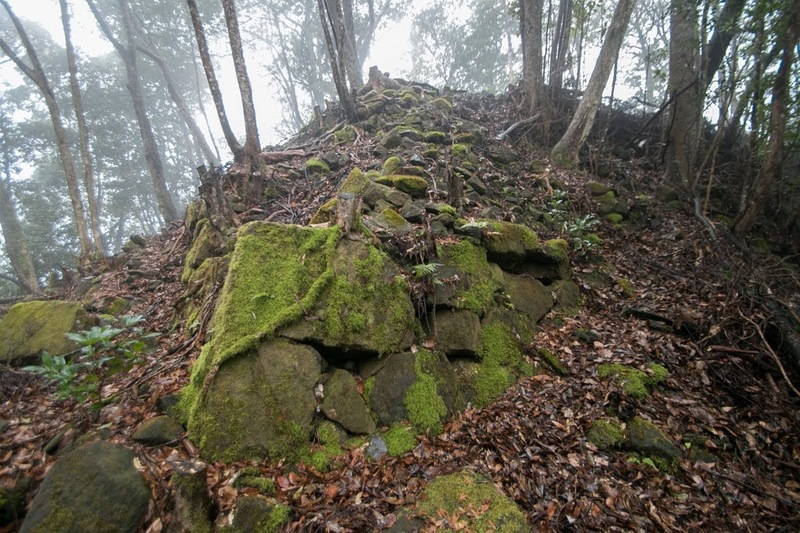 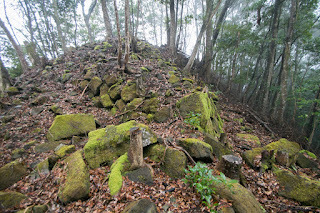 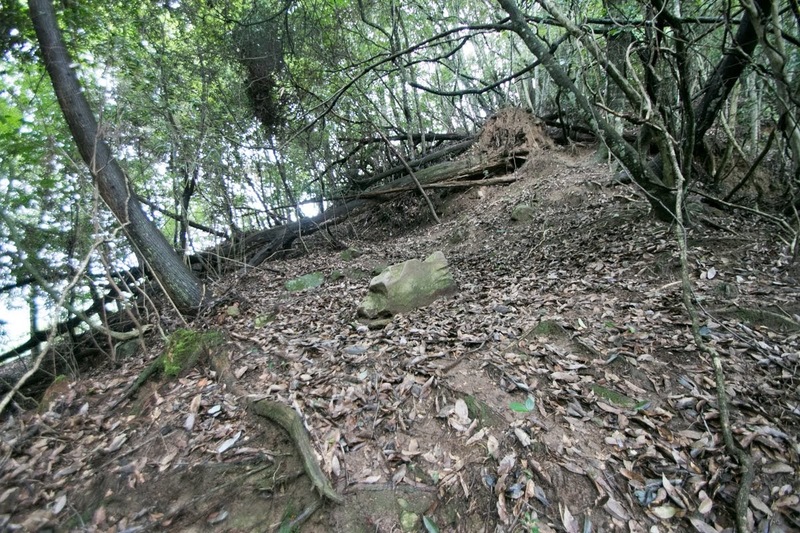 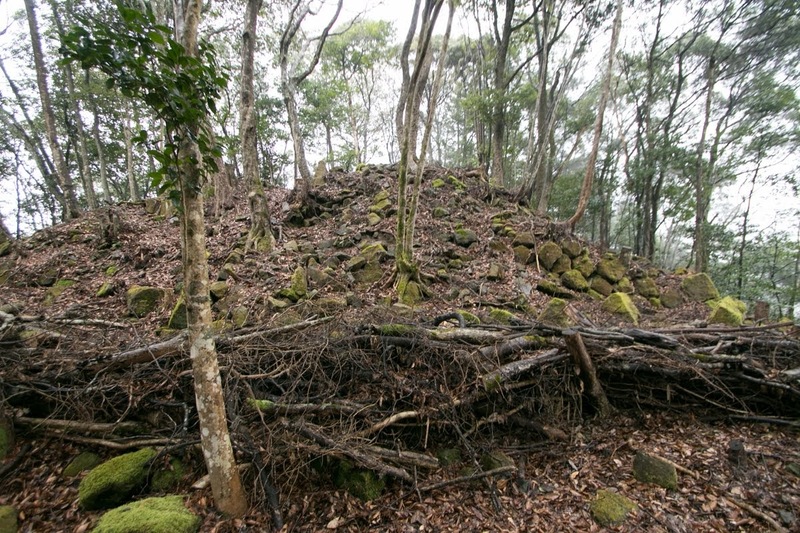 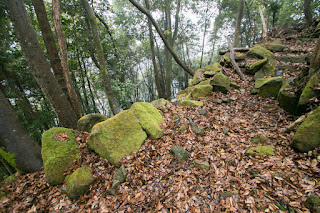 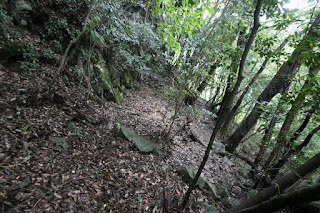 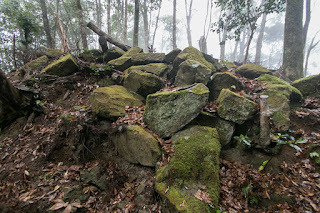 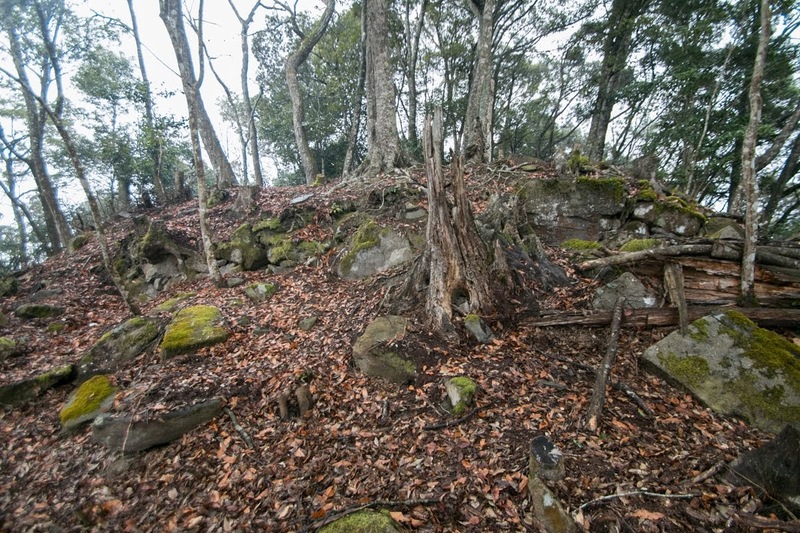 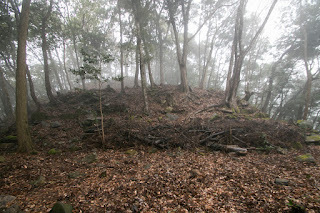 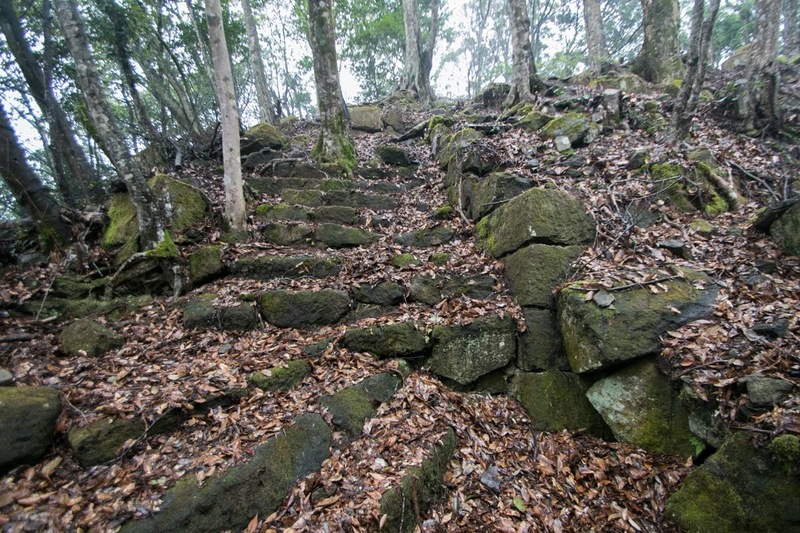 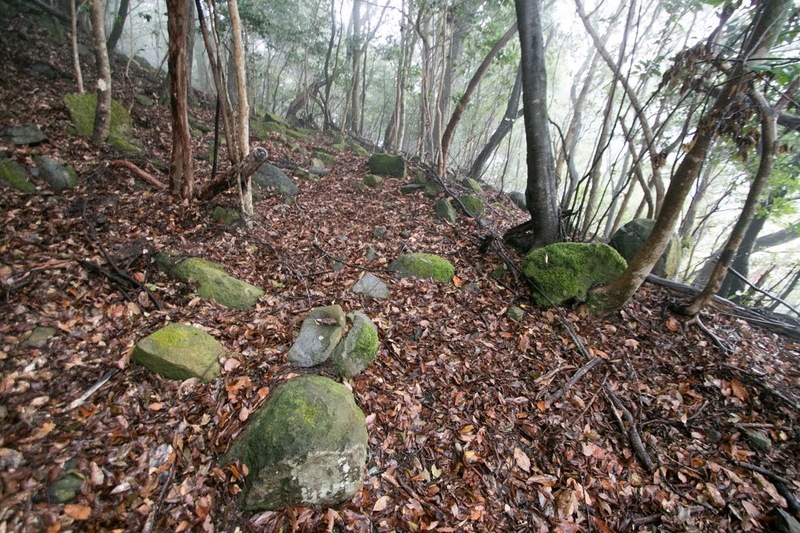 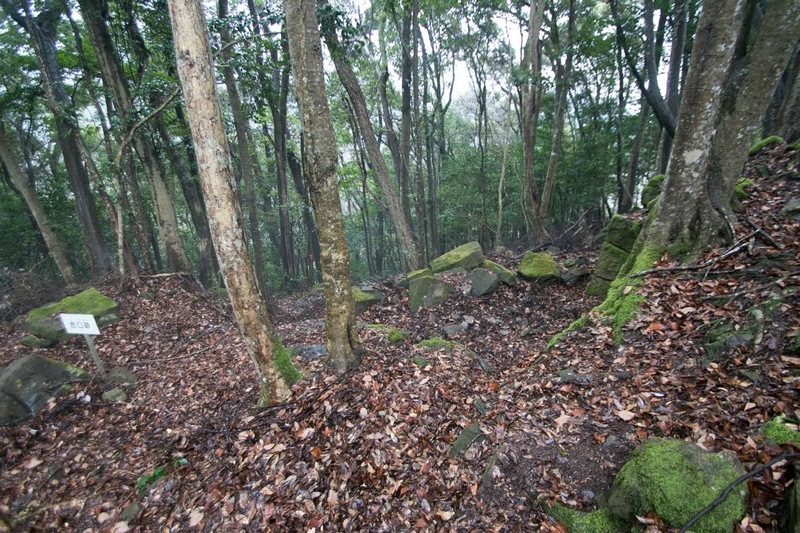 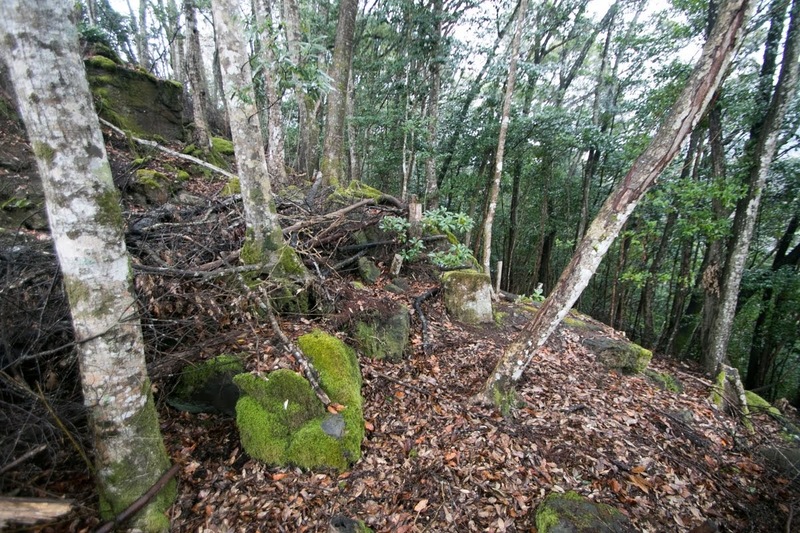 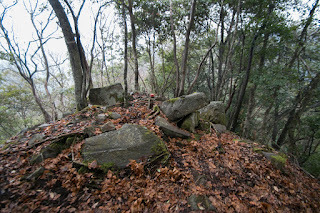 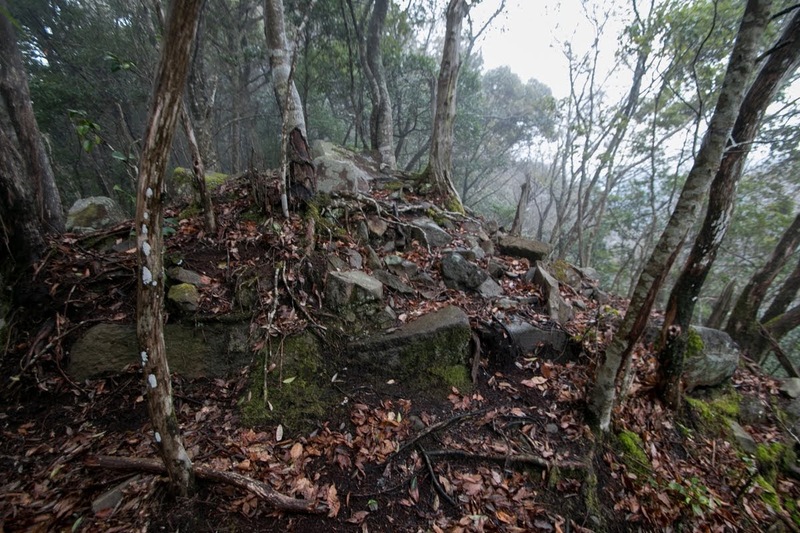 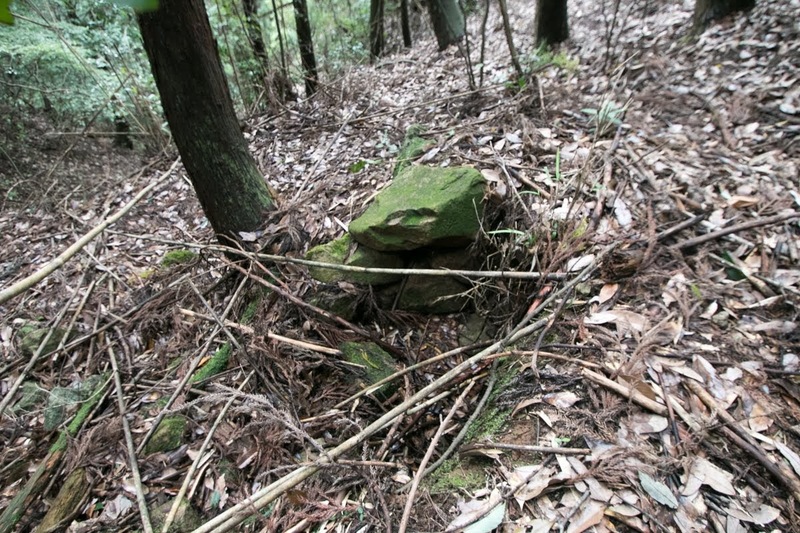 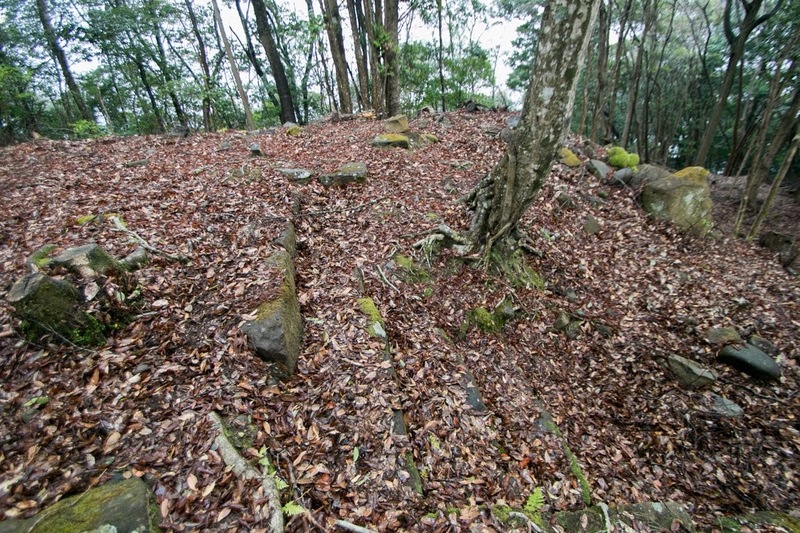 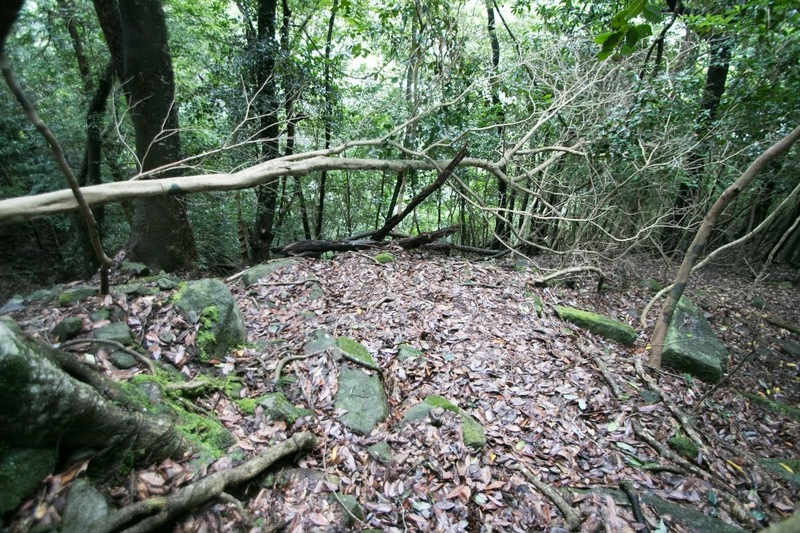 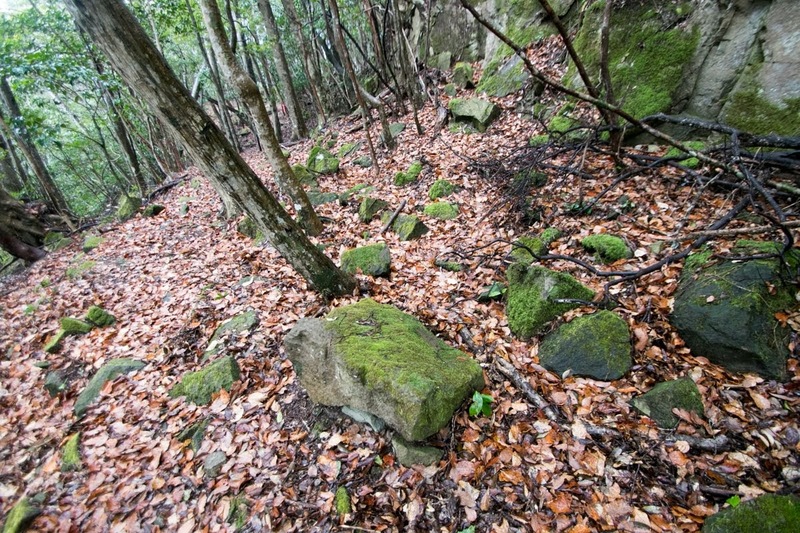 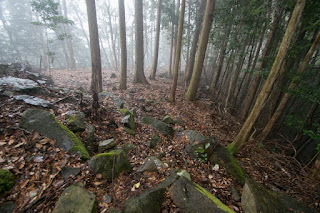 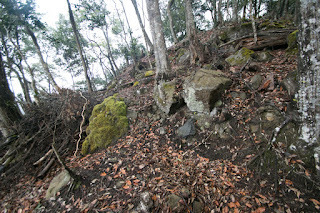 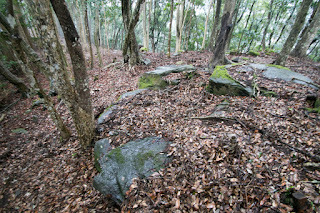 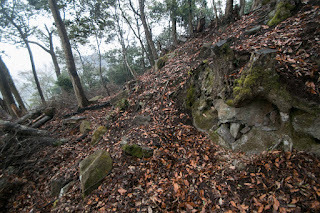 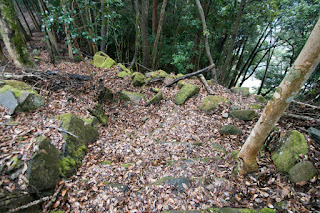 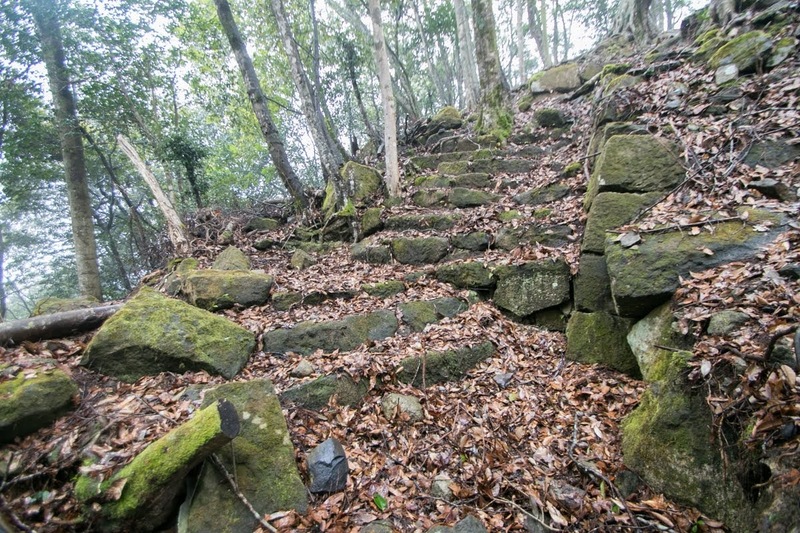 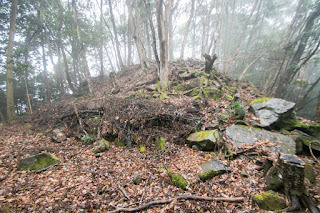 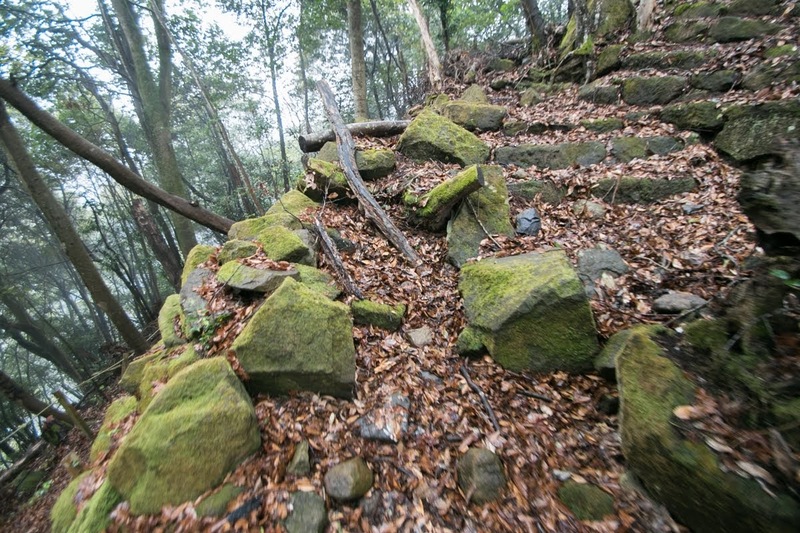 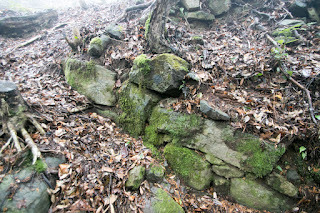 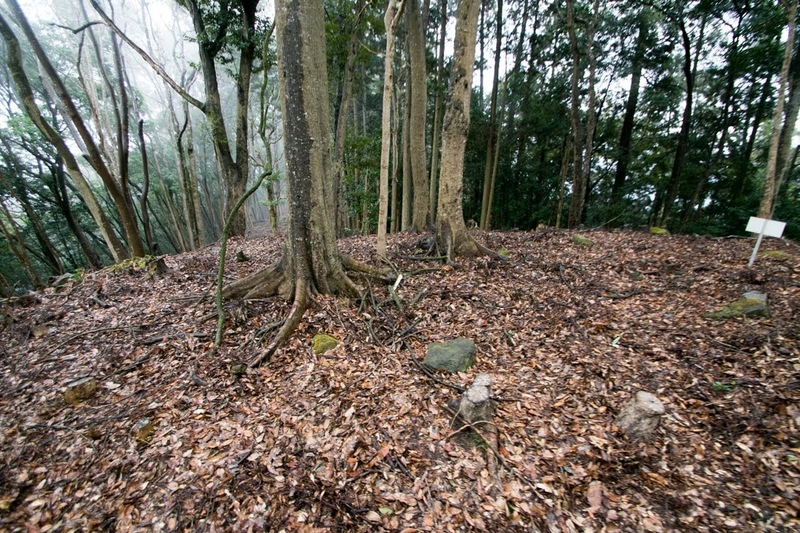 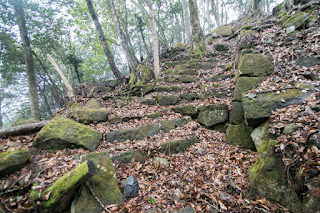 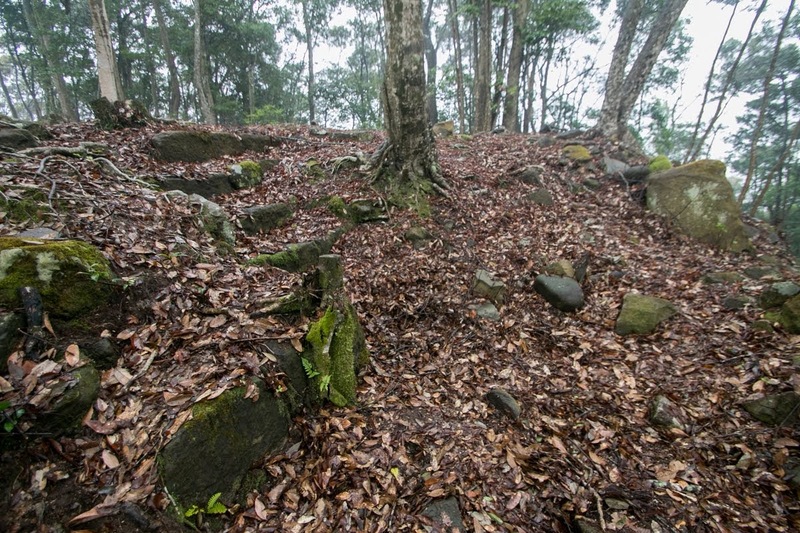 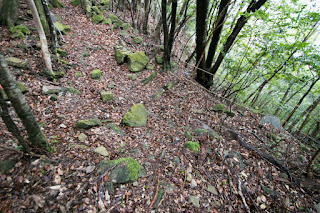 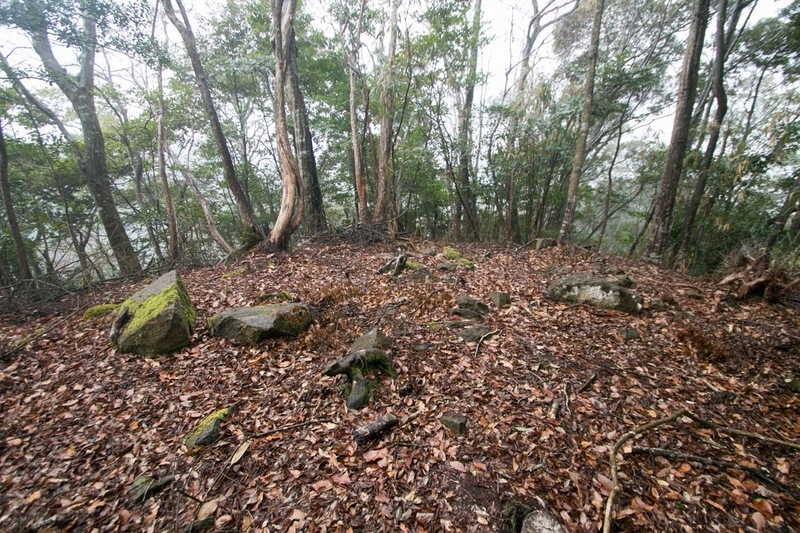 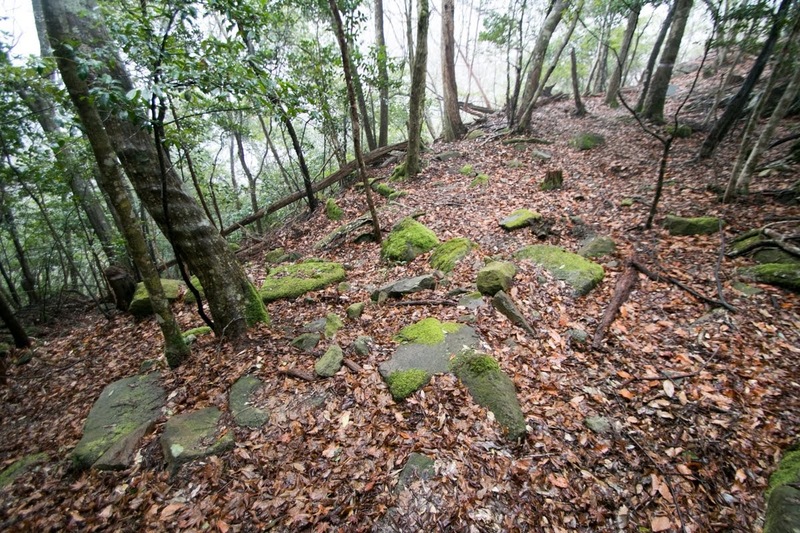 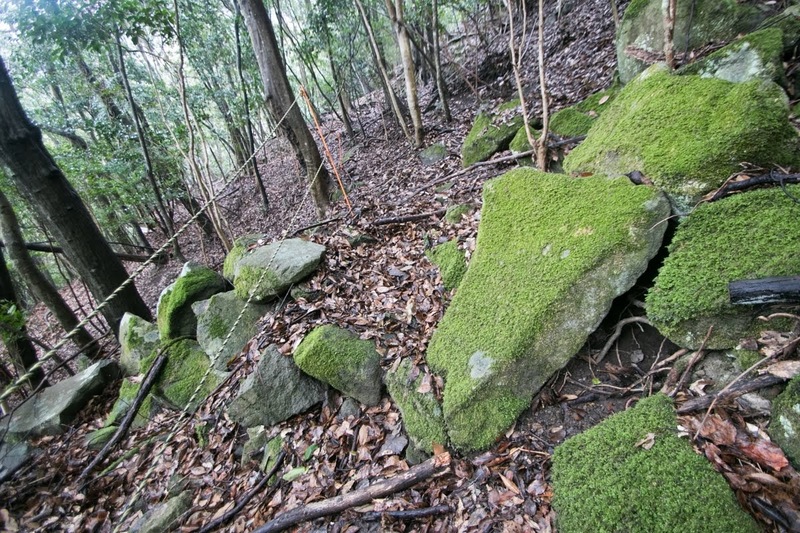 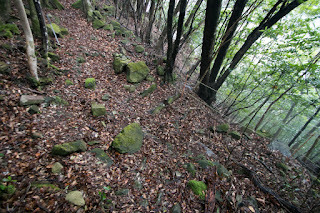 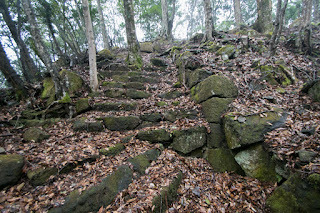 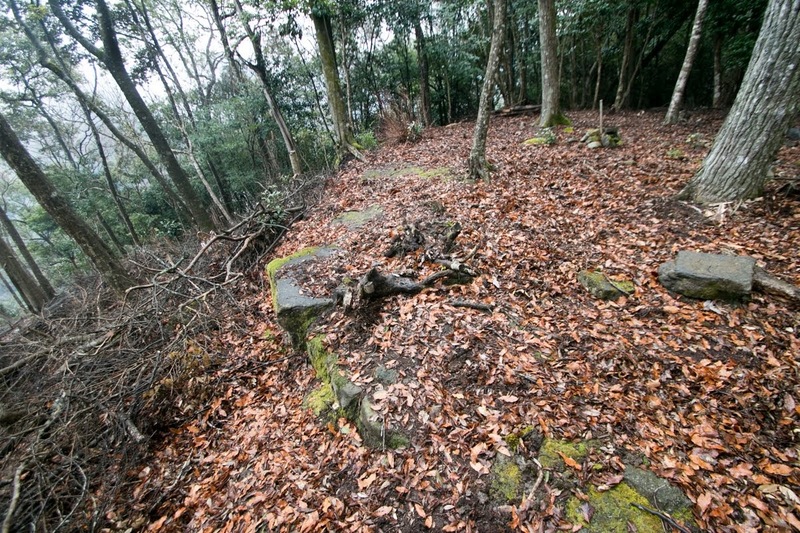 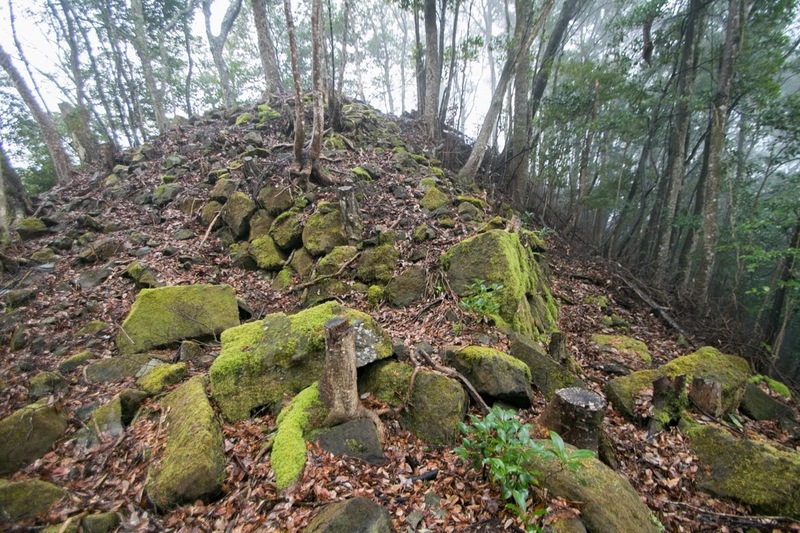 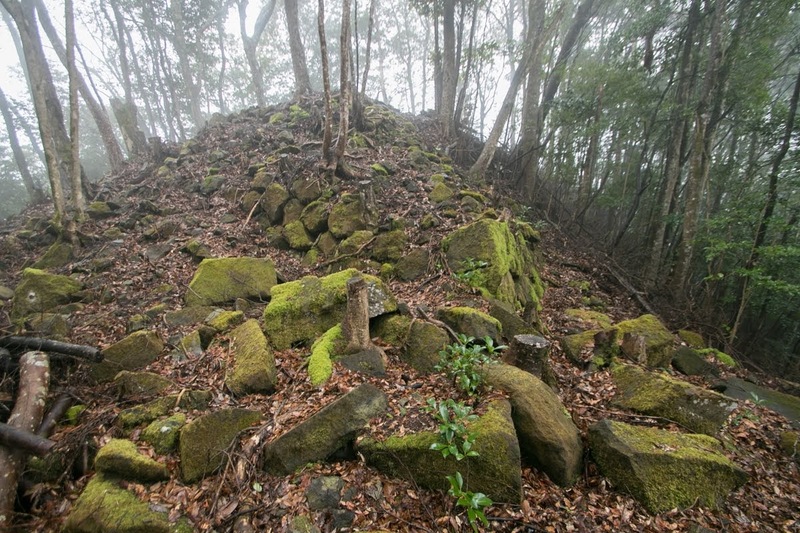 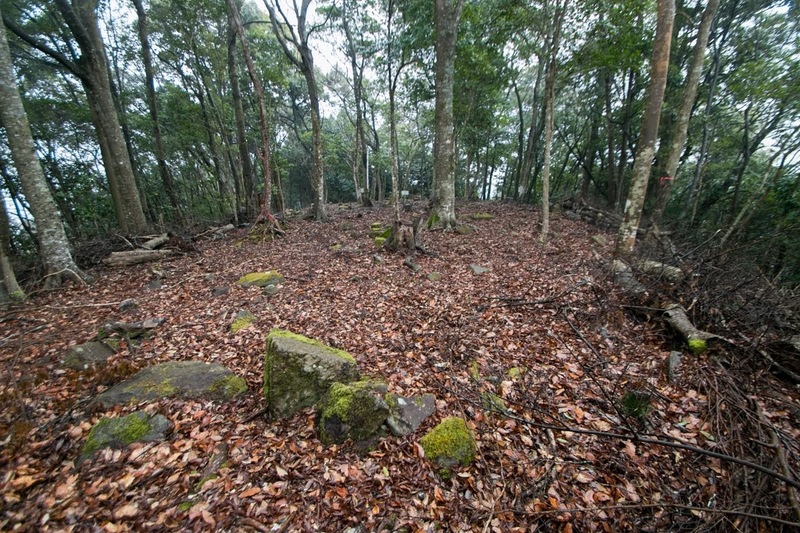 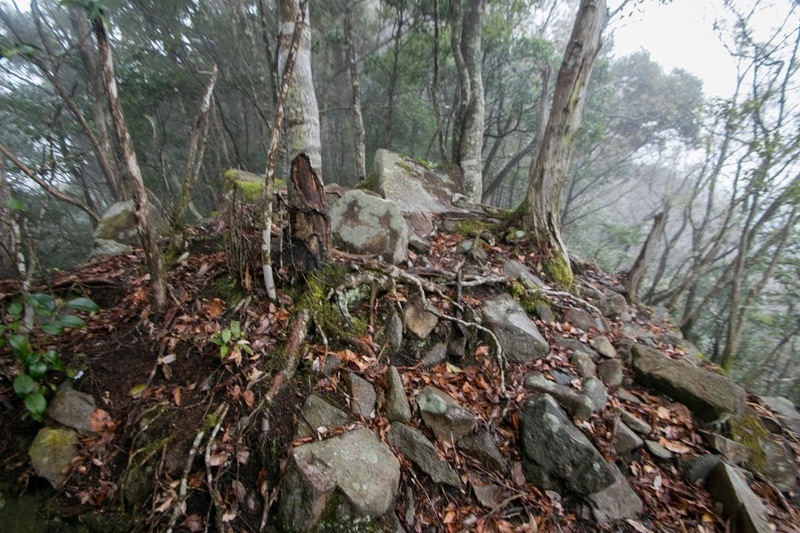 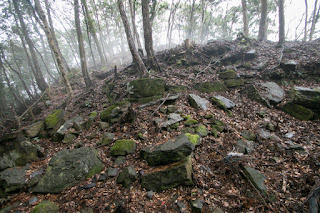 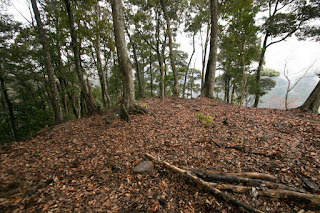 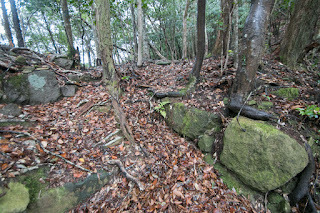 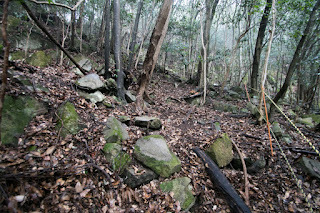 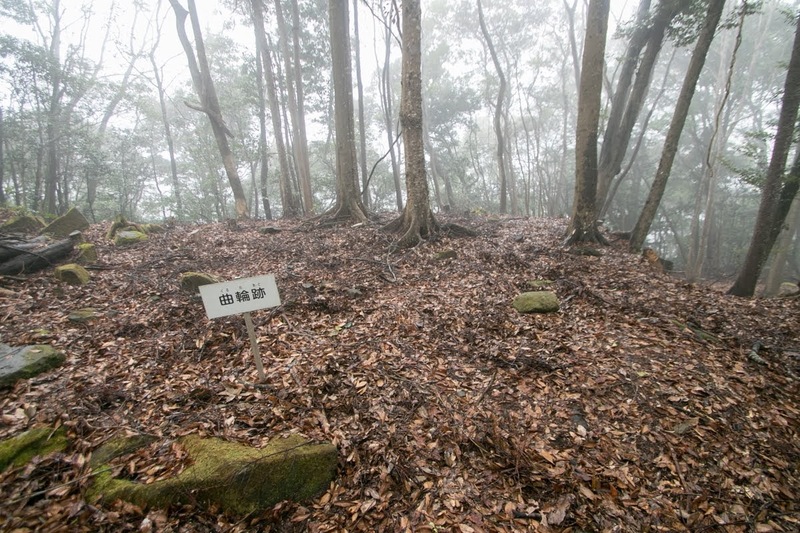 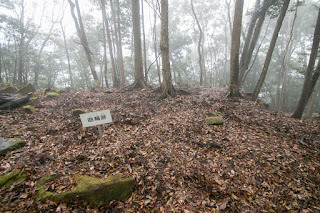 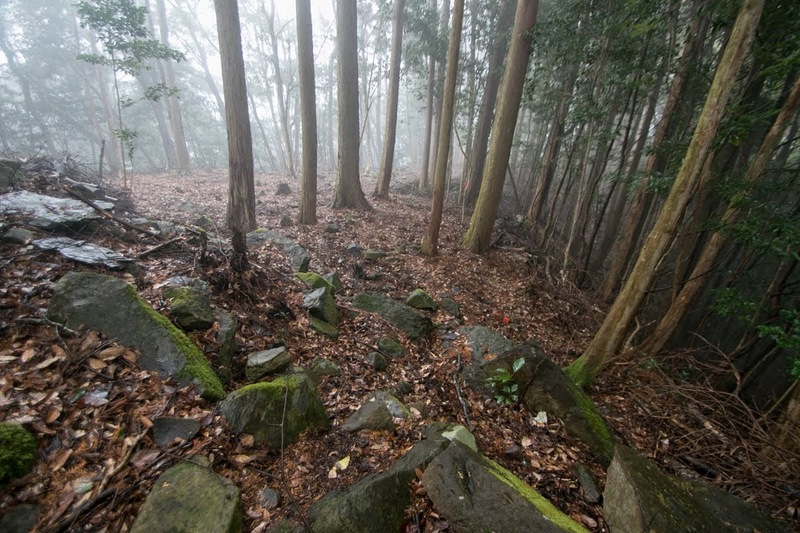 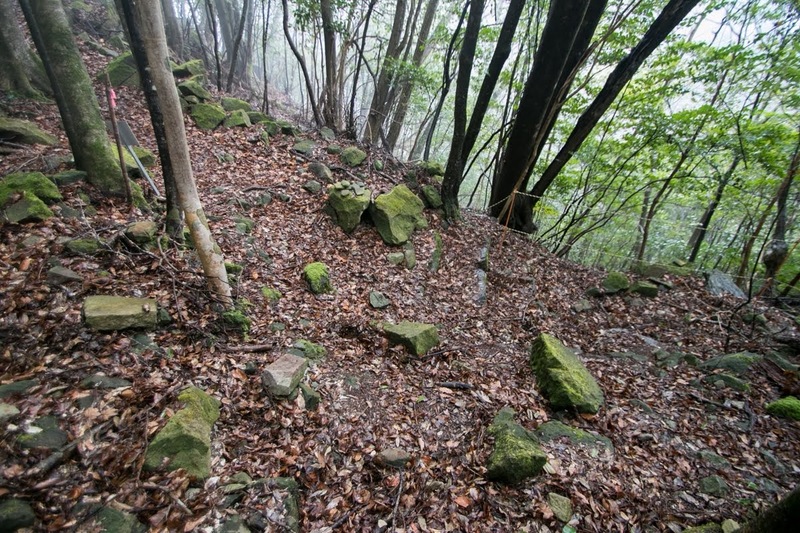 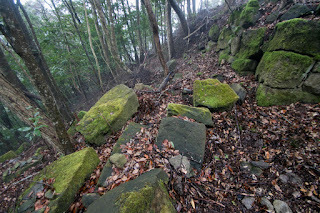 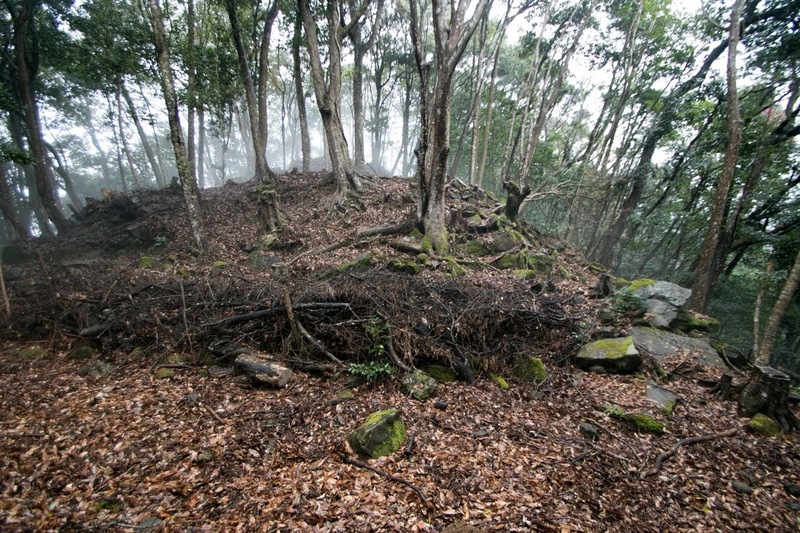 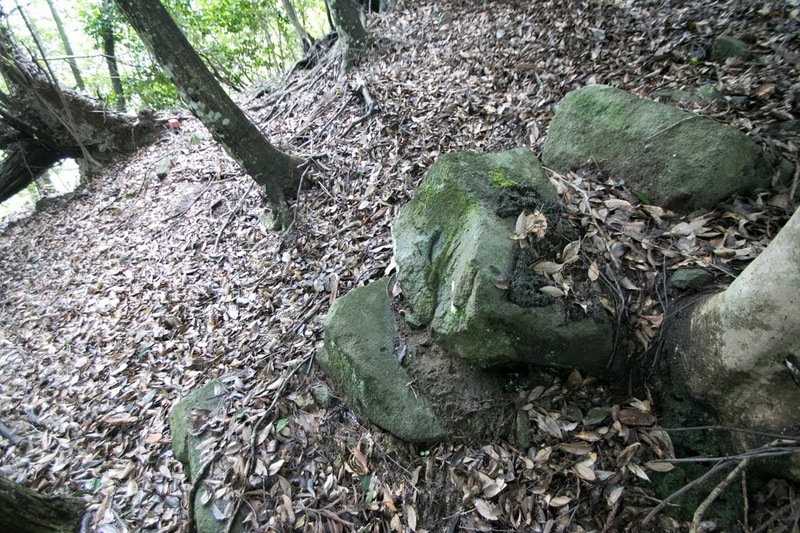 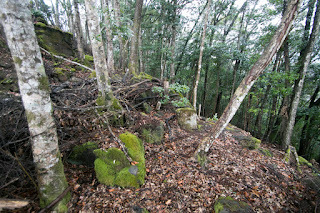 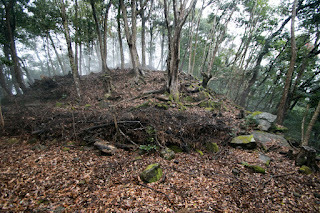 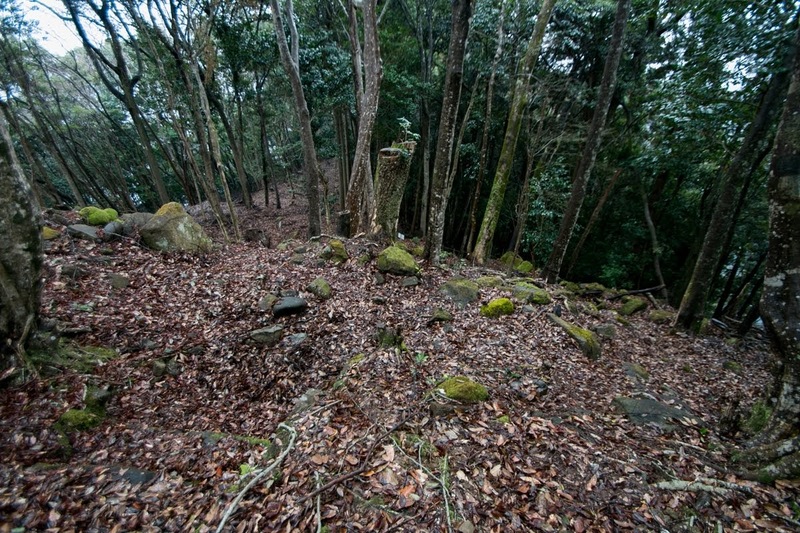 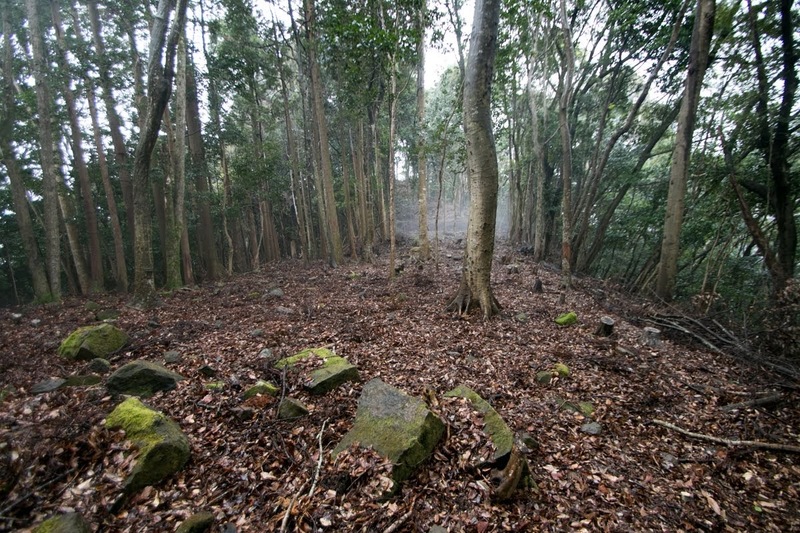 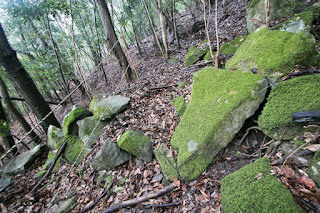 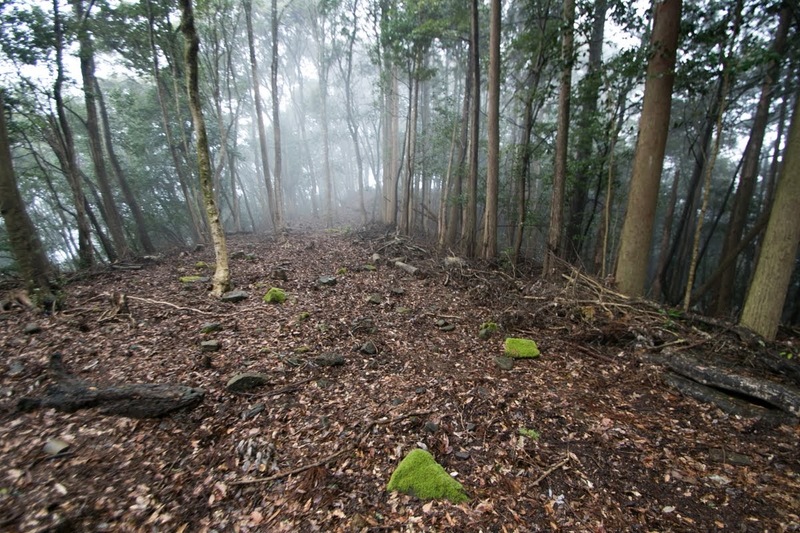 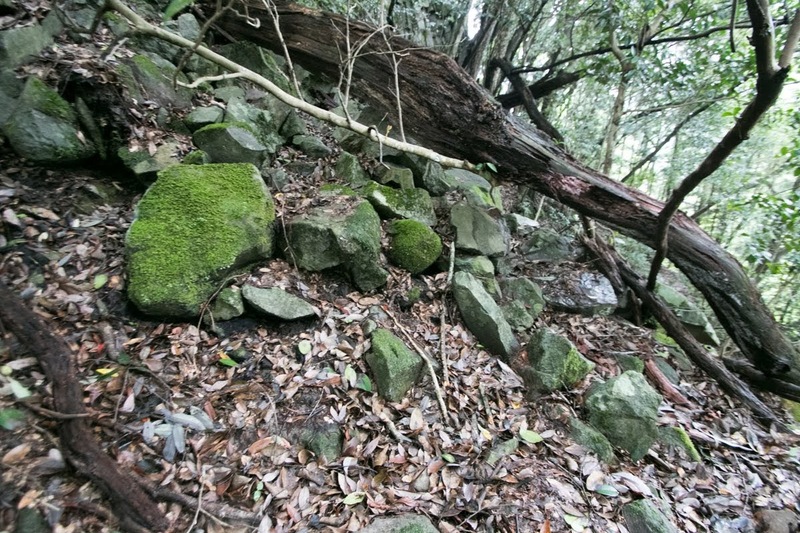 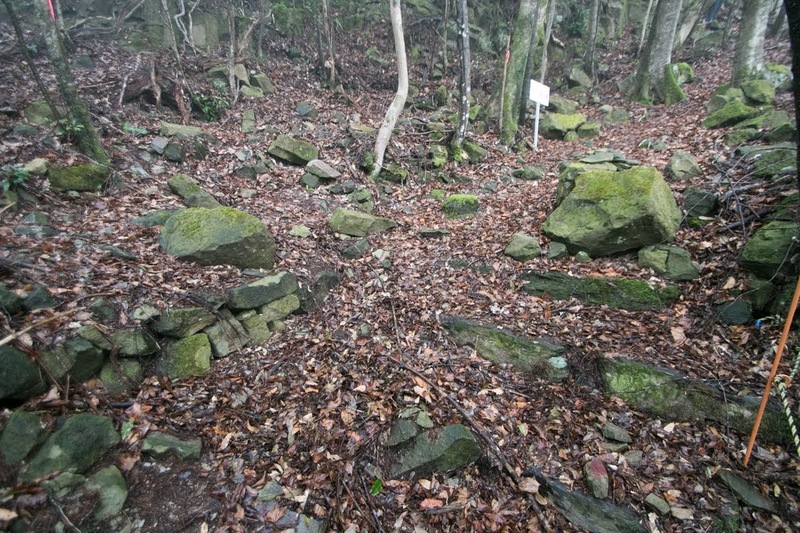 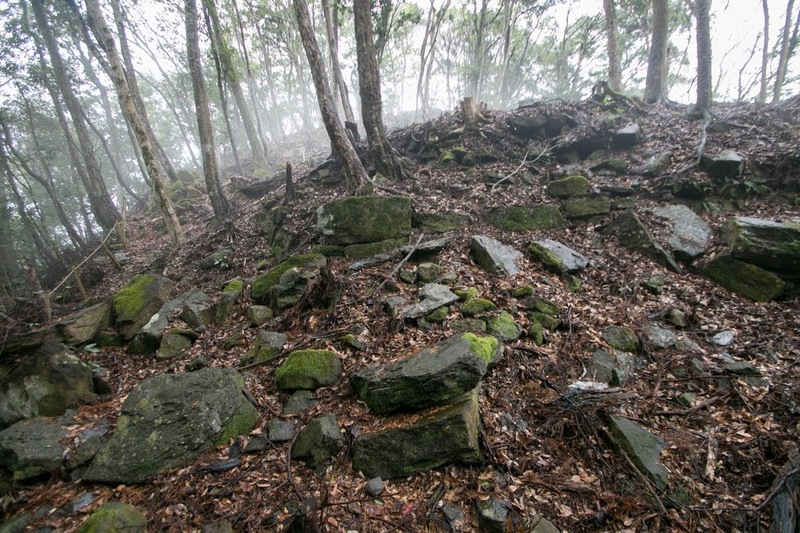 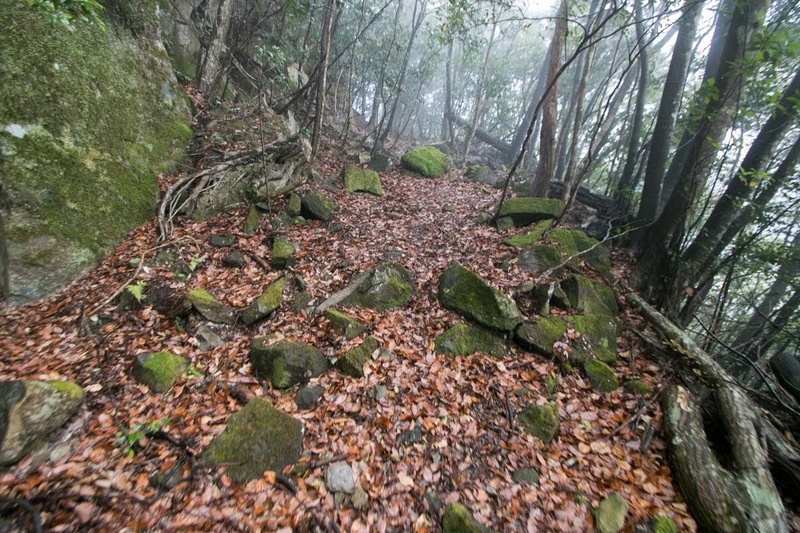 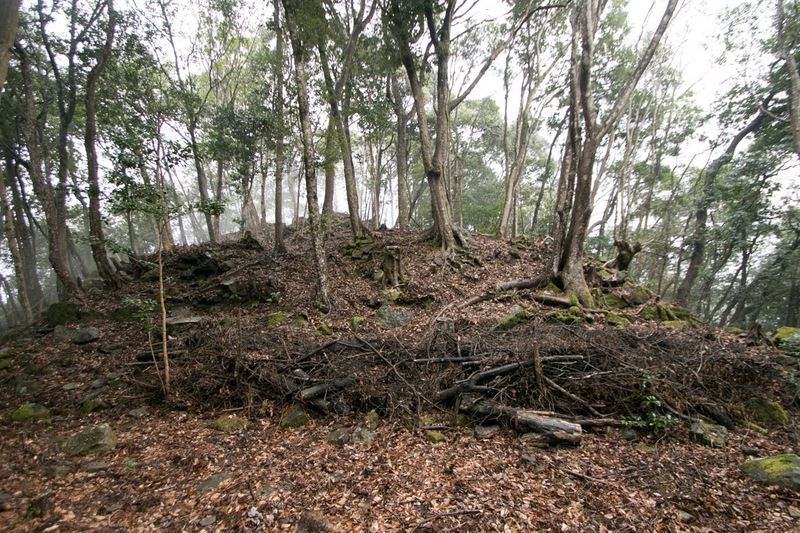 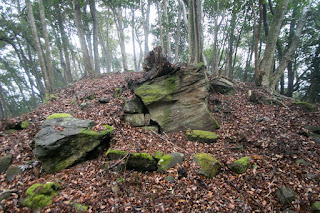 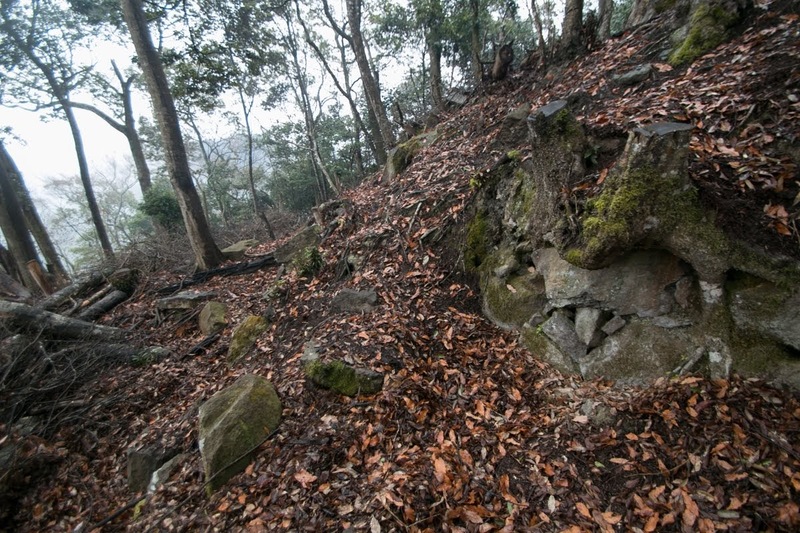 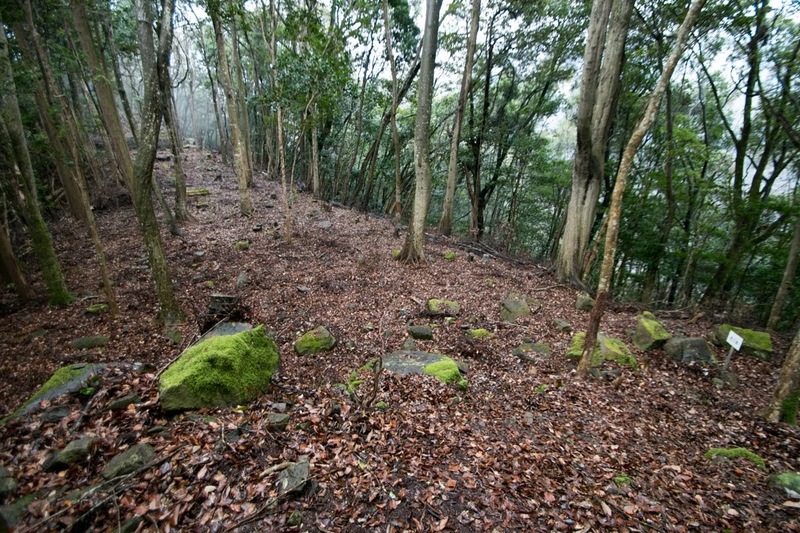 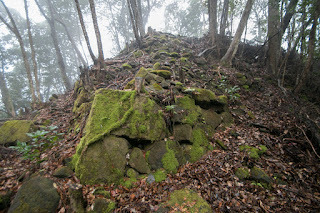 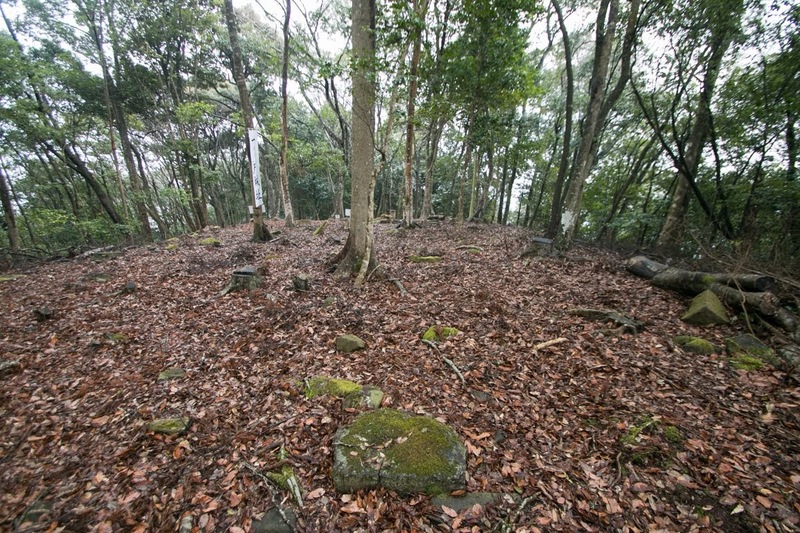 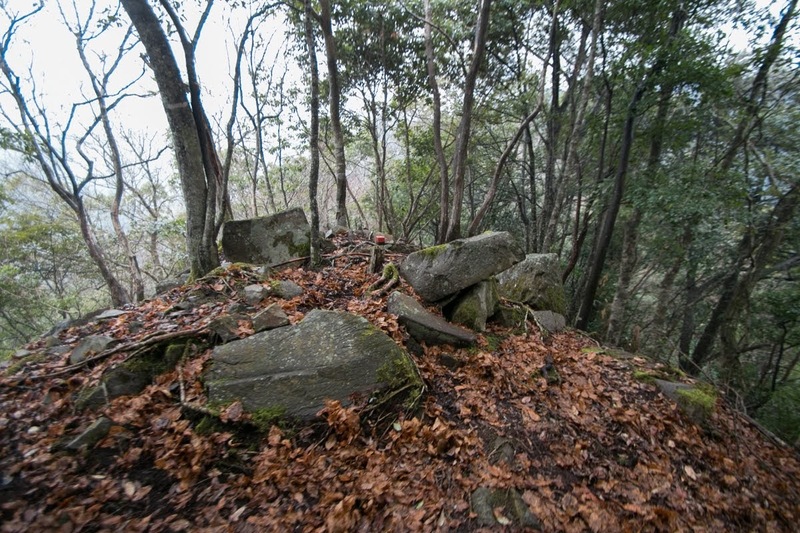 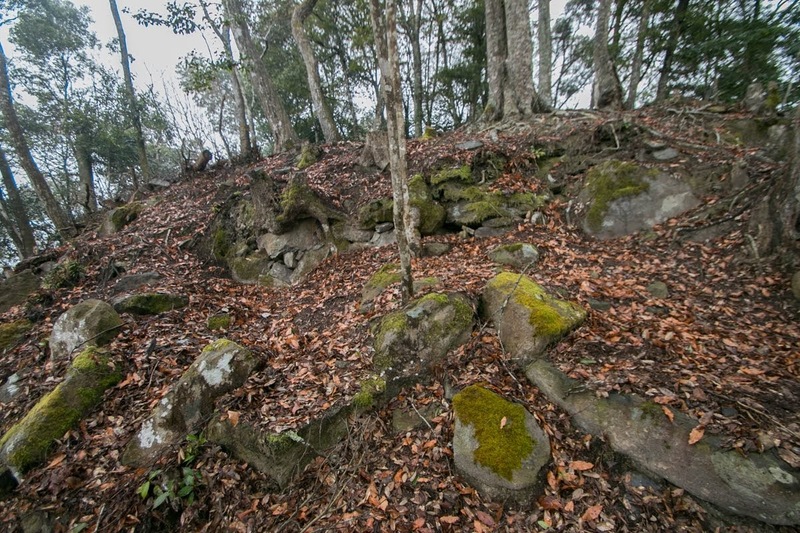 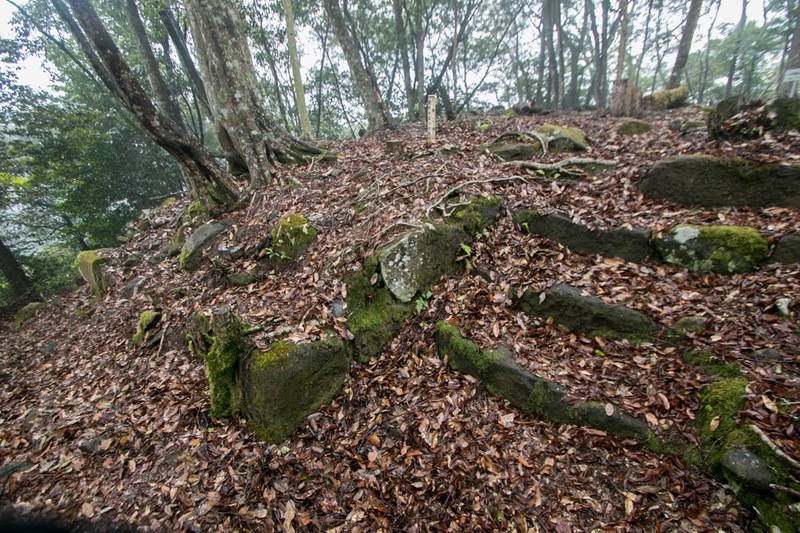 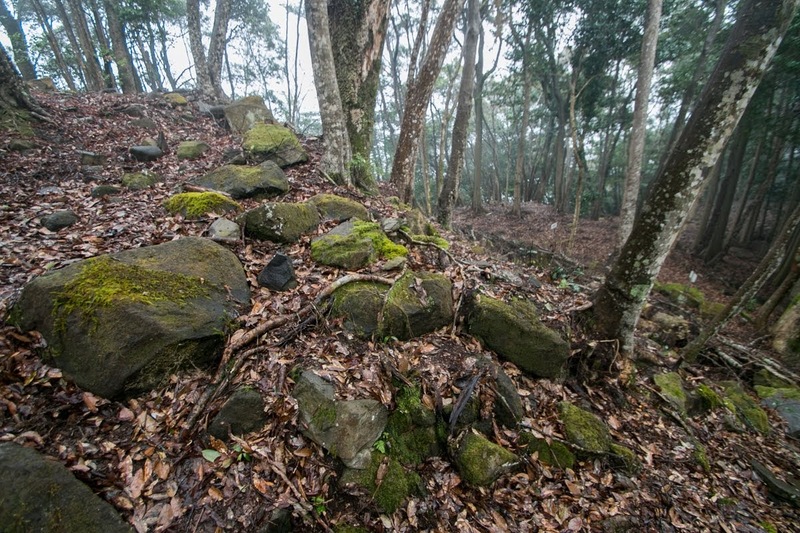 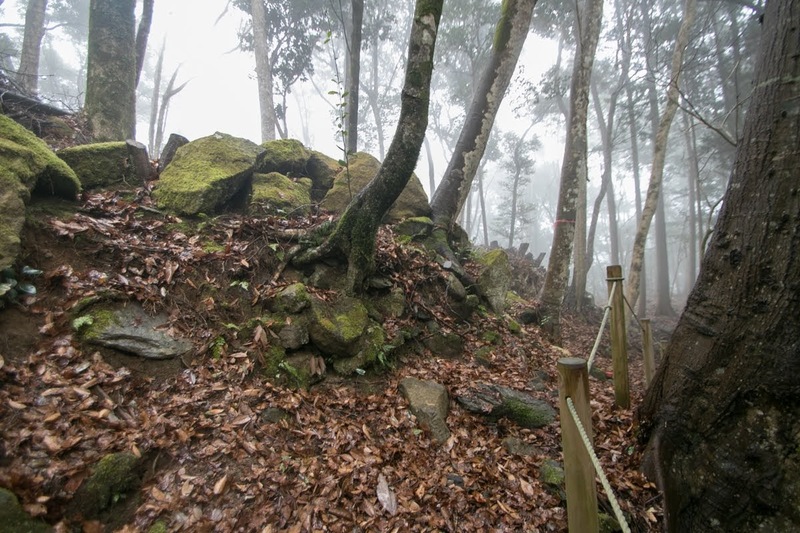 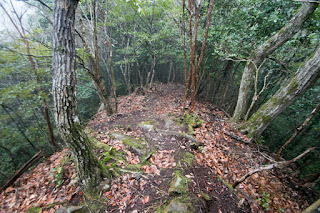 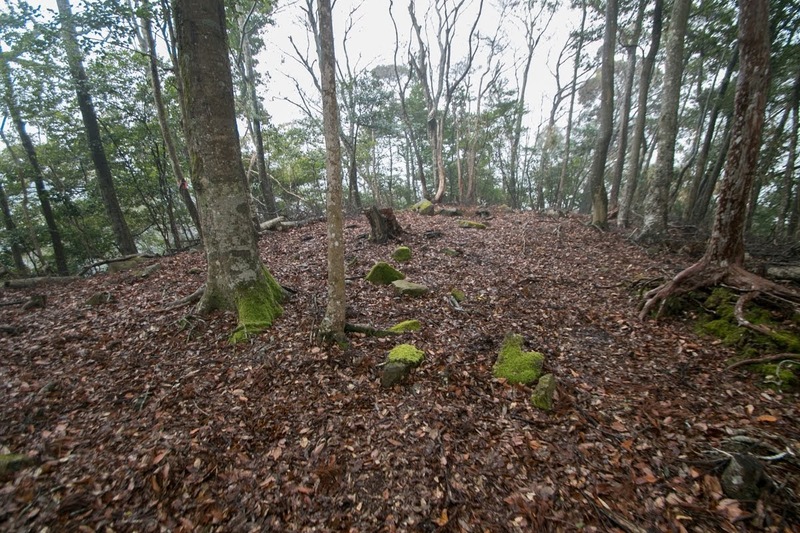 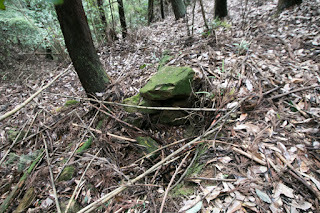 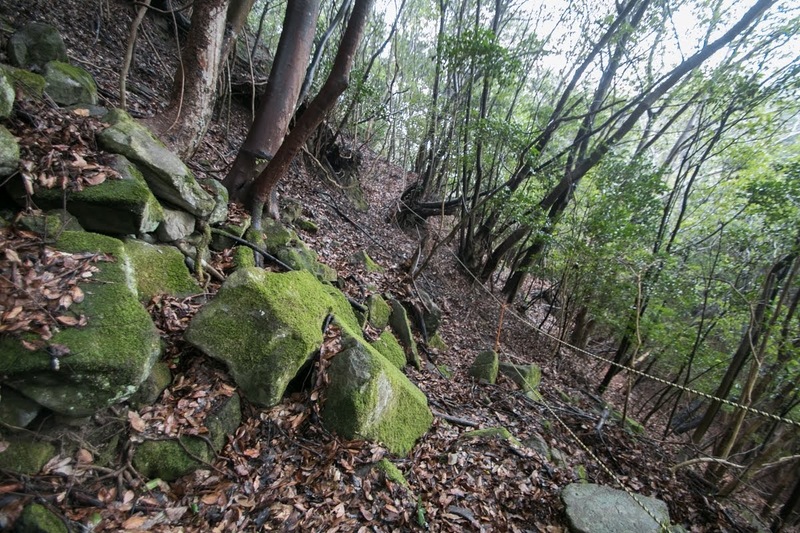 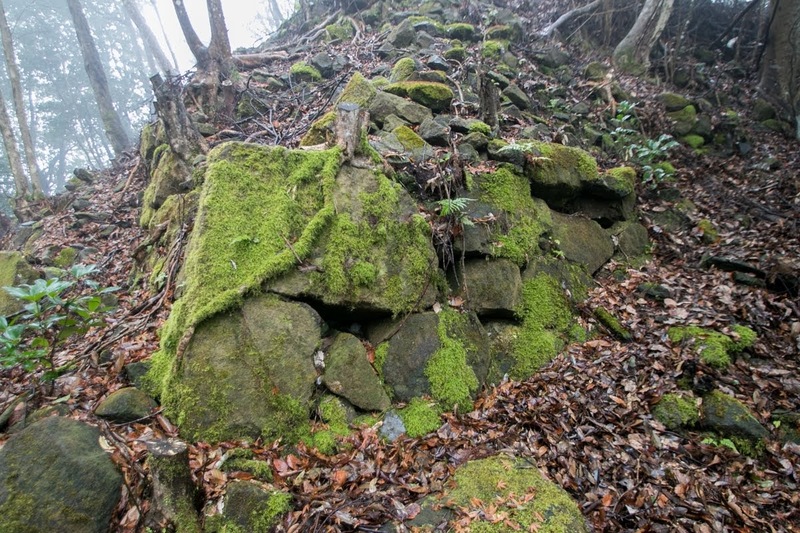 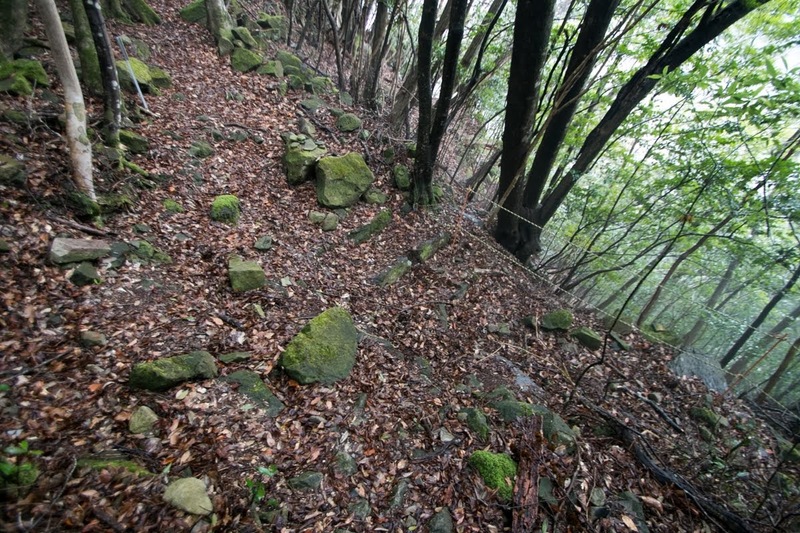 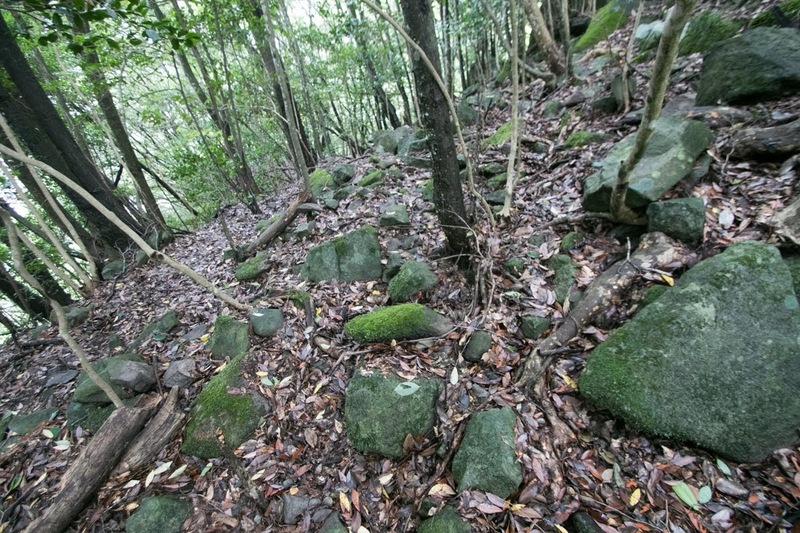 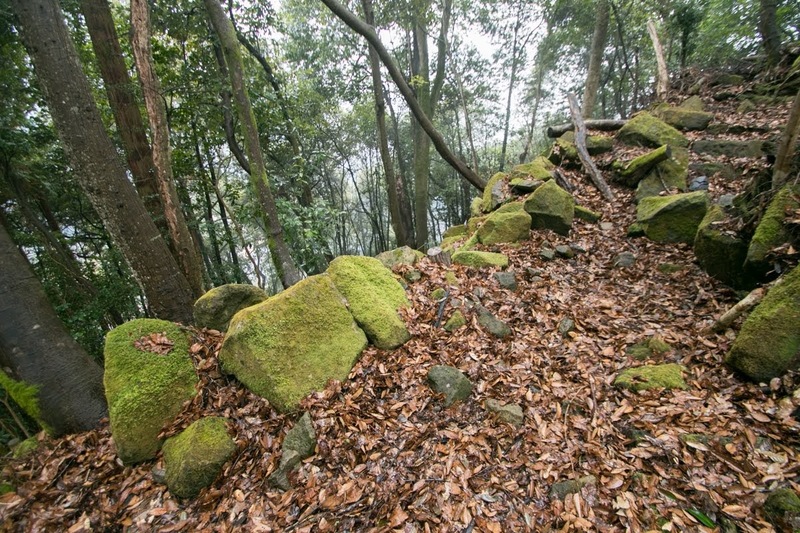 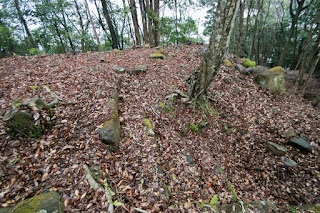 Being located at mountain area and climbing of tough slope is necessary to reach hilltop castle, but prominent remnants of the castle built by each holders deserves to visit. 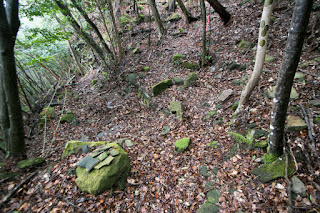 10 minutes walk from Oita Kotsu bus Hitotsudo bus stop on the line between JR West Nakatsu station and Hita station. 30 minutes drive from Higashi Kyushu-do Expressway Nakatsu interchange. 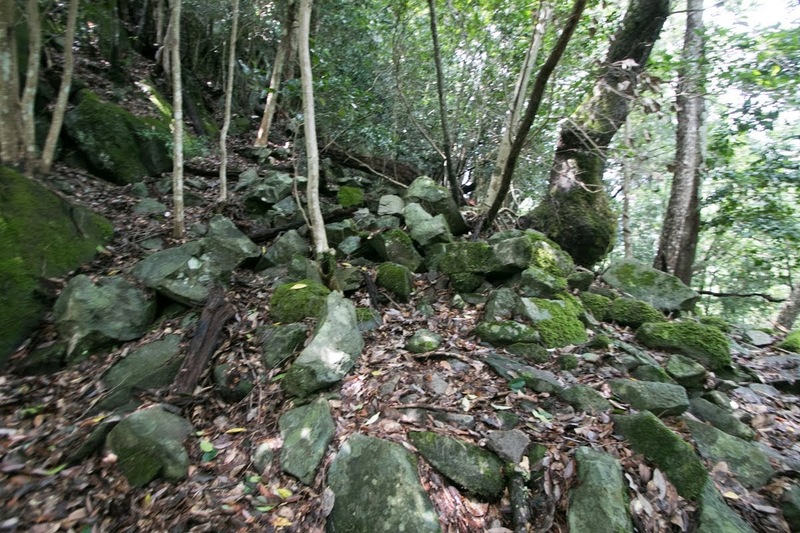 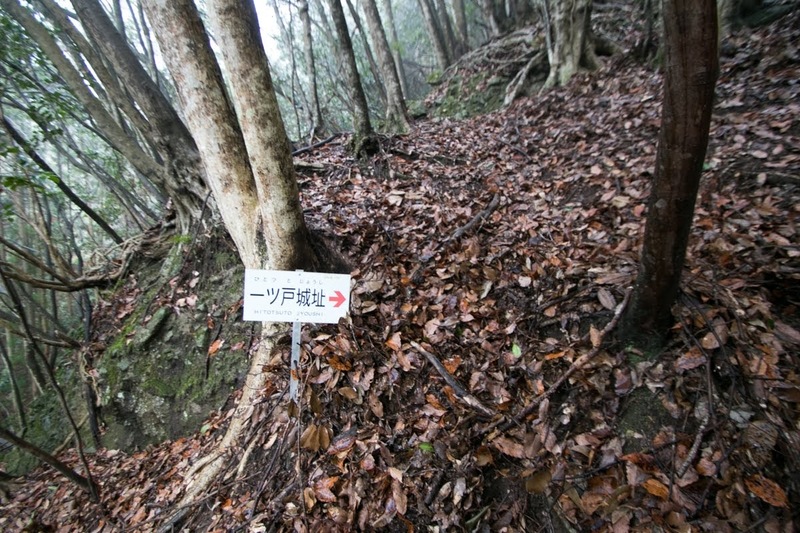 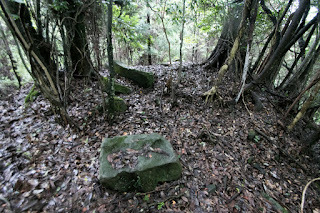 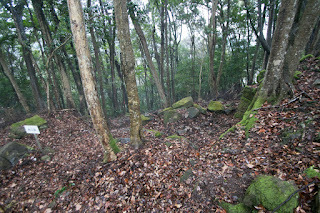 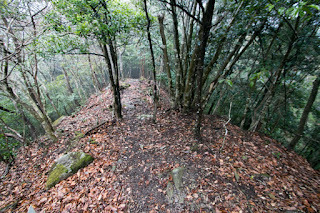 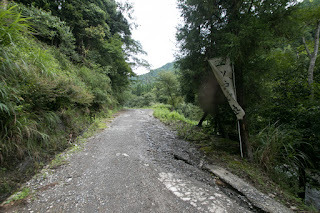 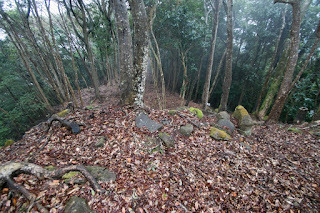 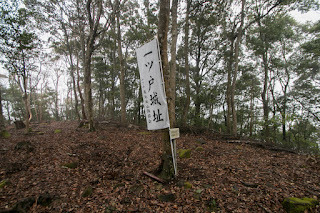 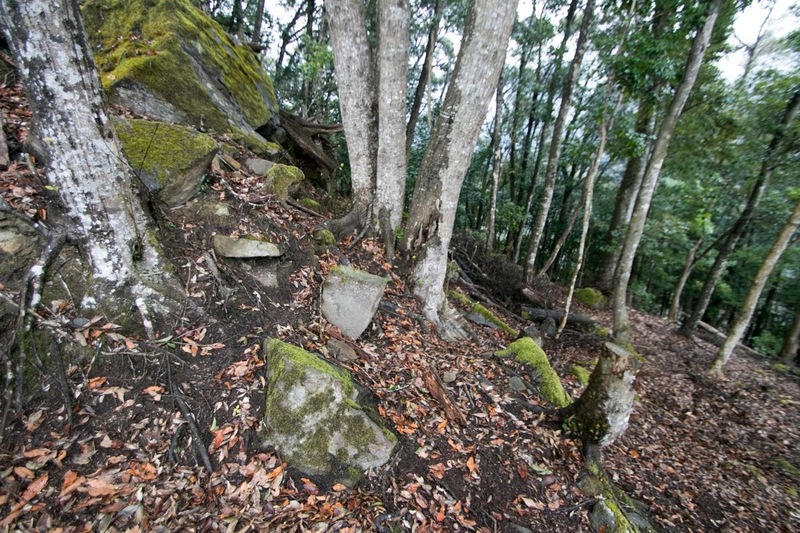 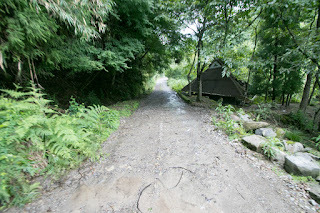 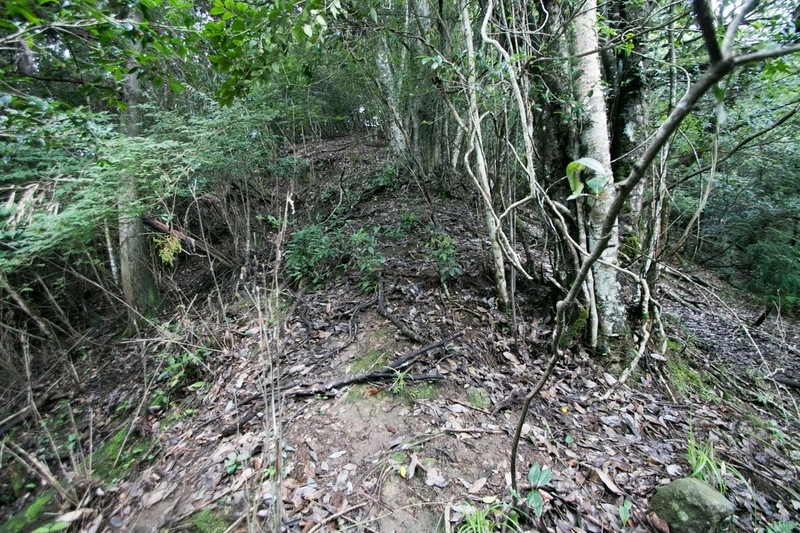 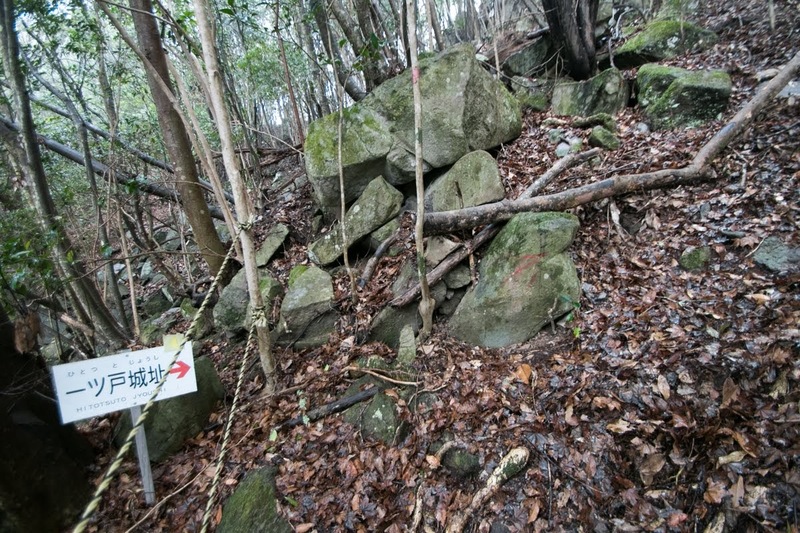 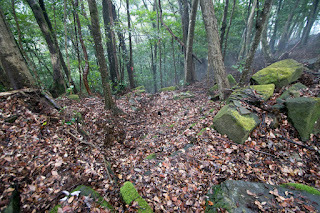 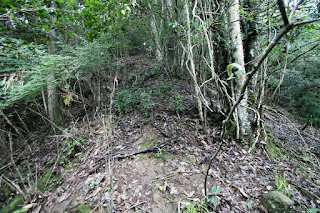 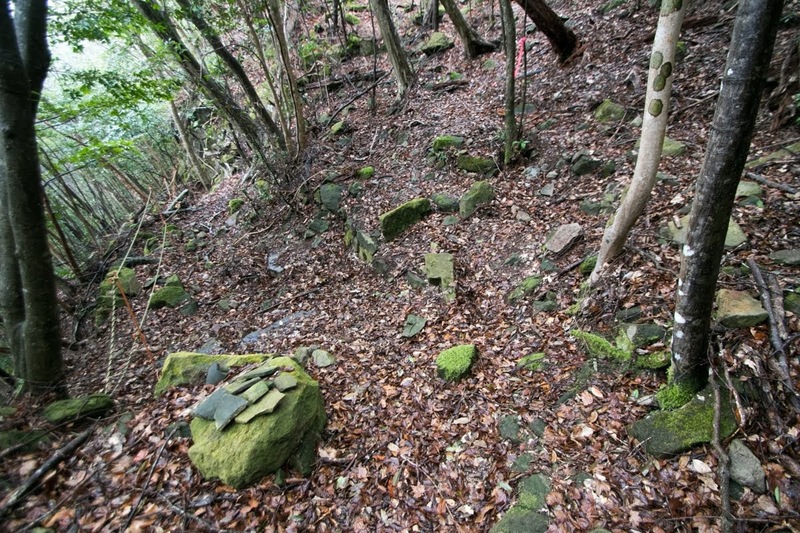 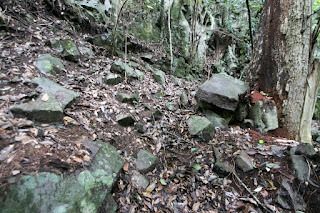 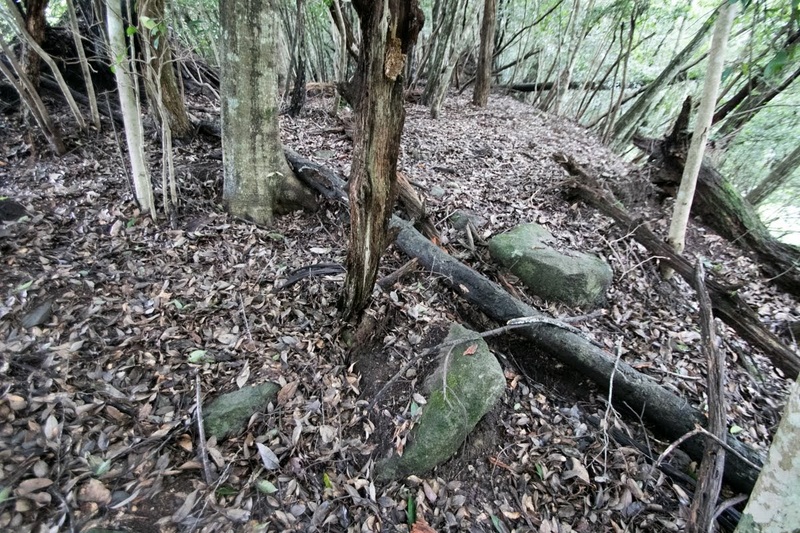 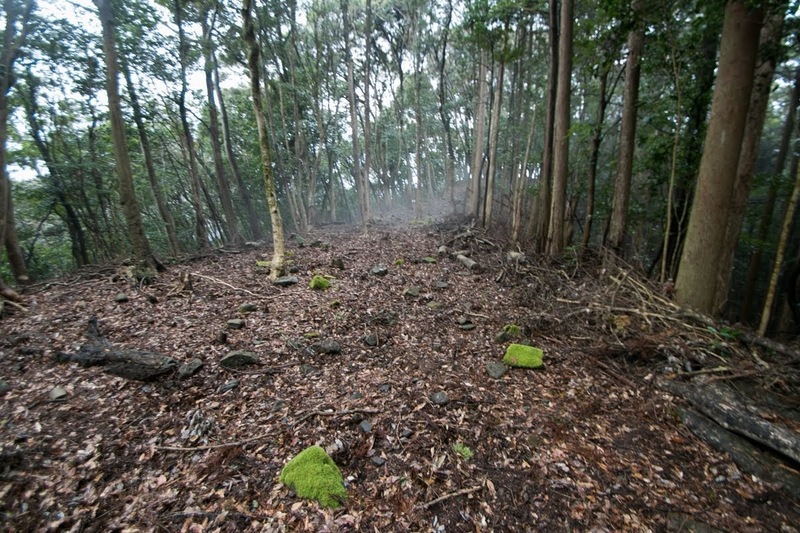 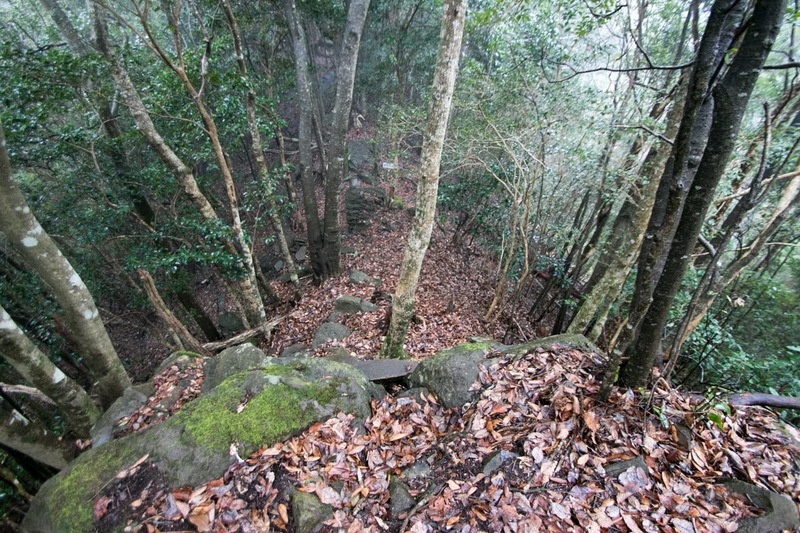 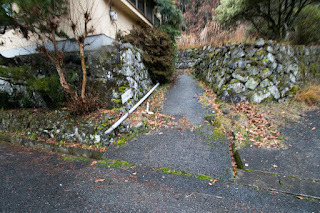 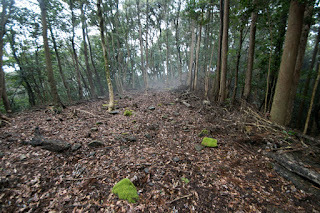 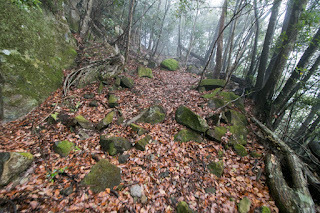 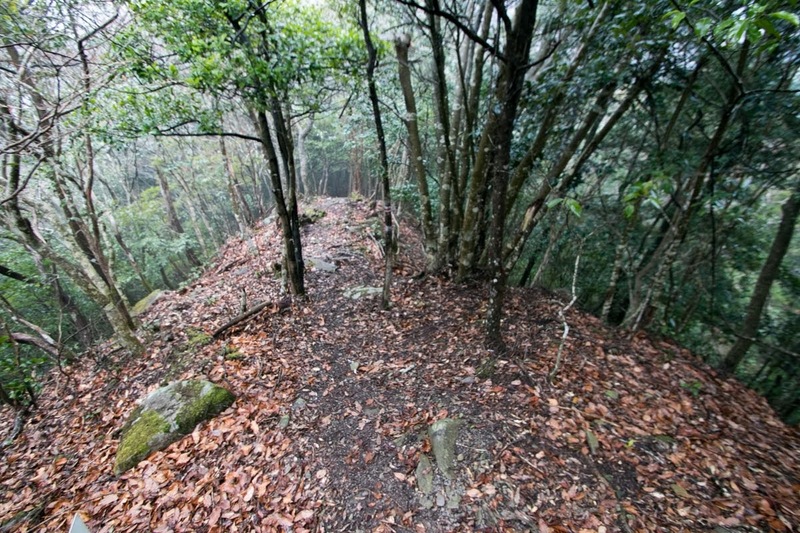 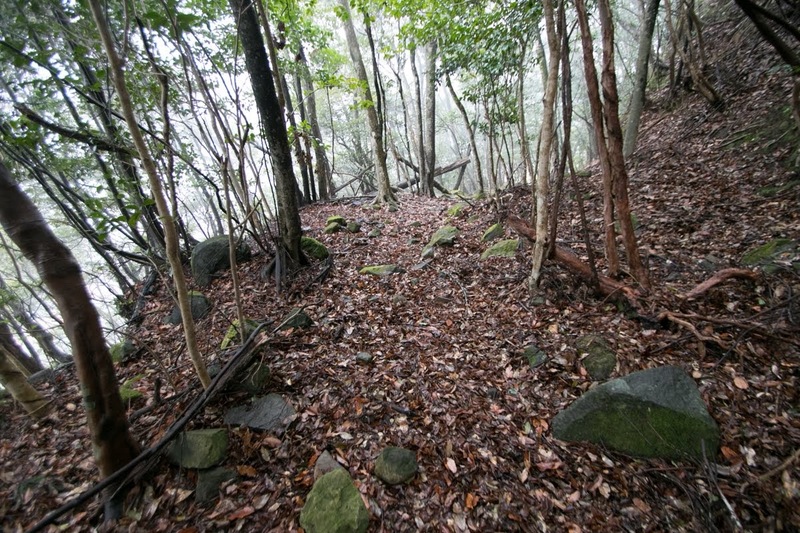 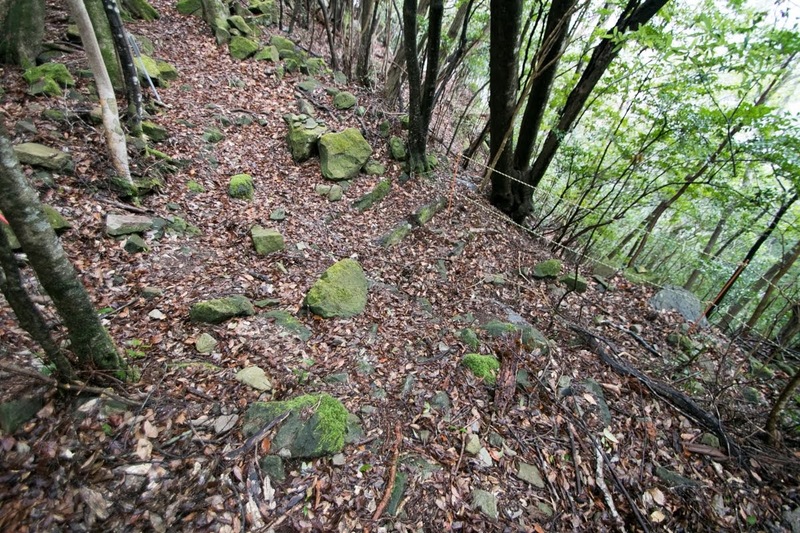 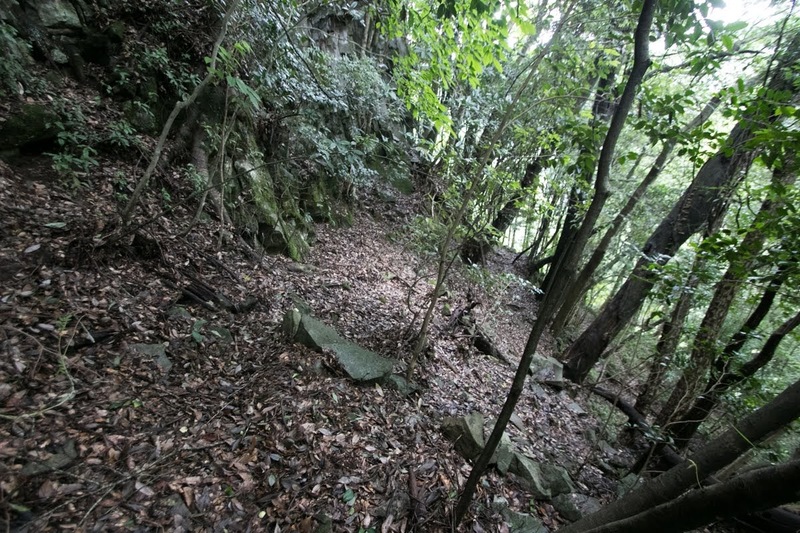 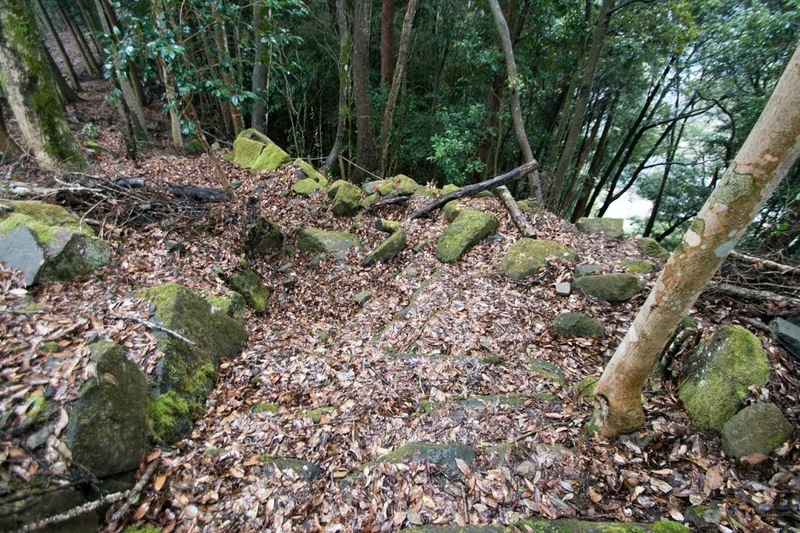 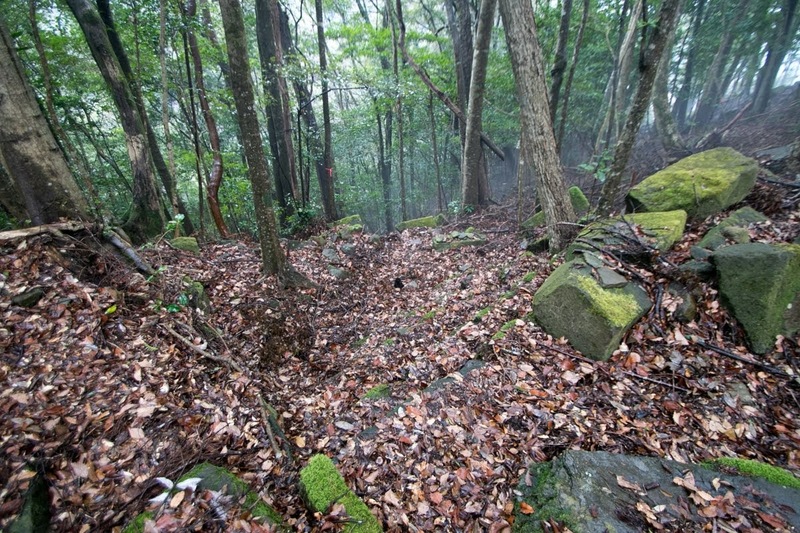 Entrance of climbing road to hilltop area exists at southward of the mountain.